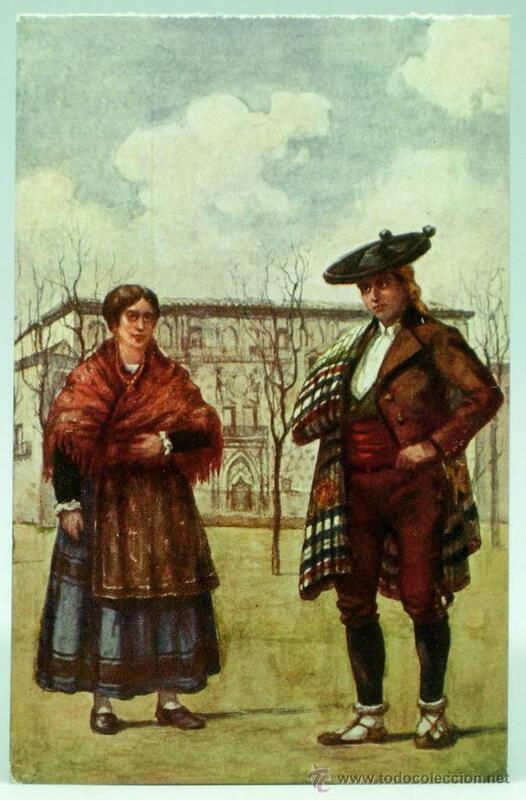 today I will continue my overview of the costumes of Spain. There is less variety of costume in the south, as they have been more recently reconquered. 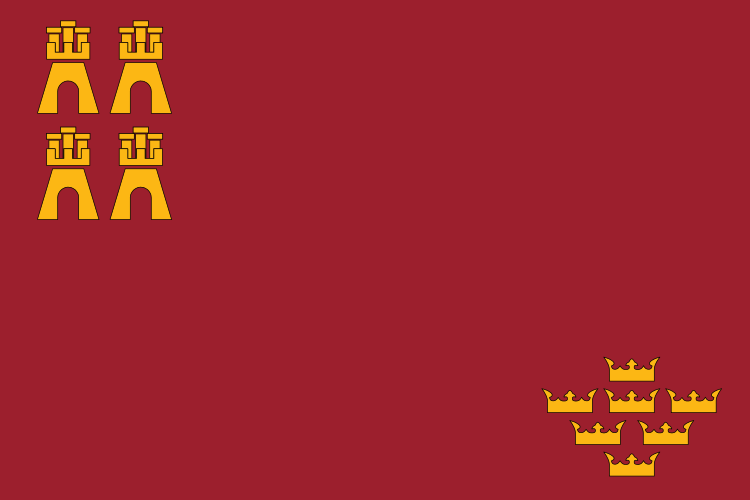 This covers not only the capitol city but the surrounding province. 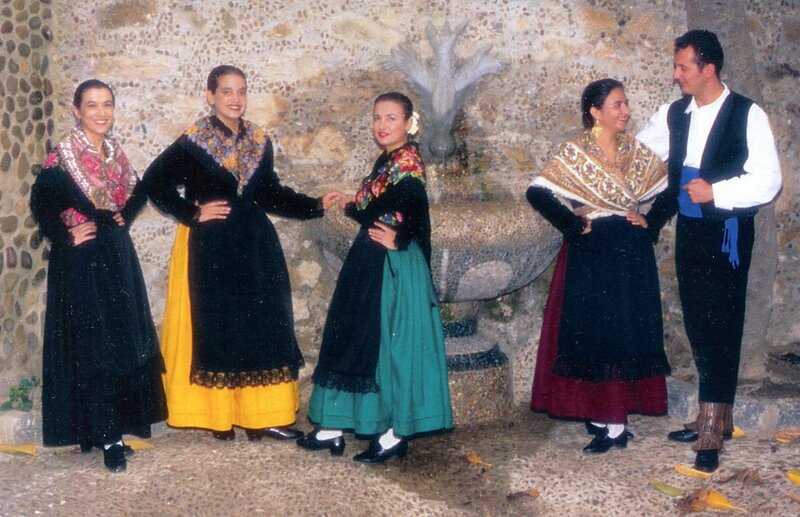 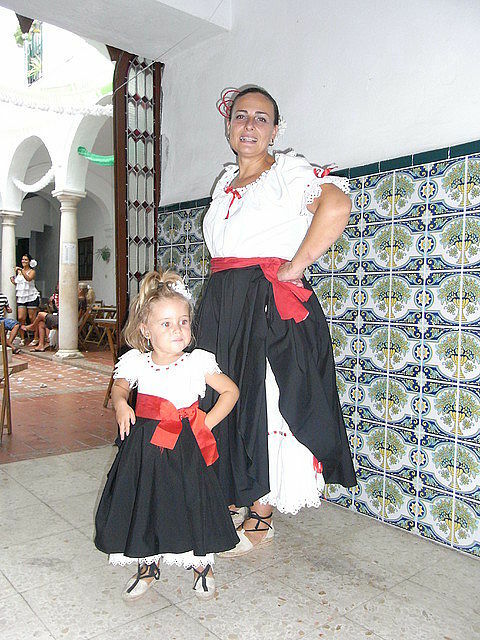 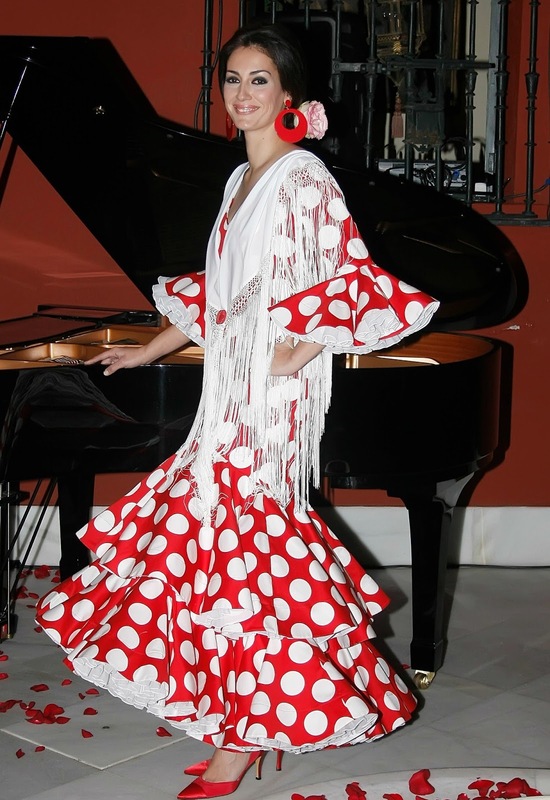 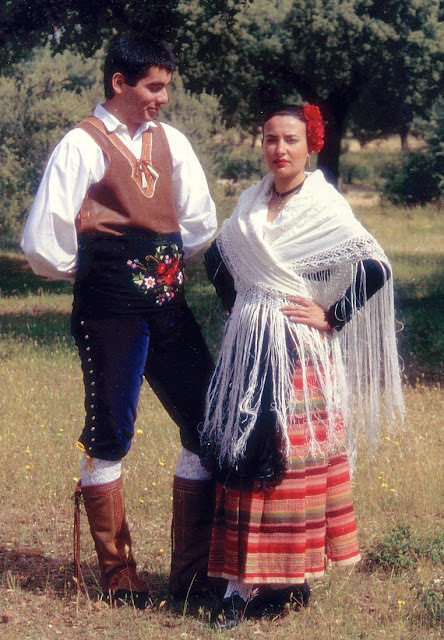 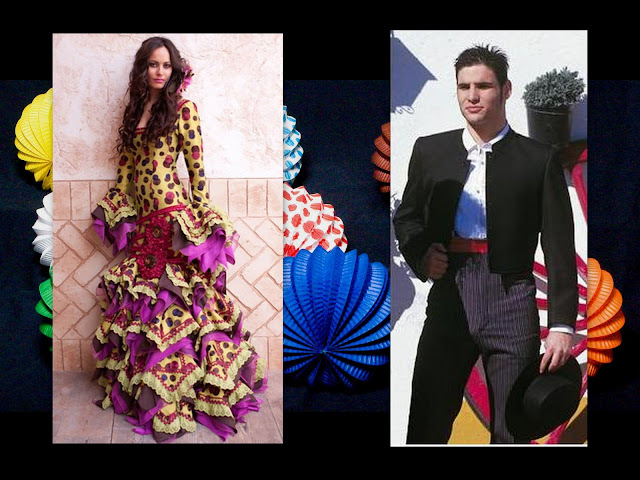 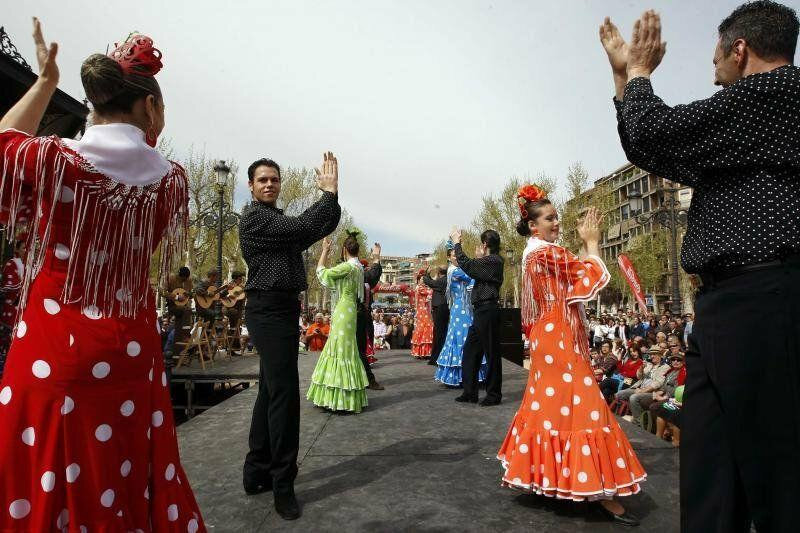 The most commonly used costume is a simplification of the Flamenco costume of Andalusia, but a couple more are also used. 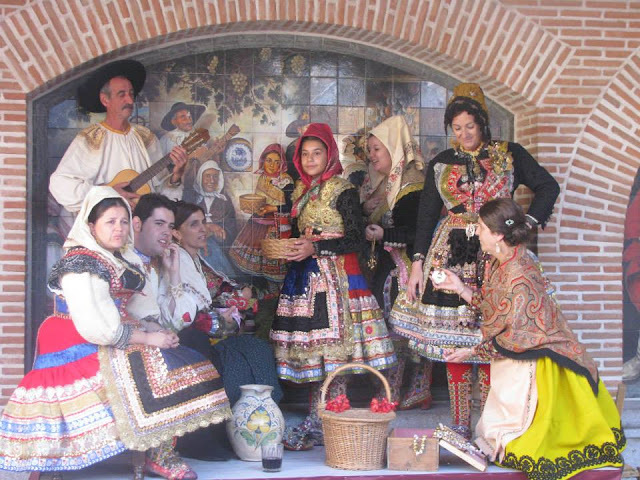 This region is often considered to be the heart of Spain. 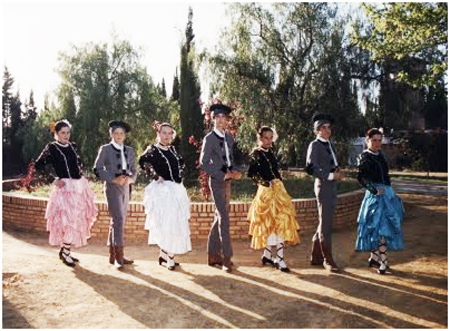 It includes the location of the famous adventures of Don Quixote, 'Lord of la Mancha'. It consists of the provinces of Guadalajara, Toledo, Cuenca, Ciudad Real, and currently also Albacete, which was formerly part of Murcia. 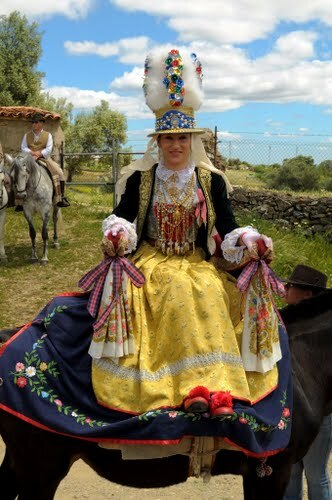 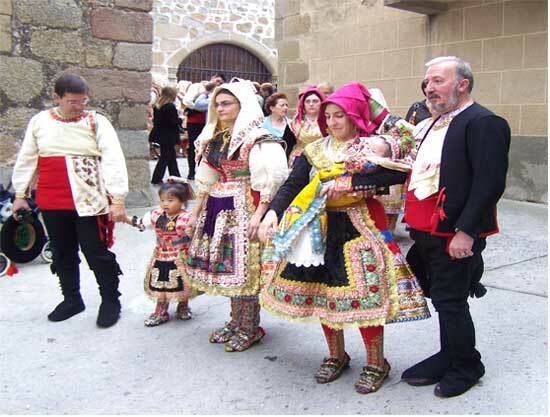 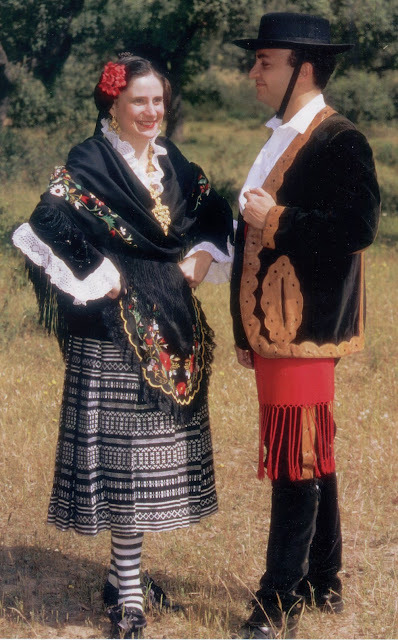 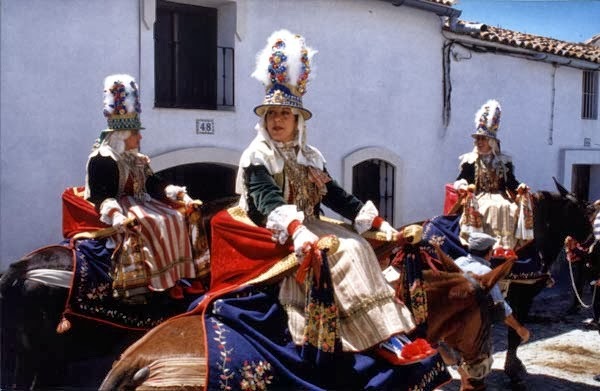 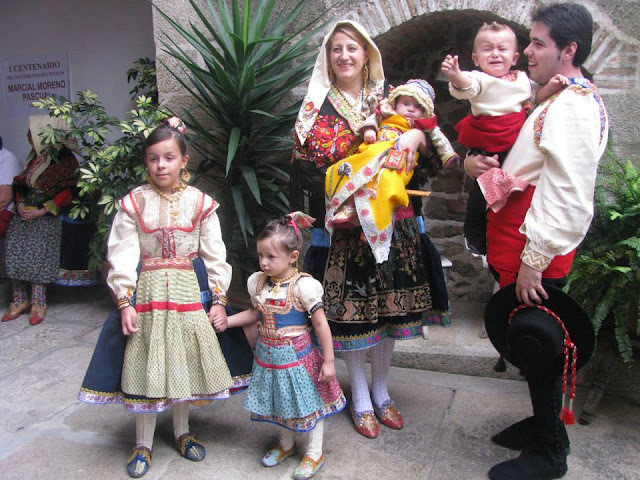 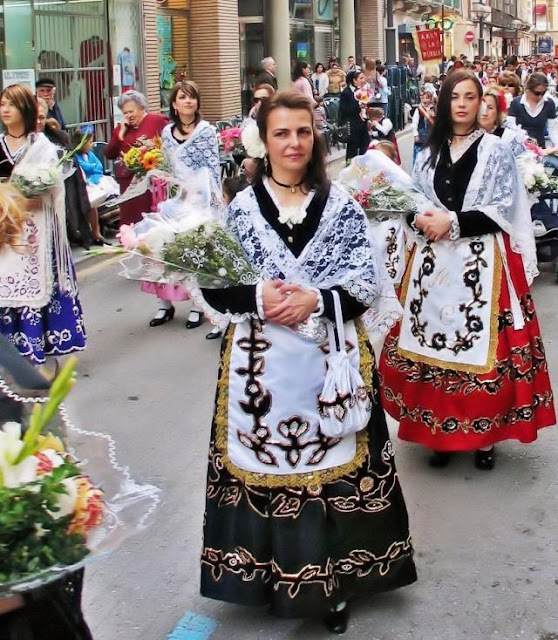 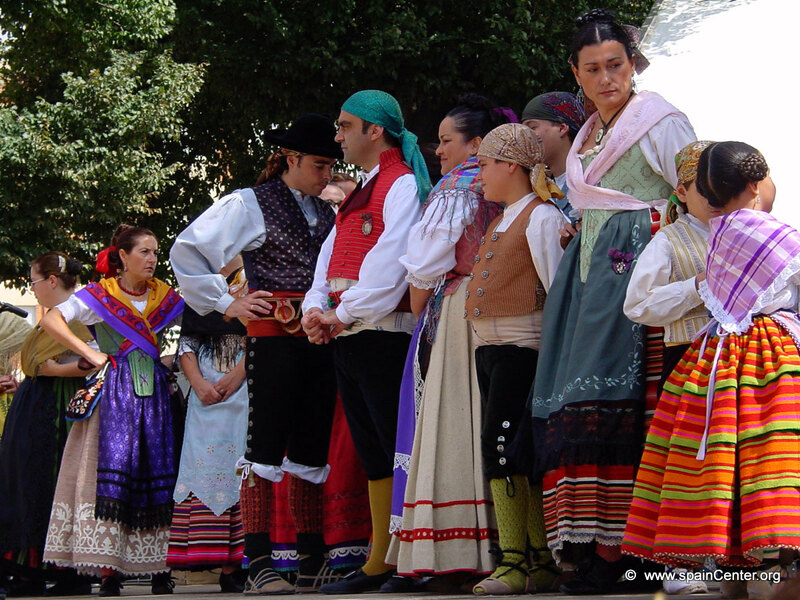 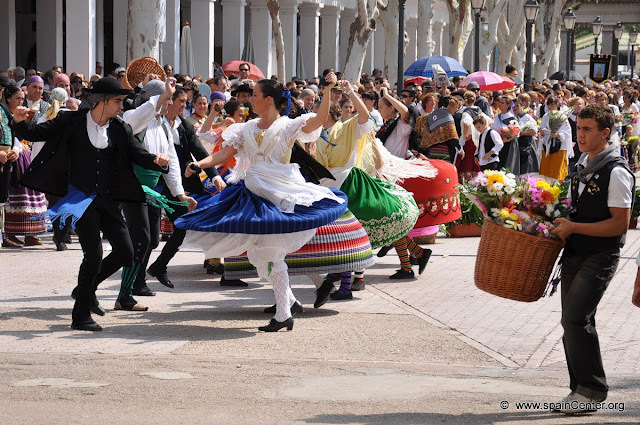 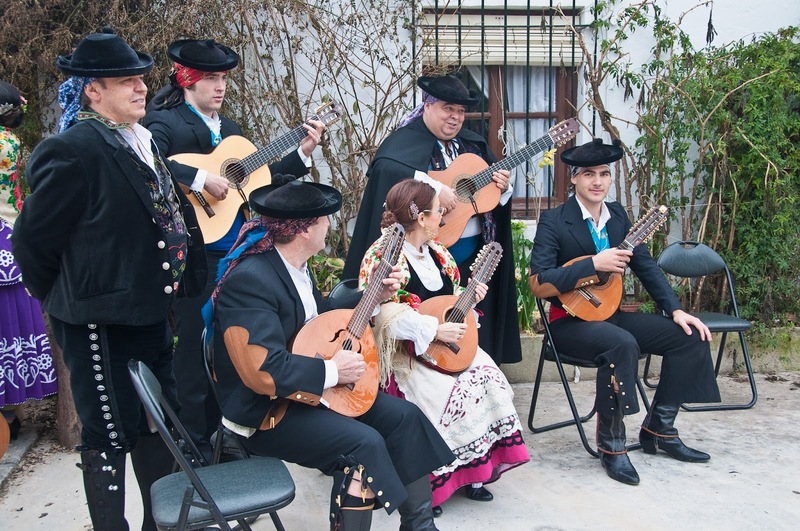 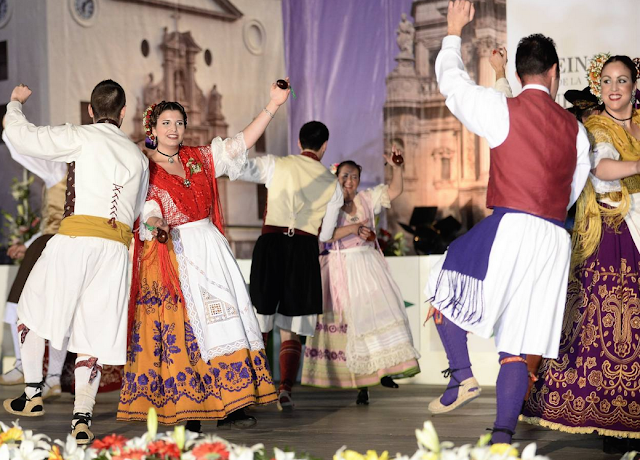 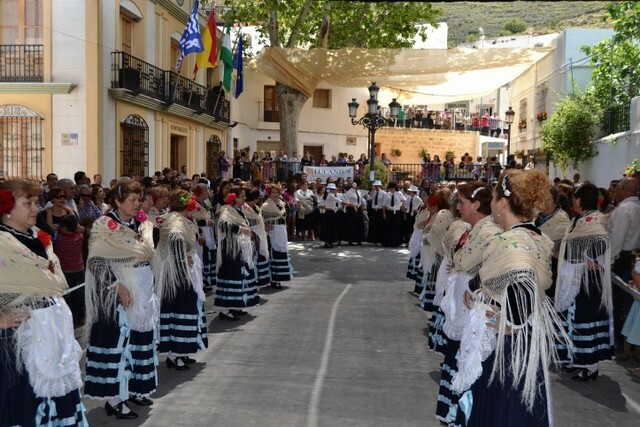 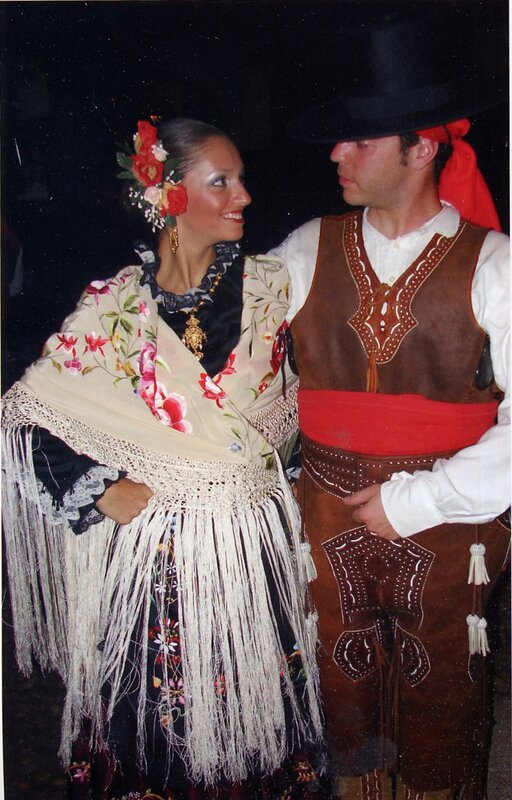 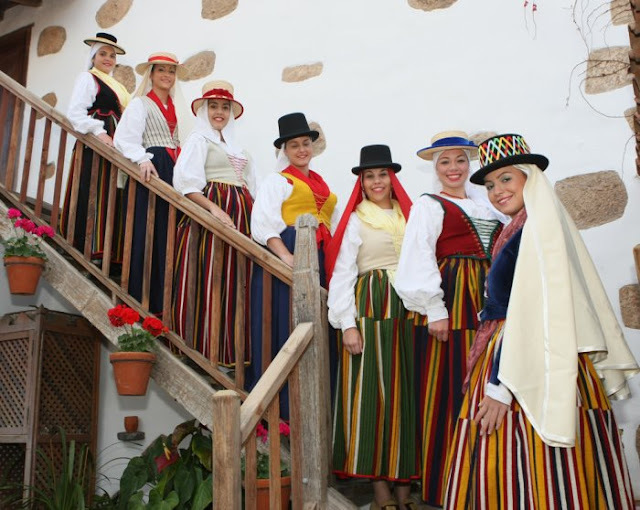 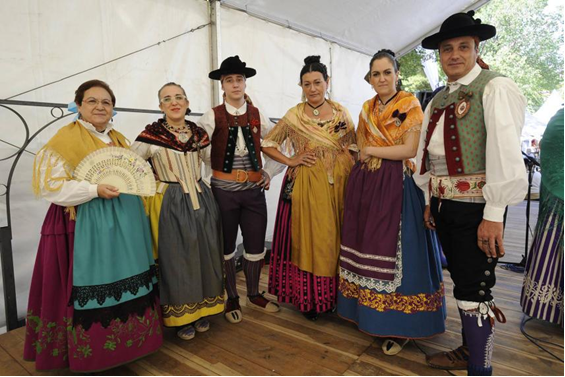 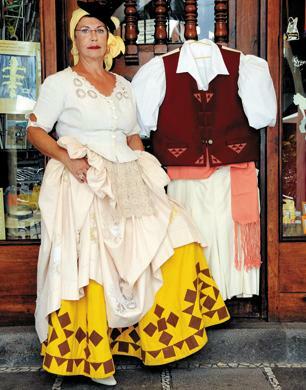 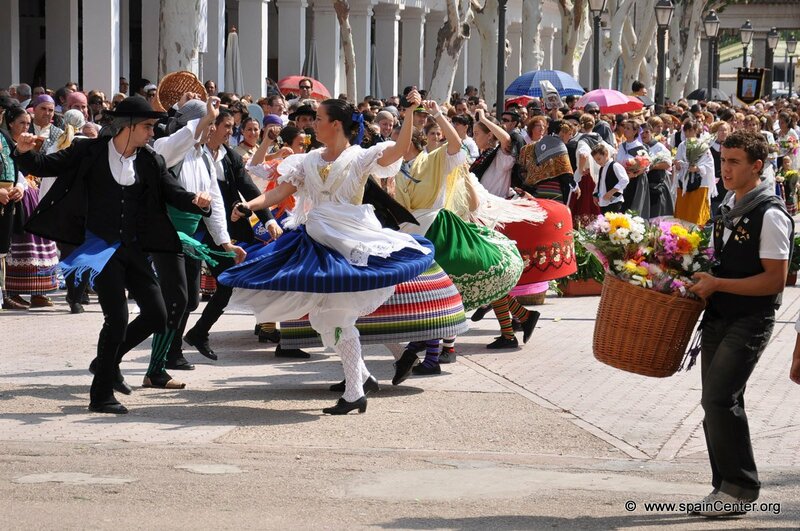 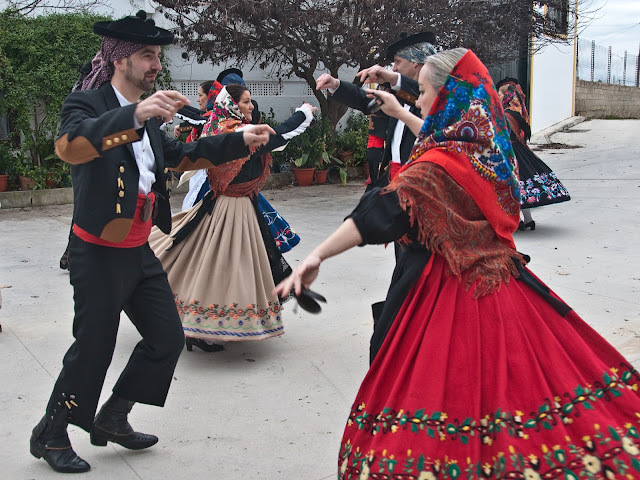 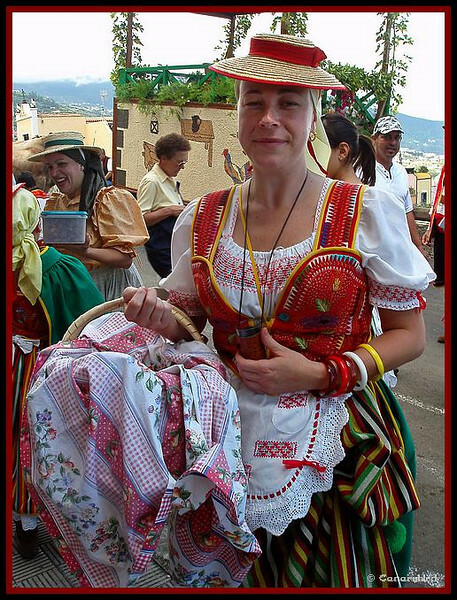 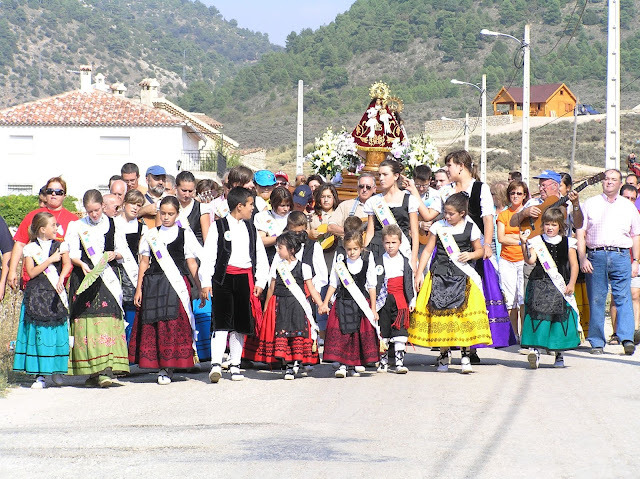 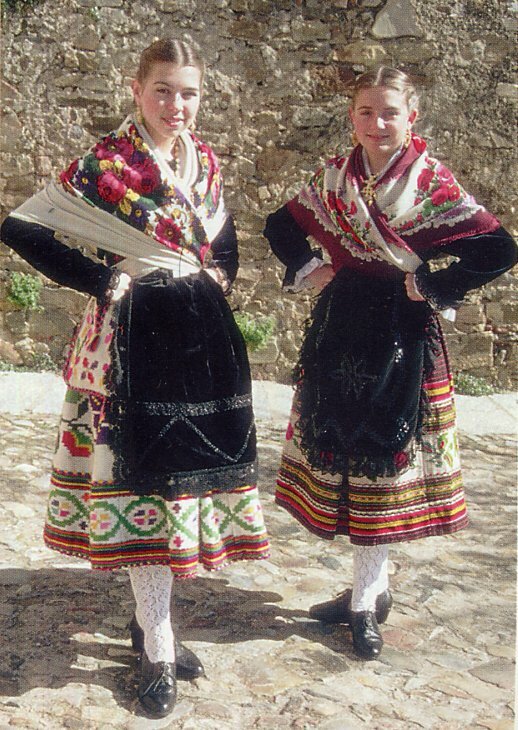 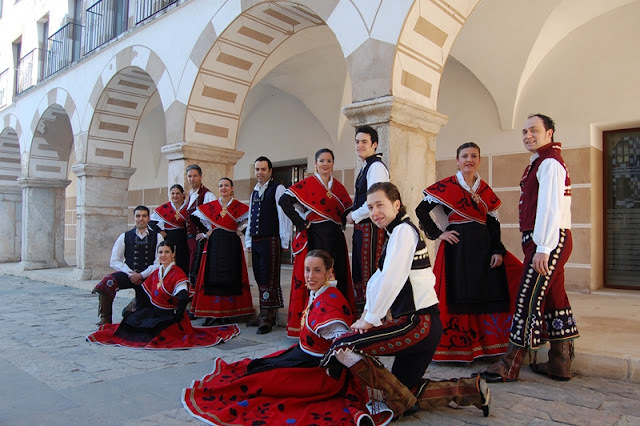 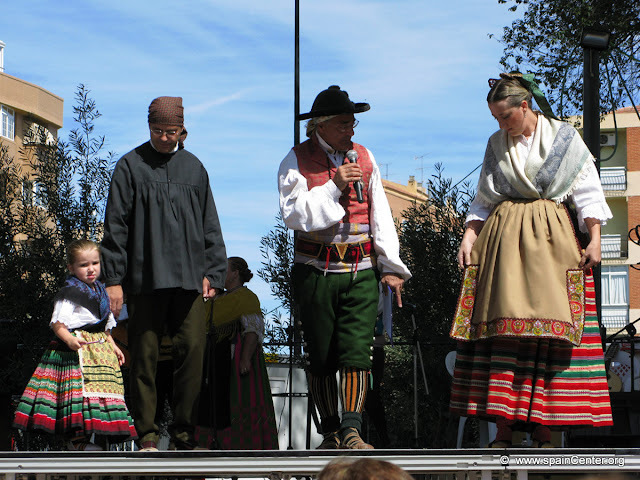 This region is little known outside of Spain but is very rich in costumes and folk culture. There is an indigenous language known as Extremaduran which is spoken by some hundreds of thousands of people in the western fringe of the territory. 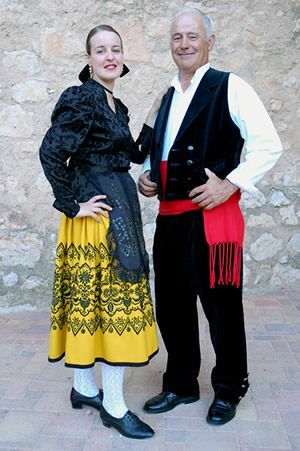 This language is endangered. 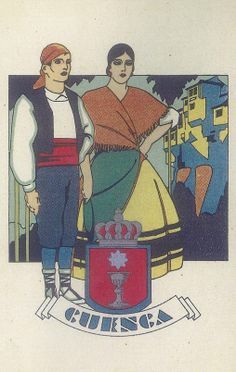 Fala, a language related to Portuguese and Galego is spoken in the valley of Jalama. 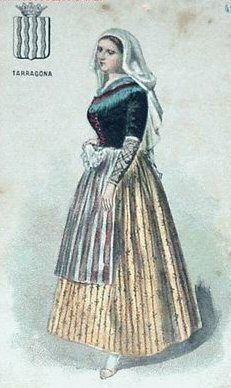 It is quite vigorous and commonly used within its territory. 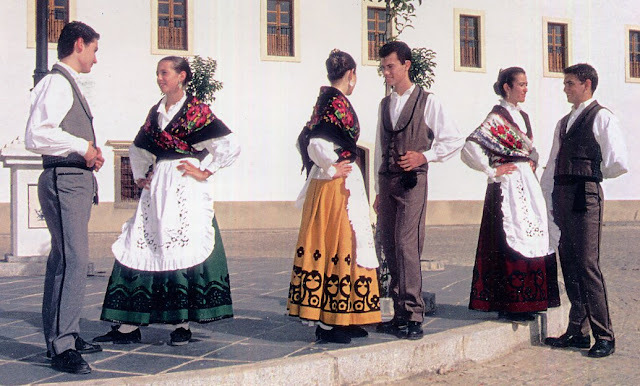 There are also a handful of municipalities along the border which speak various dialects of Portuguese. 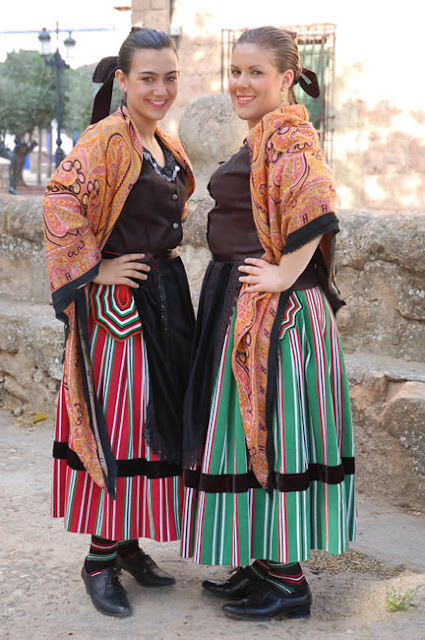 This region is divided into two provinces. 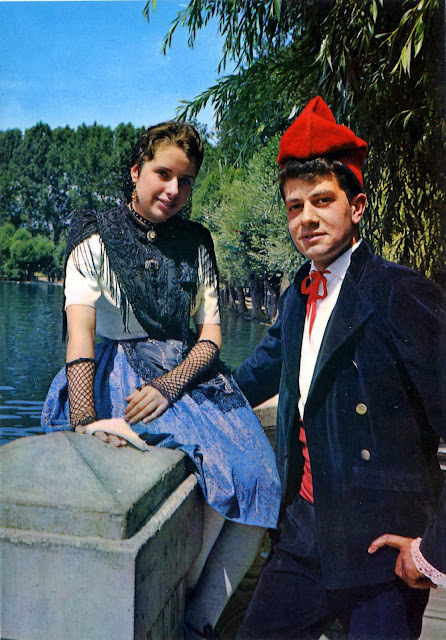 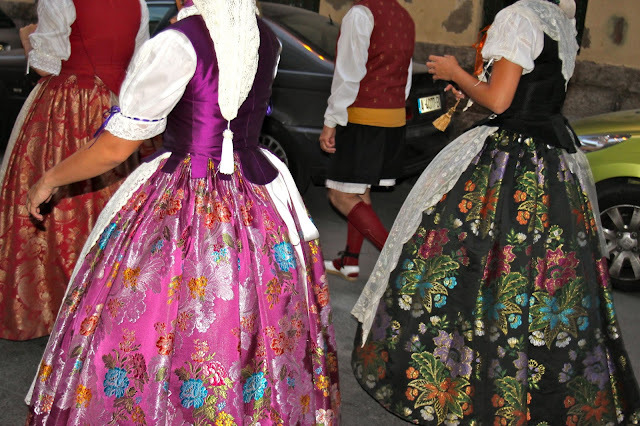 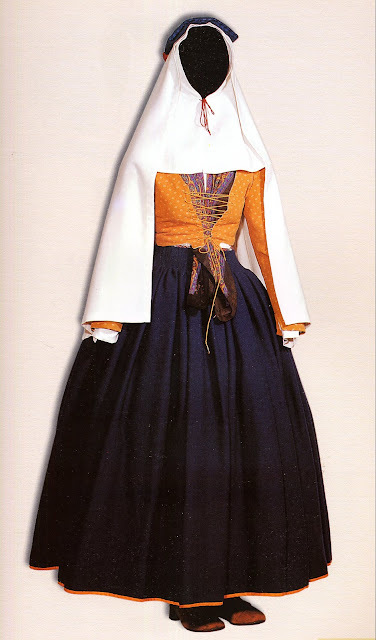 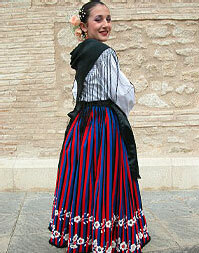 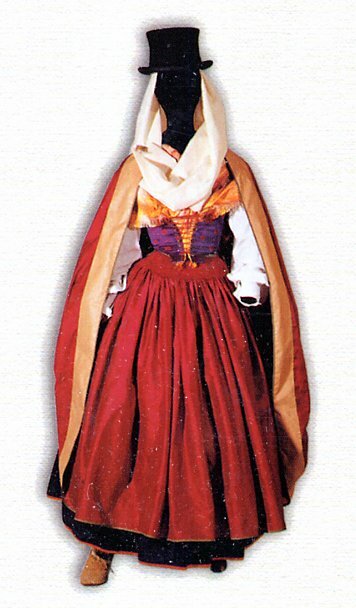 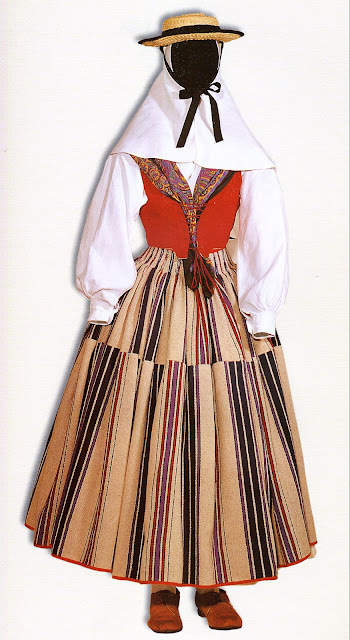 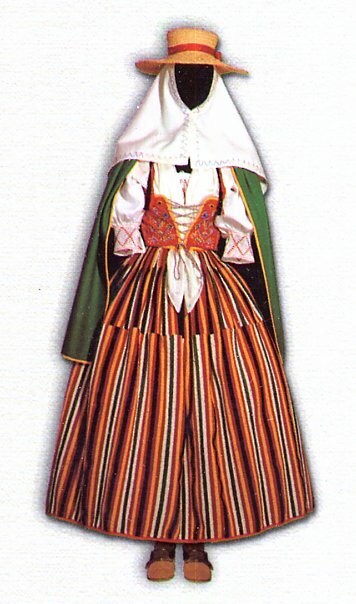 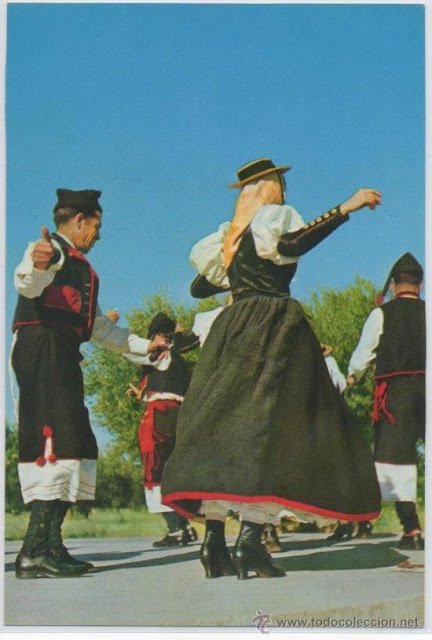 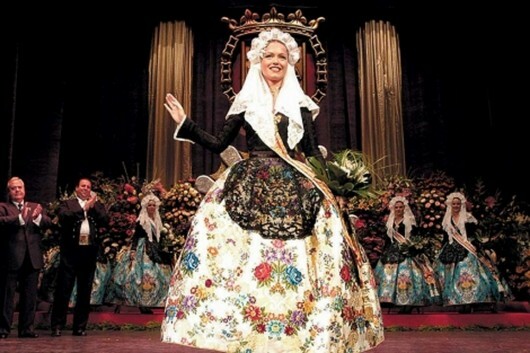 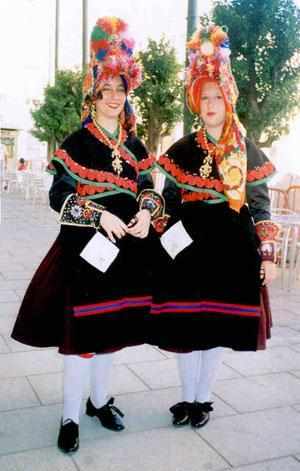 The most famous costume of this province is that of Montehermoso. 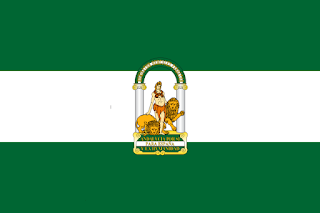 Andalusia is in many ways the least typical Spanish region, as it was the last to rejoin Spain in the process of reconquering. 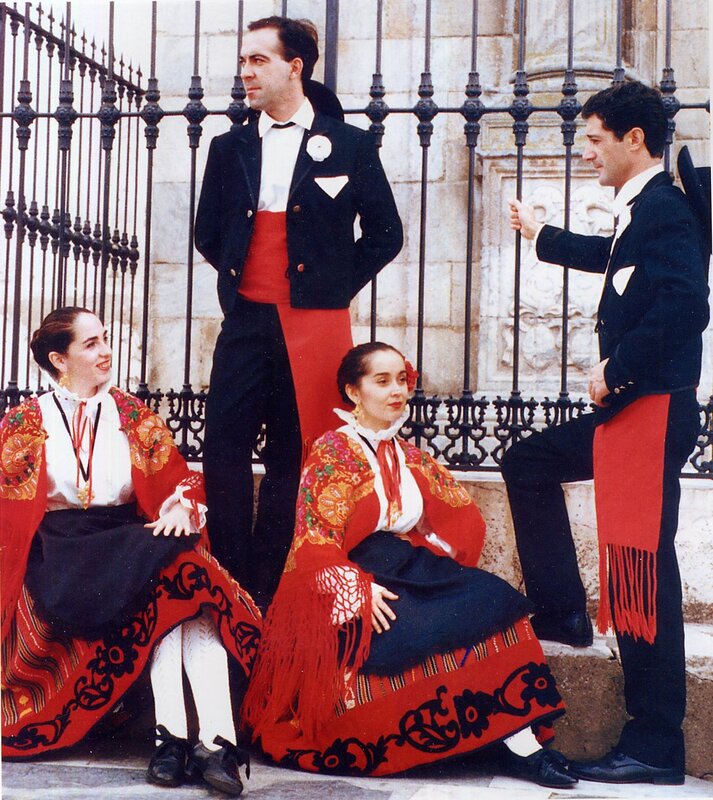 On the other hand, much of its culture is often taken to be absolutely emblematic of Spain as a whole, being the land of flamenco and the center of bullfighting. 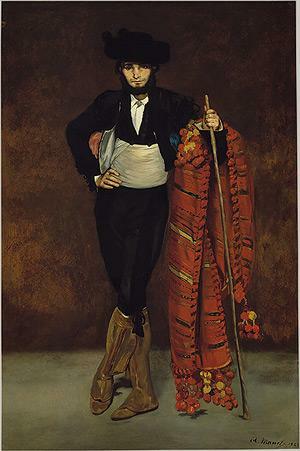 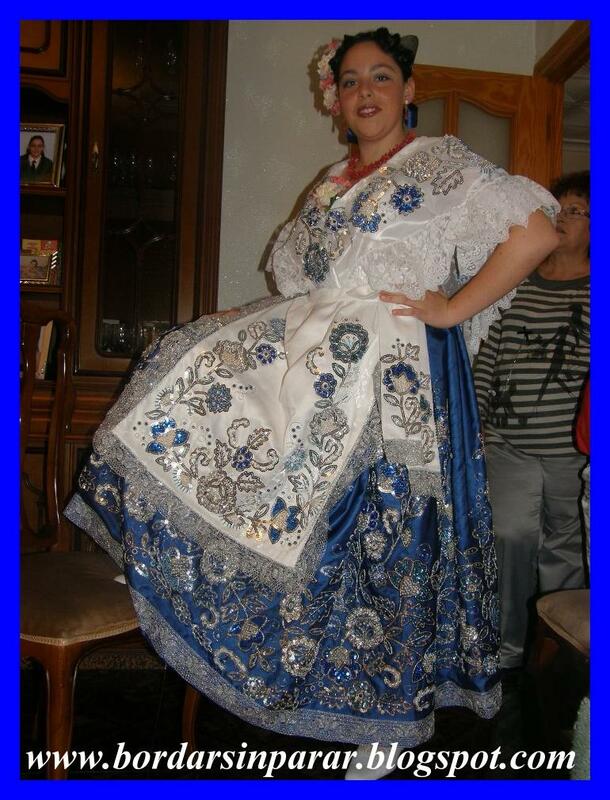 Nowhere is this more true than of folk costume, compare flamenco dress to that of the rest of Spain. 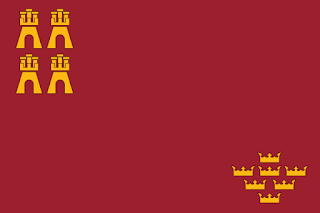 The name is often said to be Arabic, but that is somewhat misleading, as the name 'Al Andalus' in Arabic means 'land of the Vandals', hearkening back to the name of one of the original tribes. 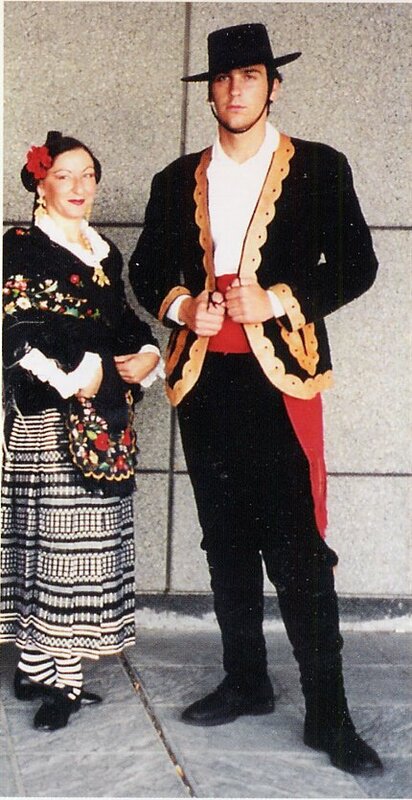 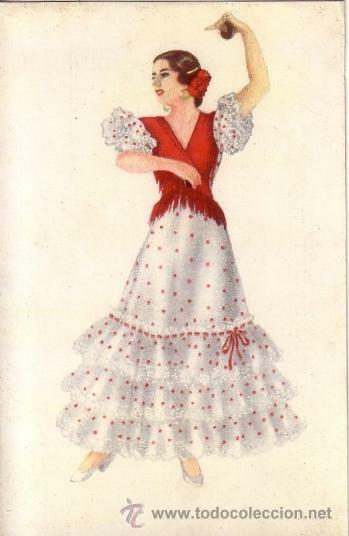 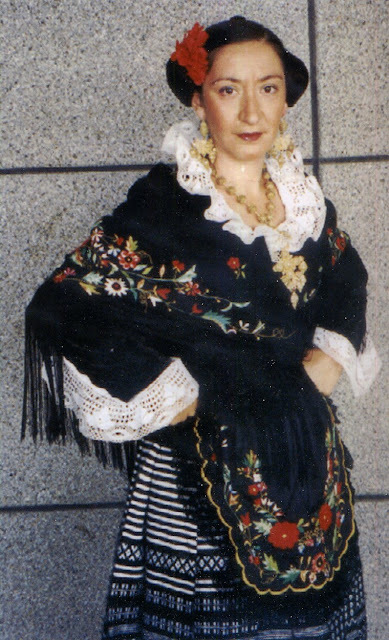 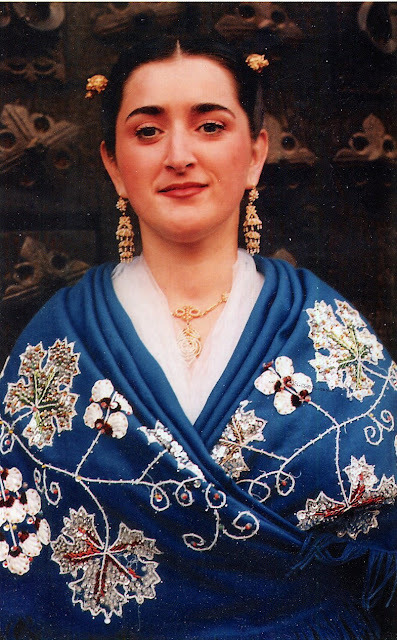 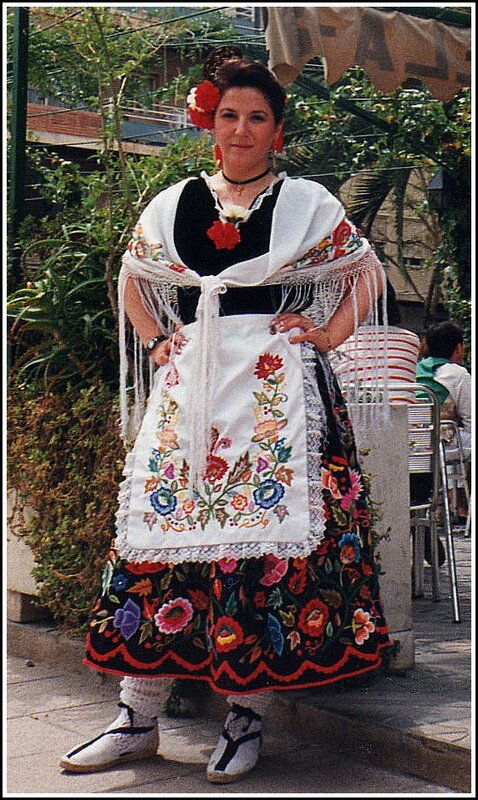 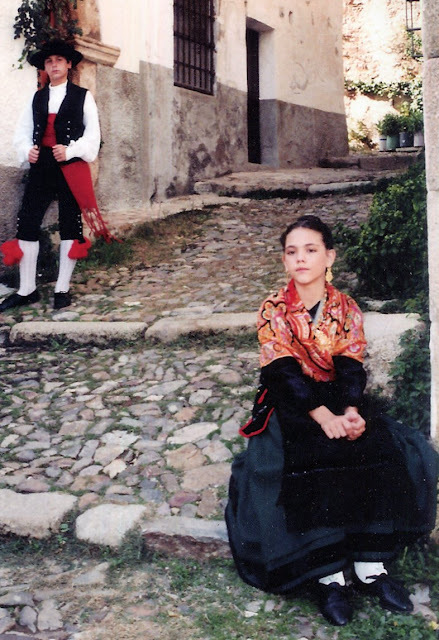 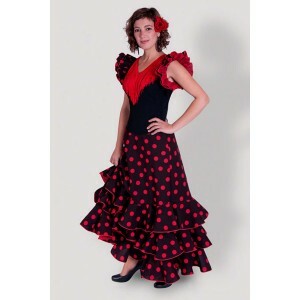 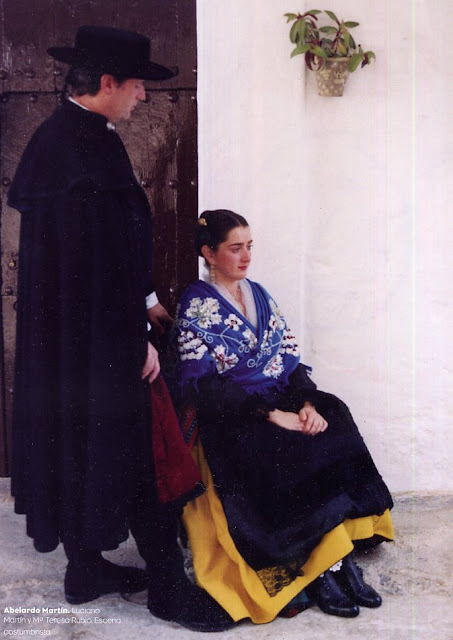 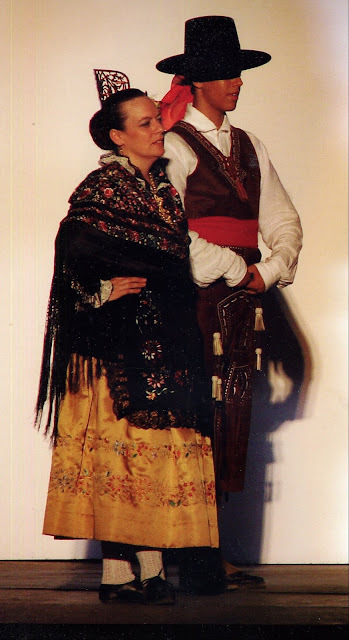 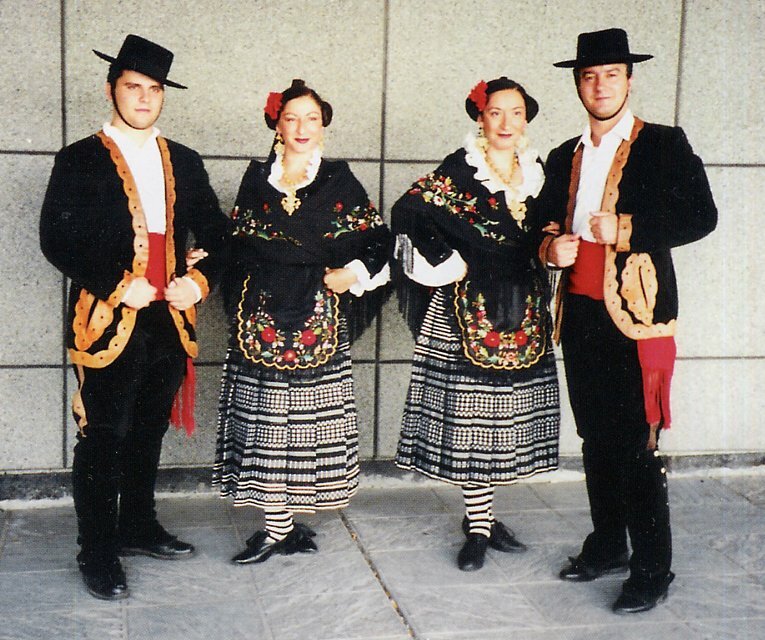 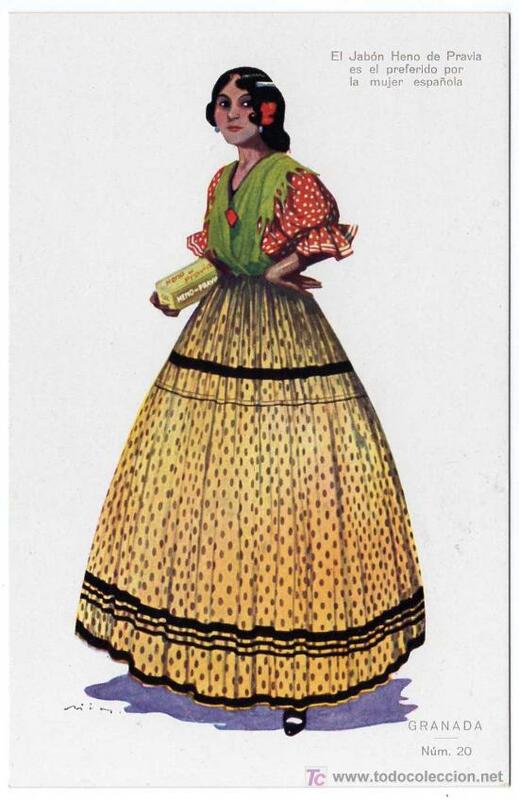 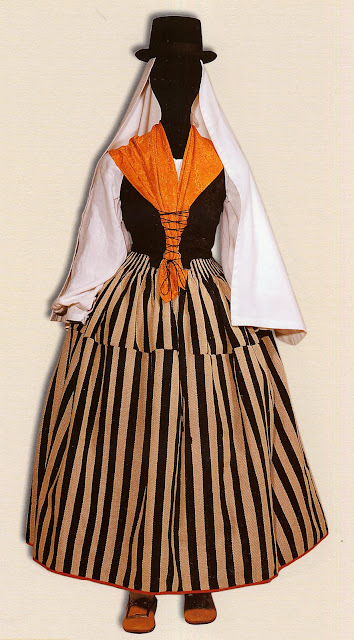 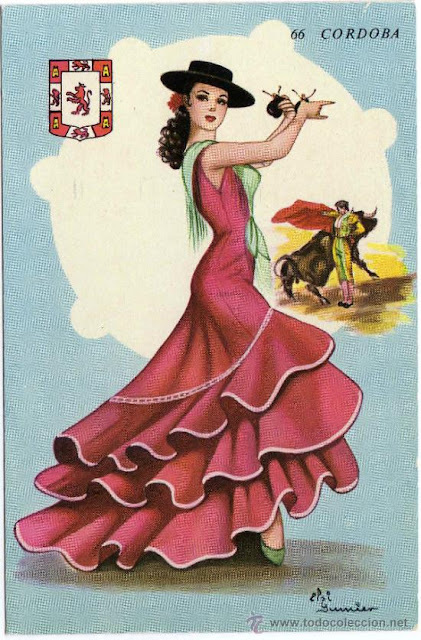 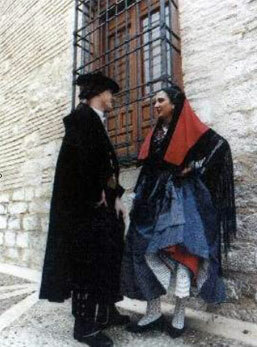 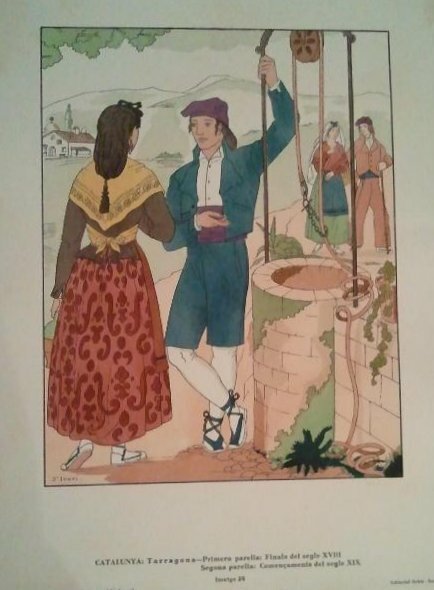 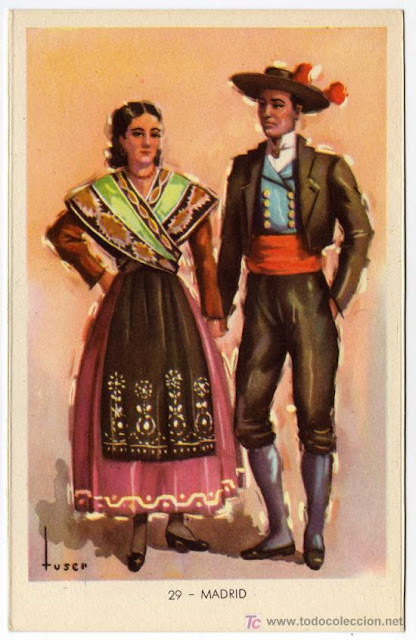 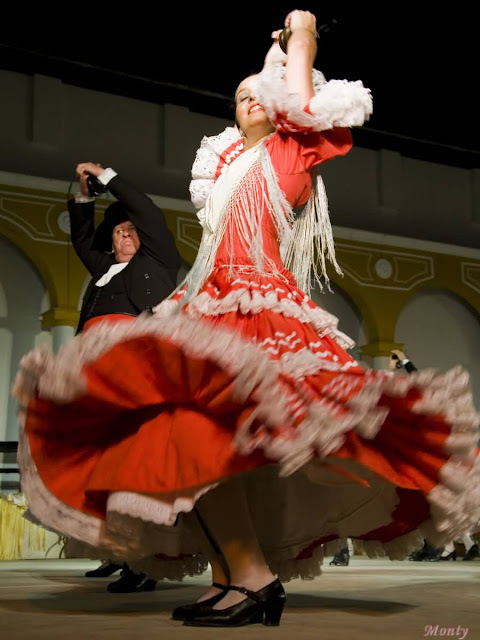 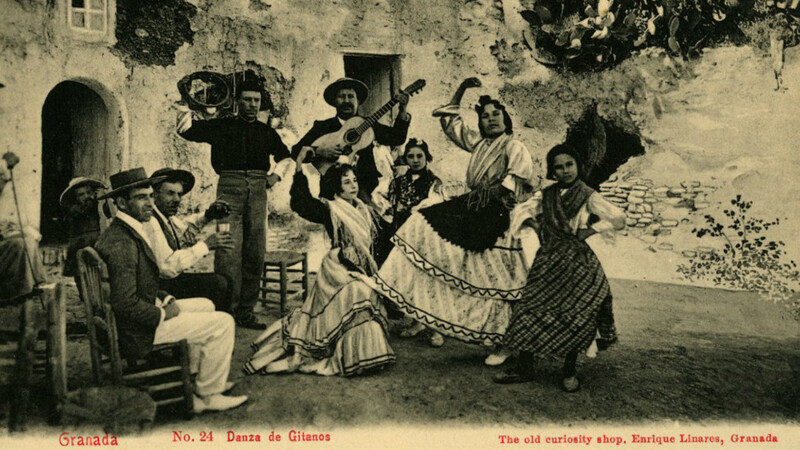 Traje de Gitana, or Flamenco dress. This is considered to be especially emblematic of Seville, but has come to symbolize all of Andalusia, and indeed, all of Spain. 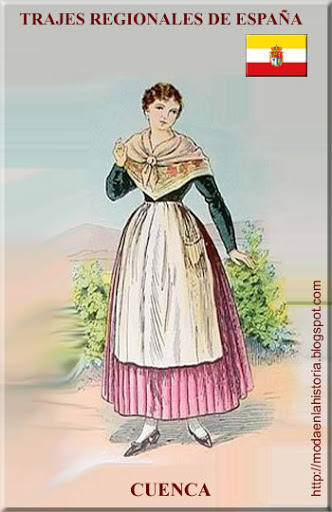 In fact, as you have likely noticed in the course of perusing this article, it is not at all typical. 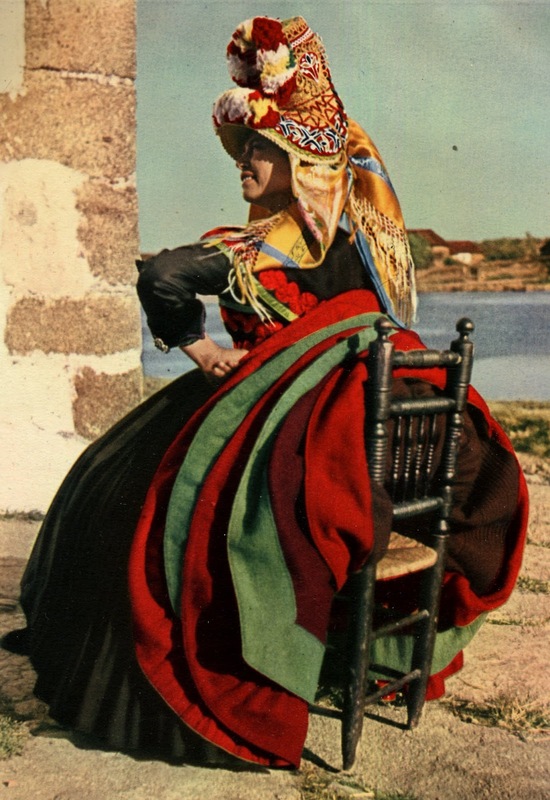 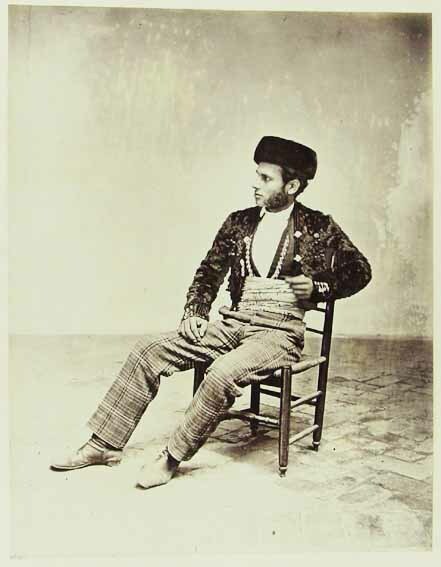 This costume, like flamenco music and dance itself, was borrowed from the Romany [Gypsies, or Gitani] who live in Andalusia. 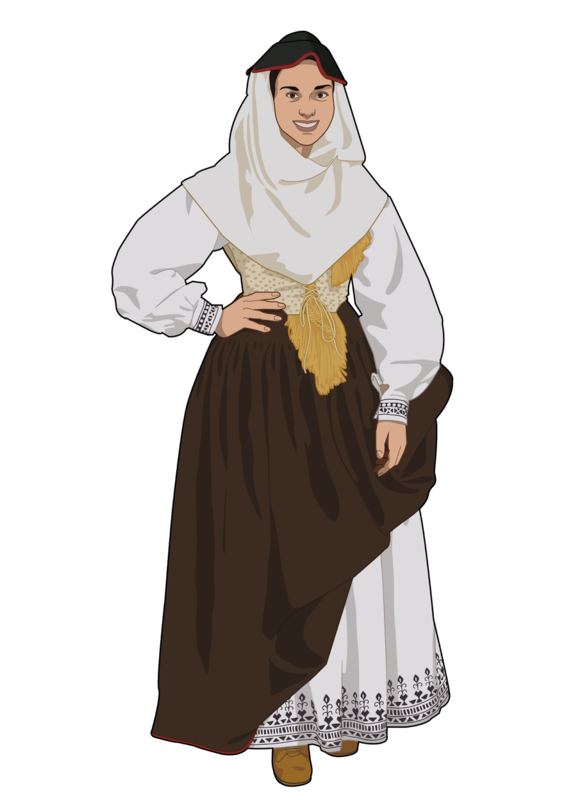 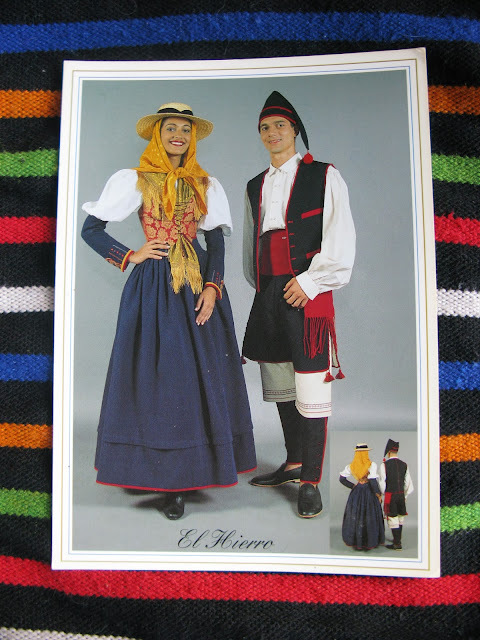 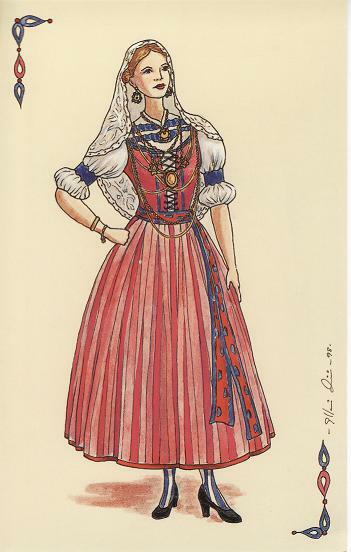 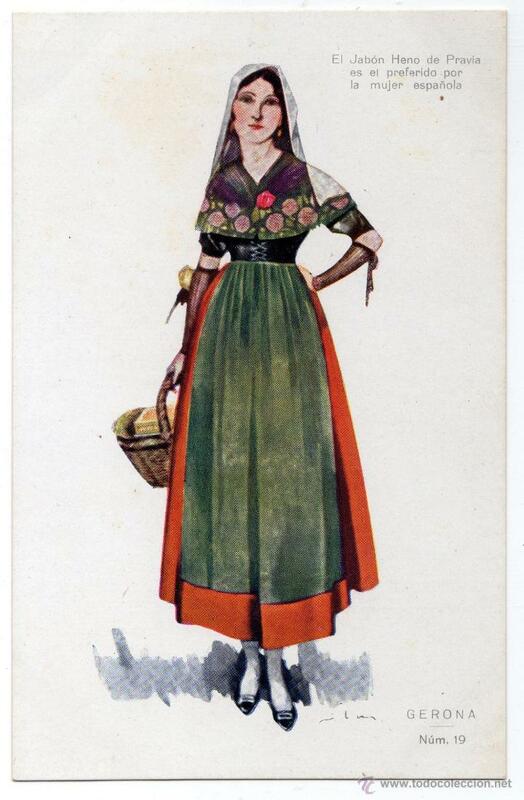 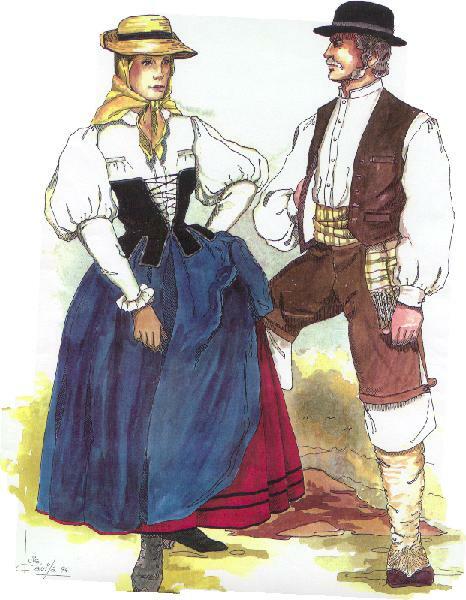 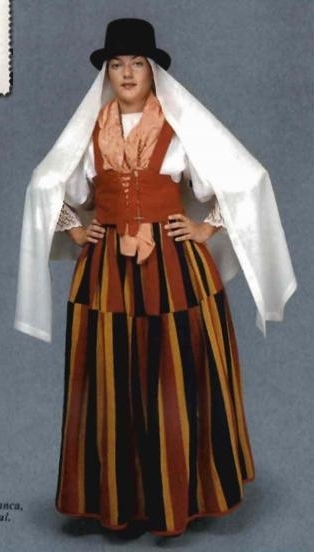 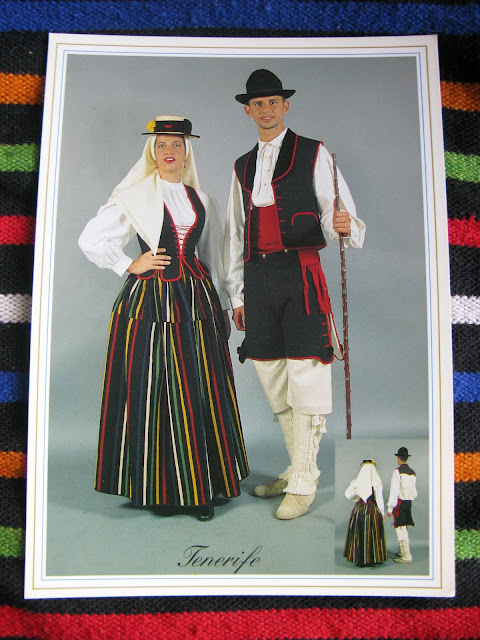 On the other hand, the Romany do not dress like this anywhere else. 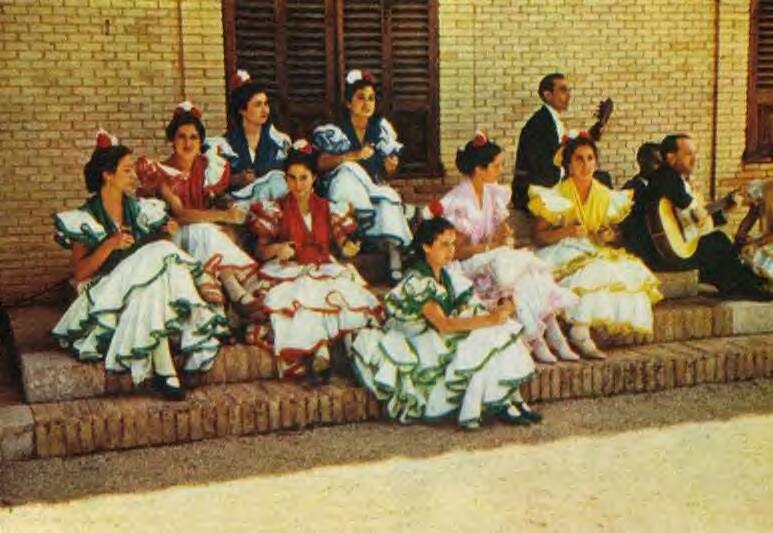 In some modern interpretations of flamenco dress, the upper part of the skirt has been tightened to the dimensions of the sheath dress of the 1950's. 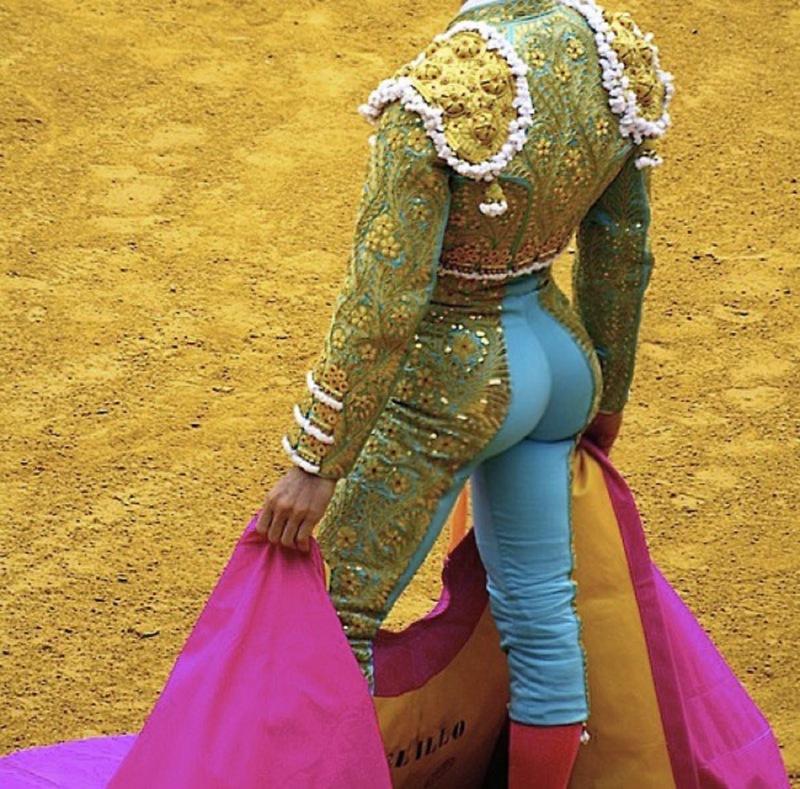 Im sorry, but I think this looks cheap. 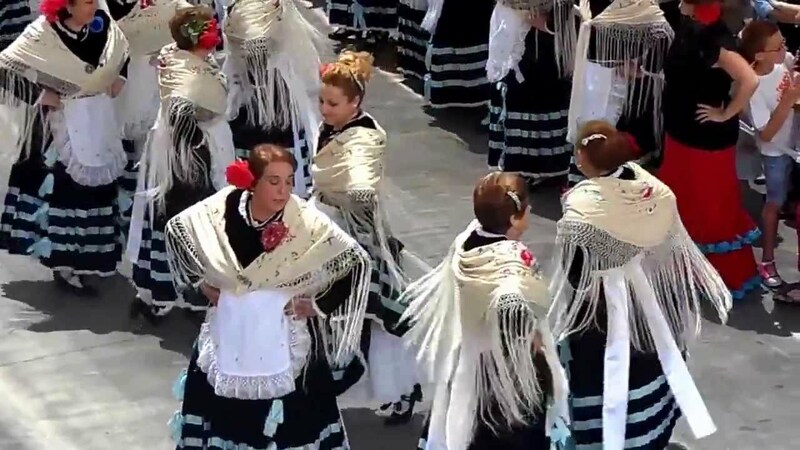 A video of Flamenco being perfomed. 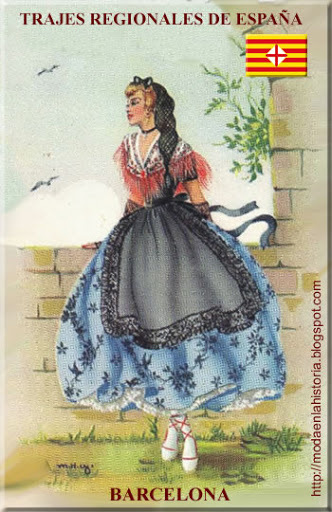 The male equivalent was the 'traje de majo'. 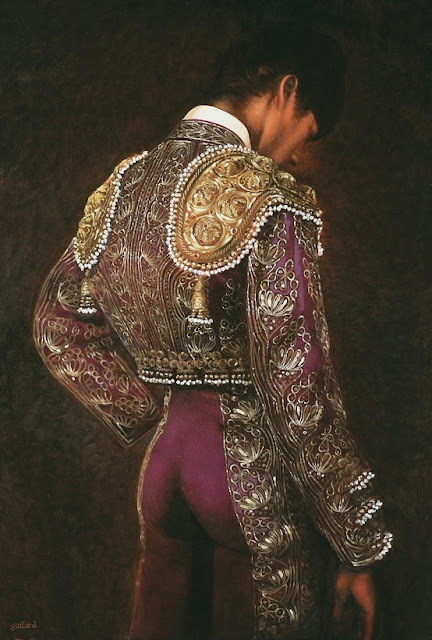 This has developed into the contemporary dress of the Torero. 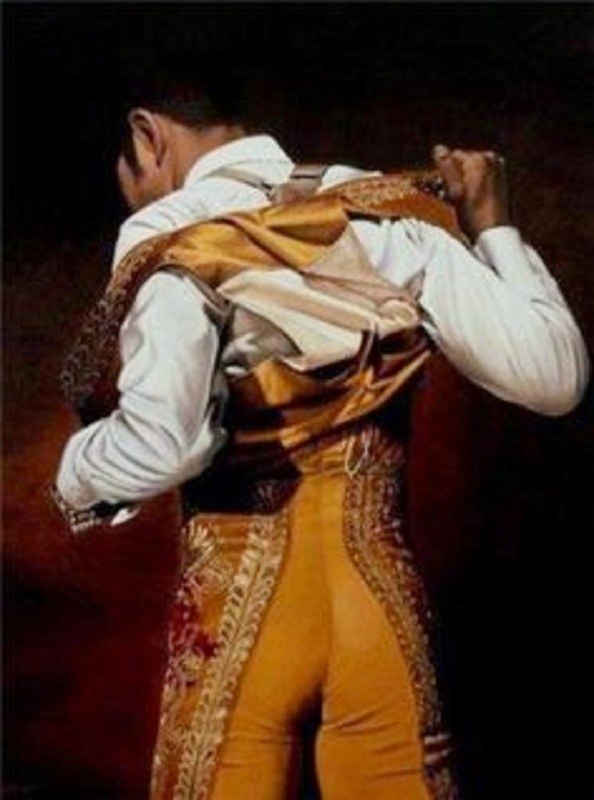 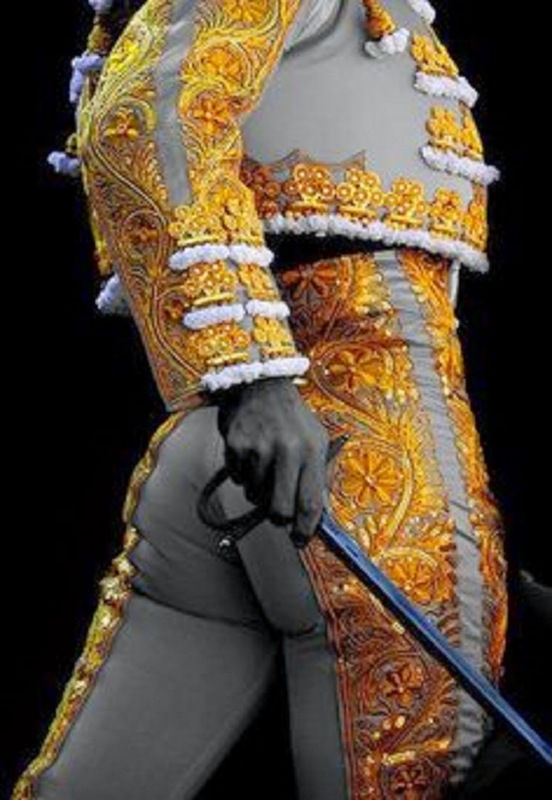 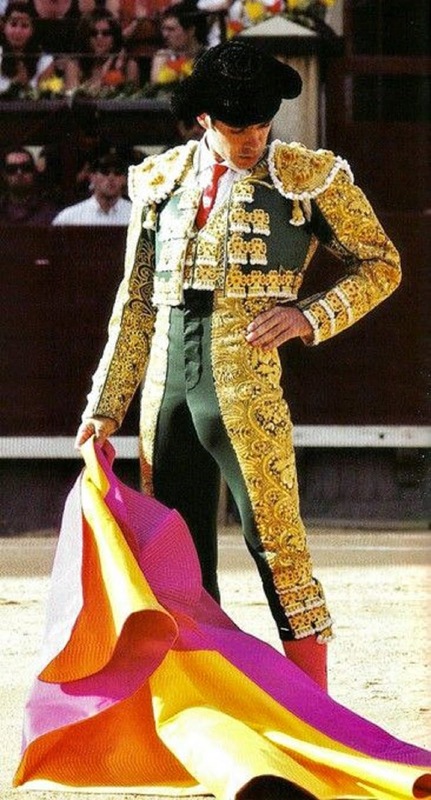 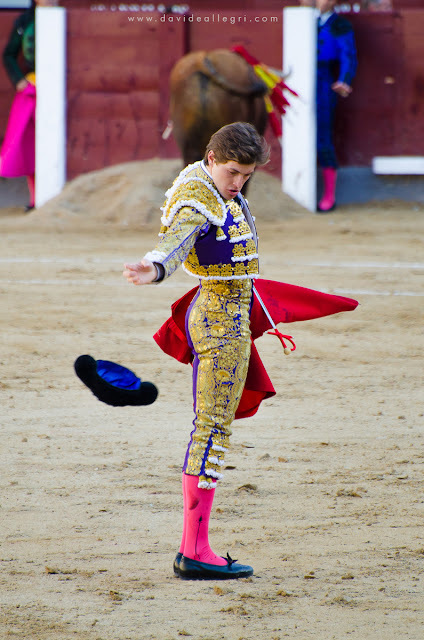 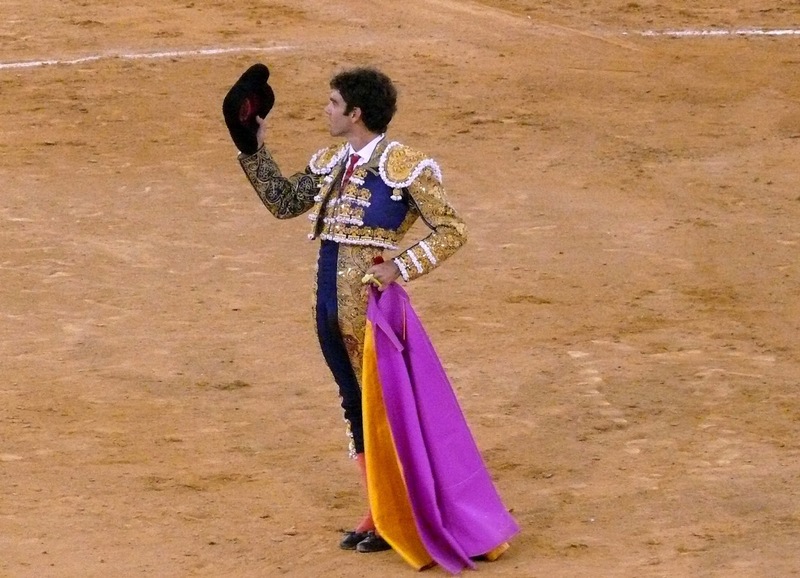 A video showing you how to put on the traje de Torero. 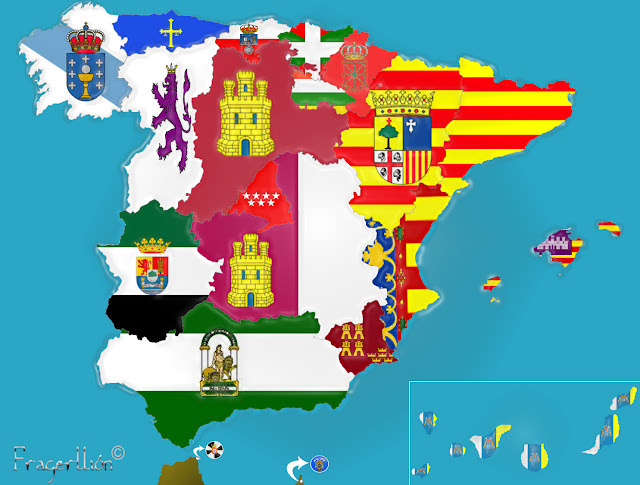 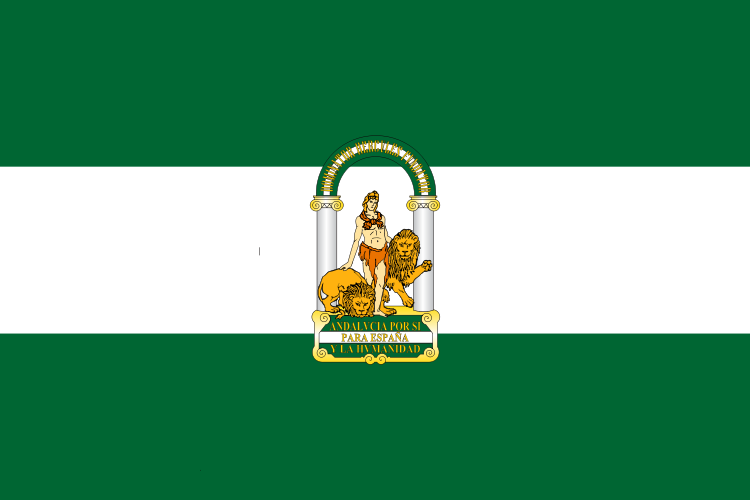 Andalusia is divided into 8 provinces, 4 each in upper and lower Andalusia. 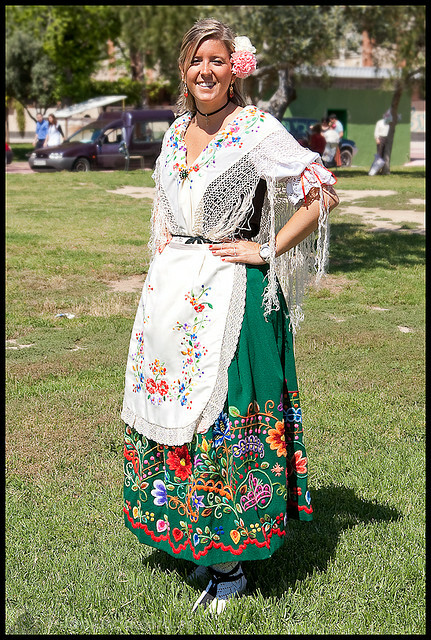 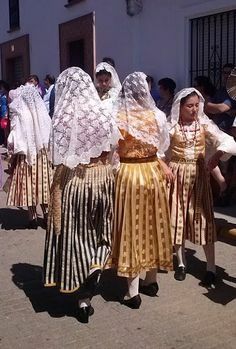 In Huelva, they wear the same costume as in Seville, but there is also a very distinct costume in the town of Pueblo de Guzman, which is called Gabacha, which means 'foreign'. 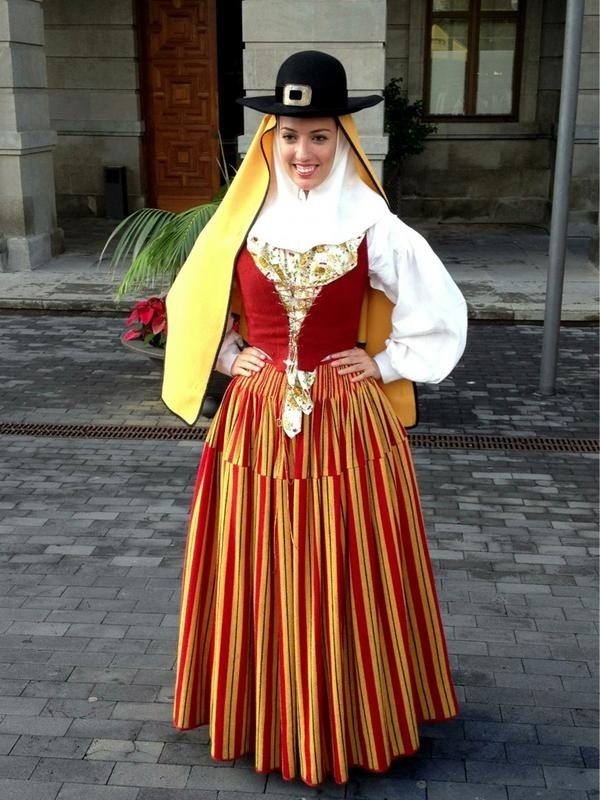 It resembles one of the costumes of the Canary Islands. 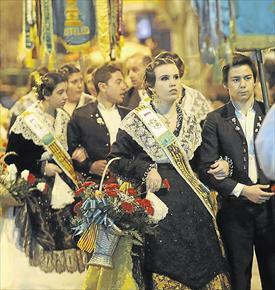 A holiday parade in Puebla de Guzman. 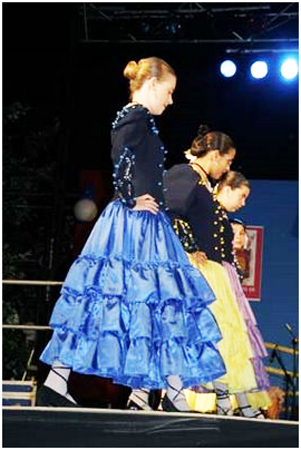 You can see women wearing both costumes. 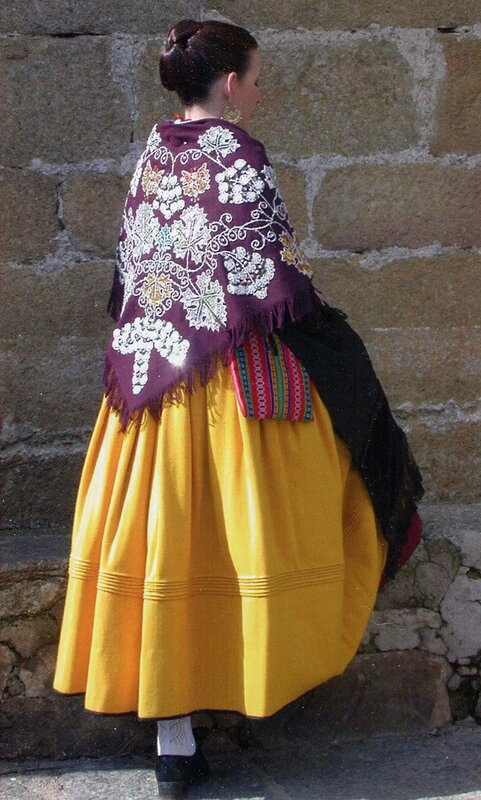 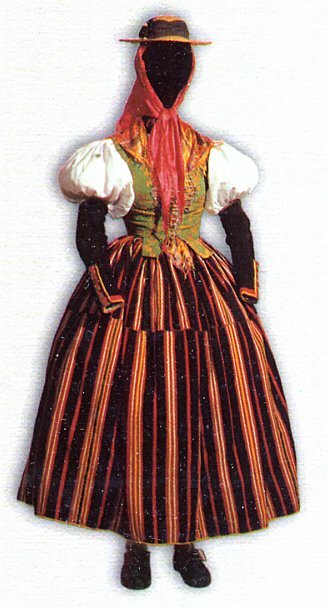 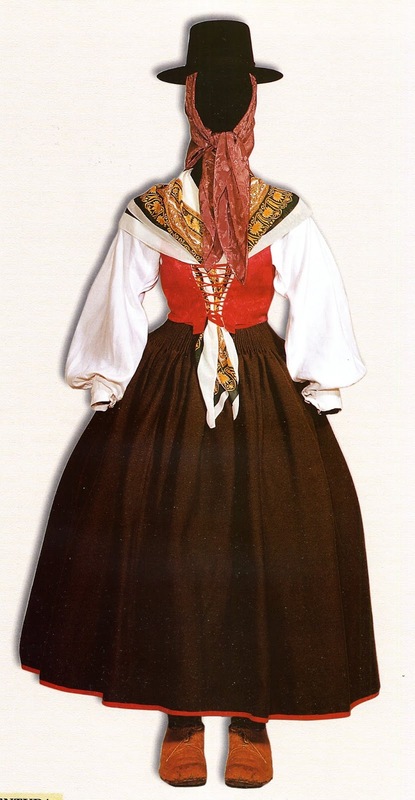 A similar costume is worn in the village of Alosno. 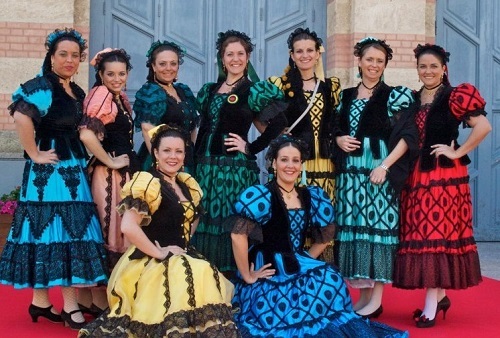 In Cordoba, they wear the same flamenco type costume as in Seville. 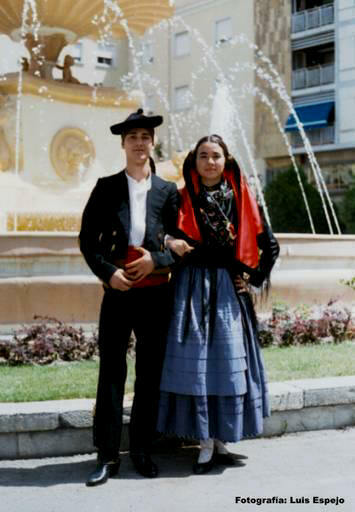 The broad brimmed hat worn by the men in lower Andalusia is called the Sombrero de Cordoba. 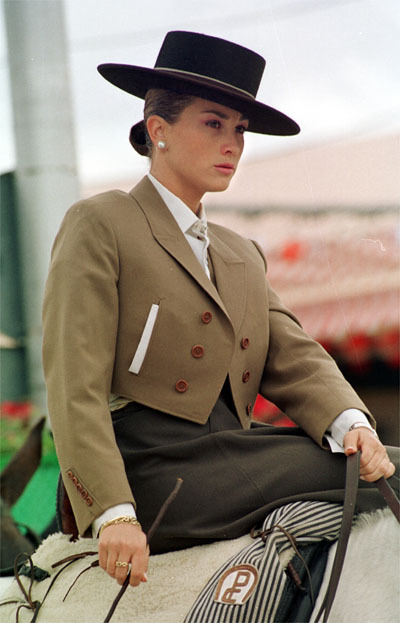 In addition, the women sometimes wear a riding costume based on the men's costume but with a skirt. This is the eastern half of Andalusia, and the costumes change somewhat. 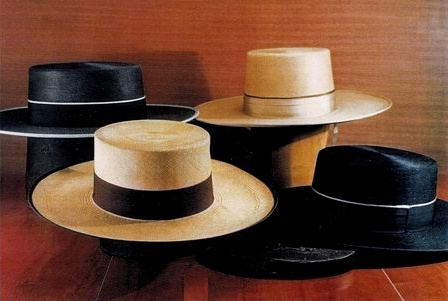 Notice that the Cordoban hat for men is replaced by a different one. 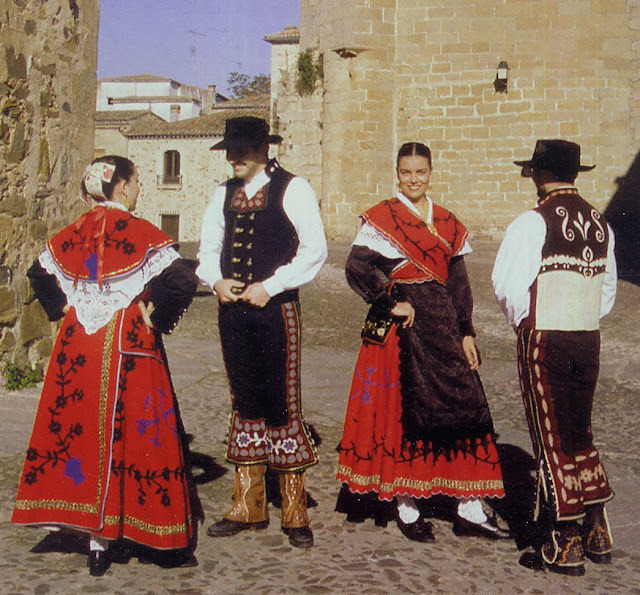 This is especially true of the two eastern provinces, Jaen and Almerilla, which have costumes that approach those of La Mancha and Murcia. 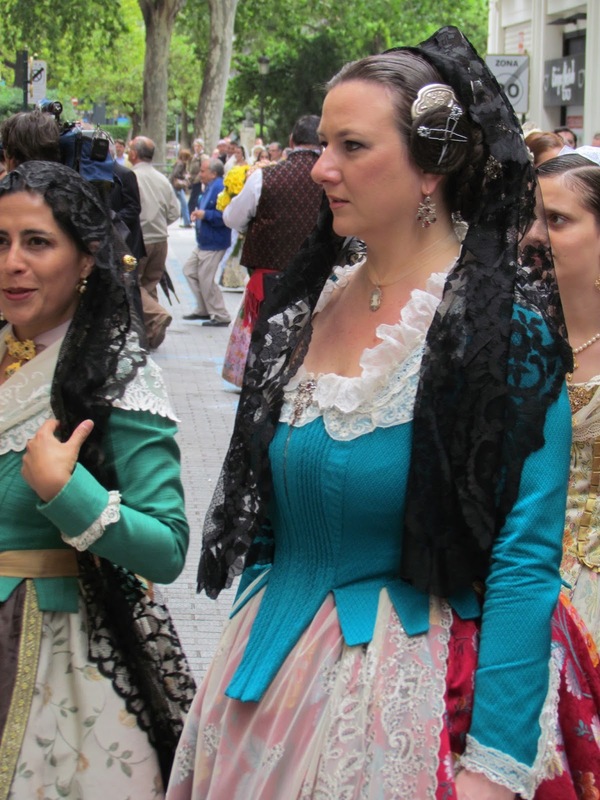 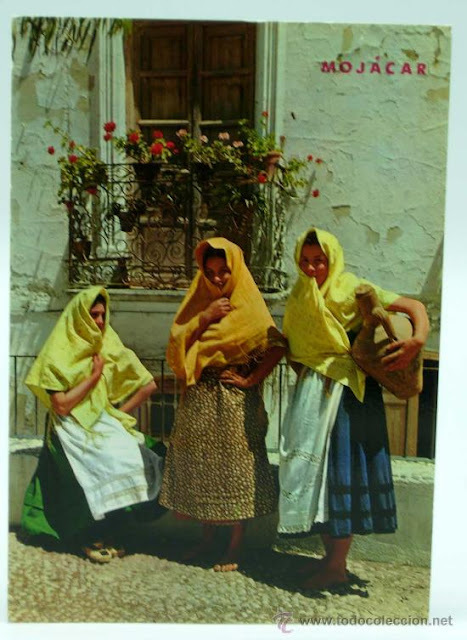 In Malaga they do wear the flamenco or gitana costume, but they also have three distinct local costumes. 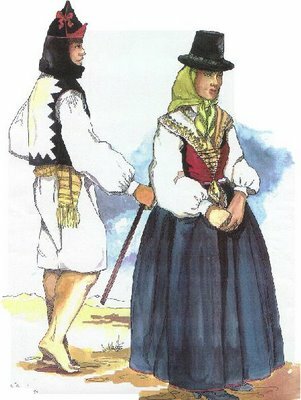 The plainest is called Marenga. This basically consists of white shirt or blouse, red sash or belt, and black pants or skirt. 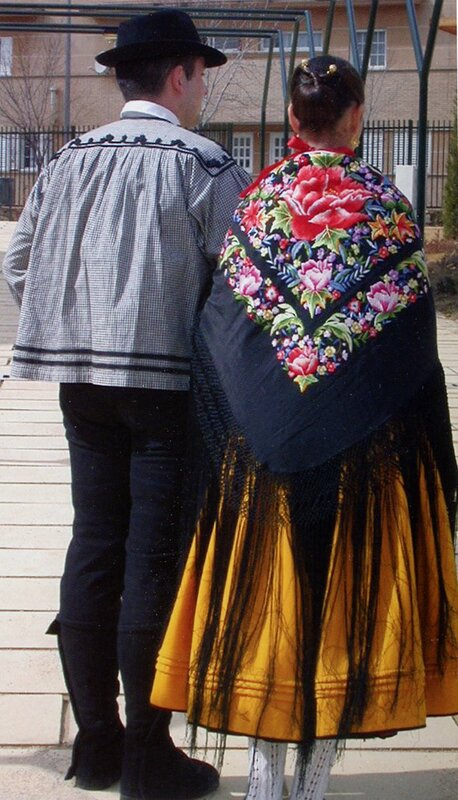 The second is called Verdiales, which is worn by people performing in the spring festival of that name. These are stage costumes and vary quite a bit. 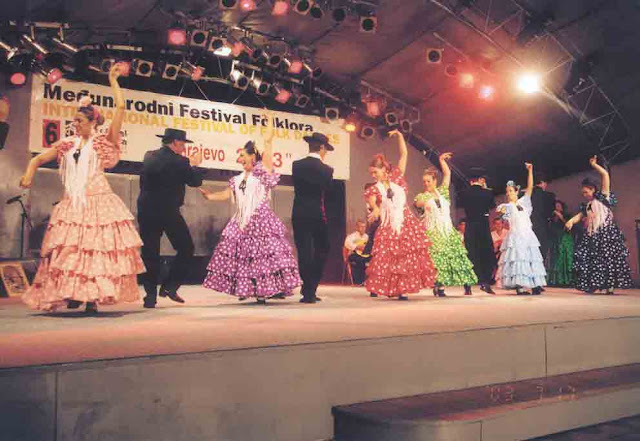 The third and dressiest is the Rondeña costume. 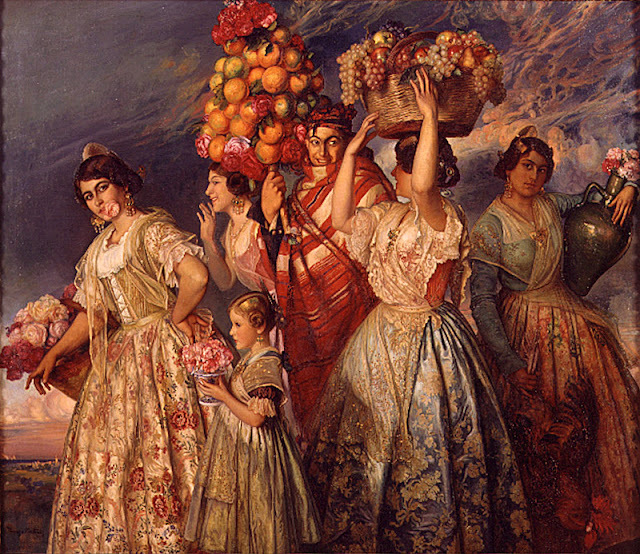 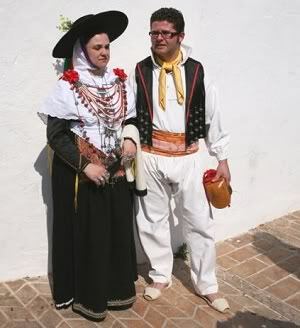 In the eastern part of Andalusia, the costumes change somewhat. 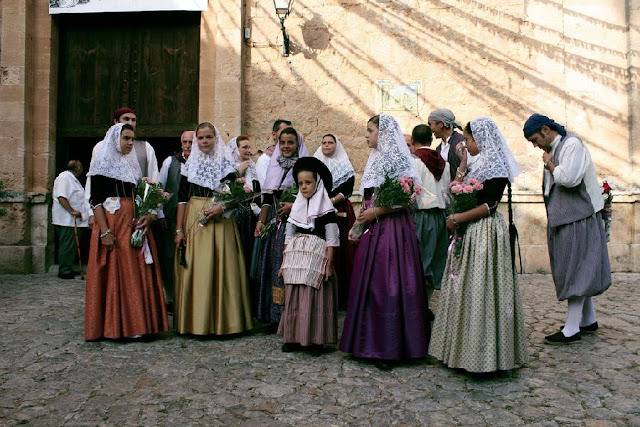 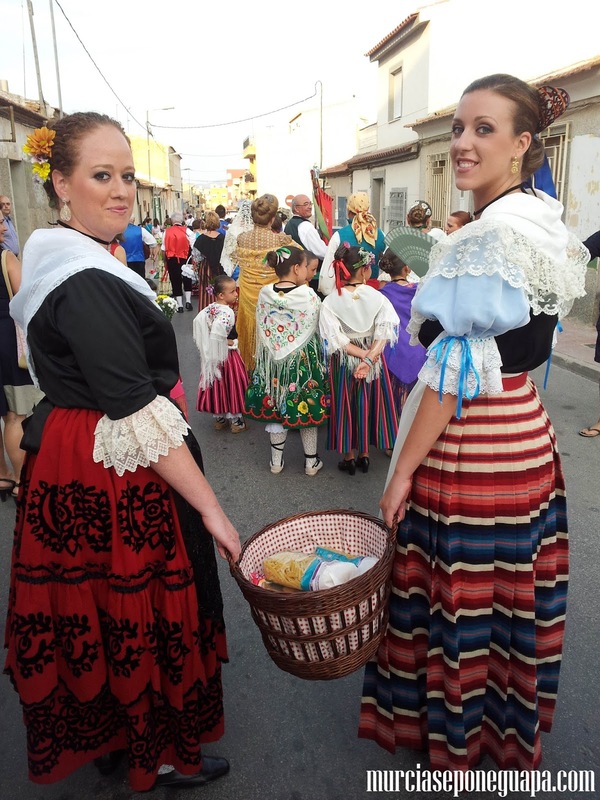 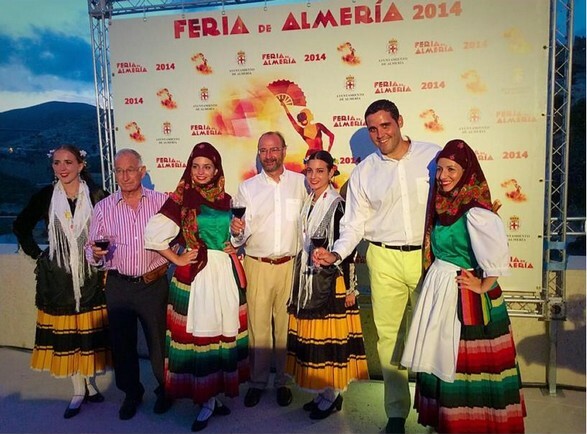 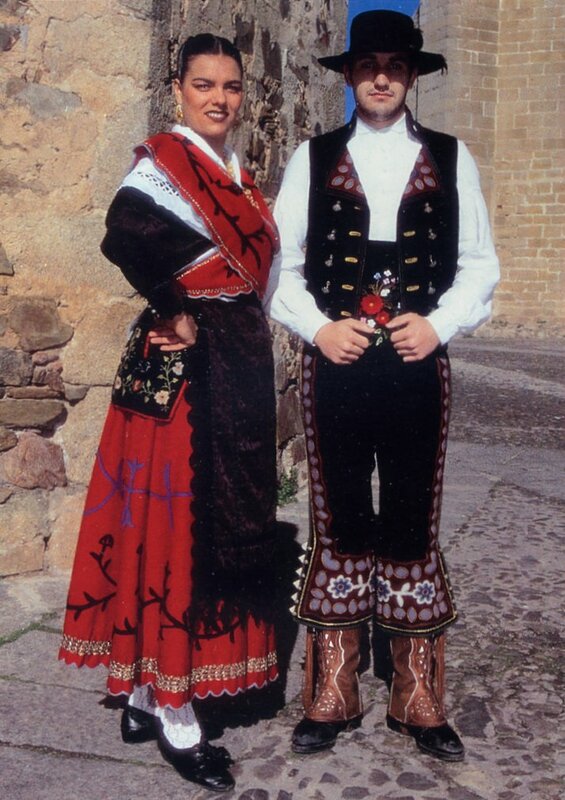 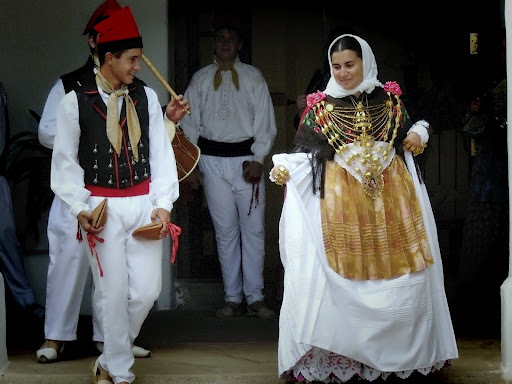 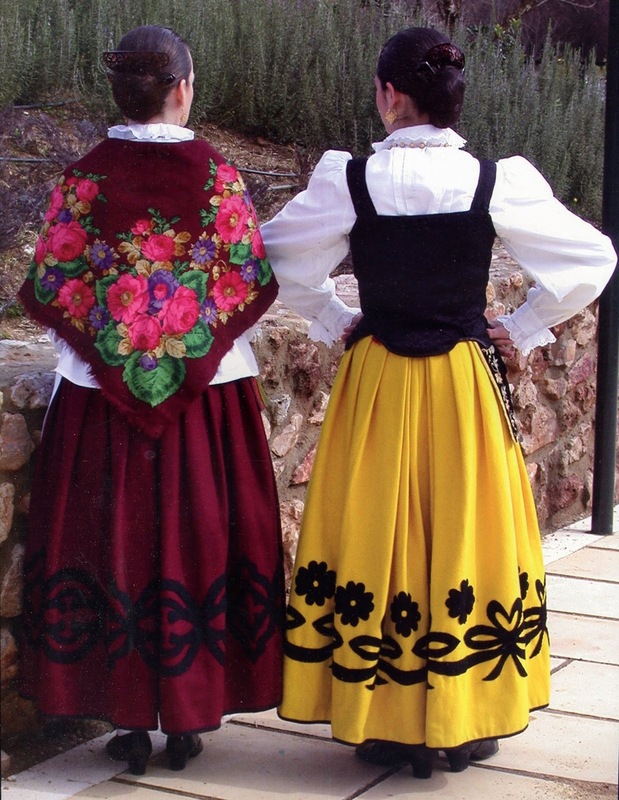 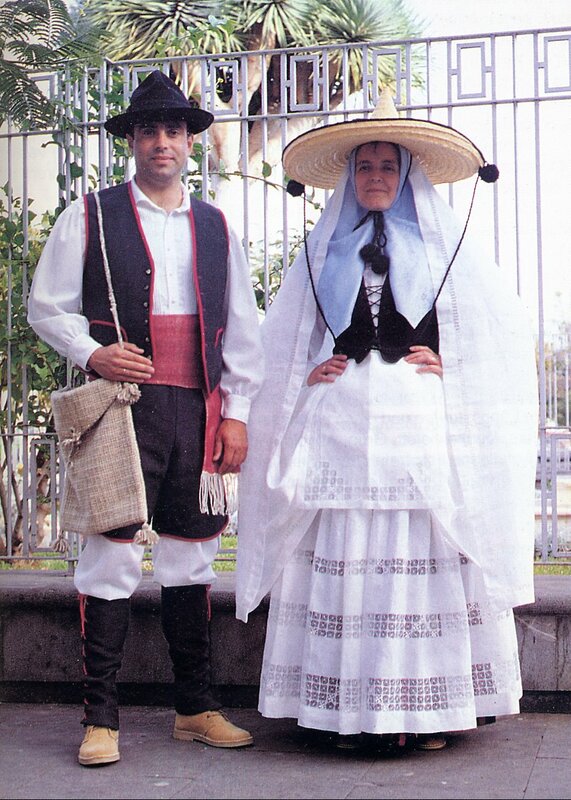 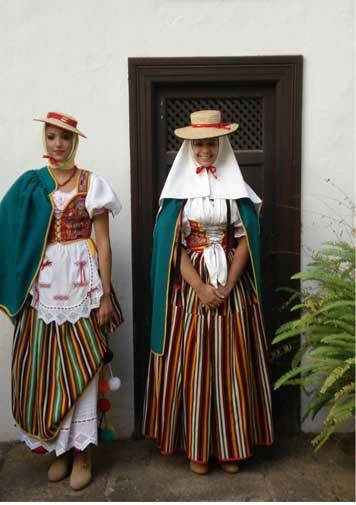 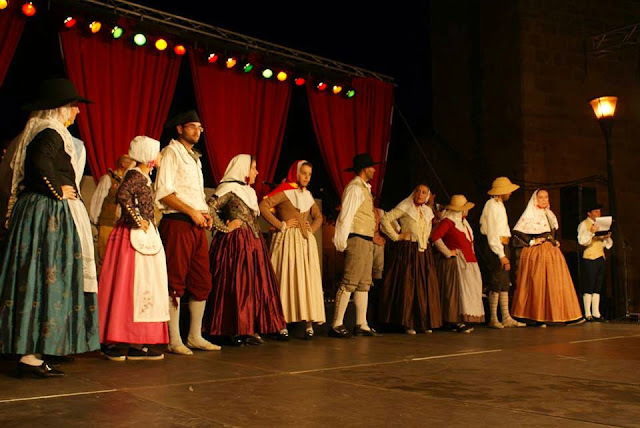 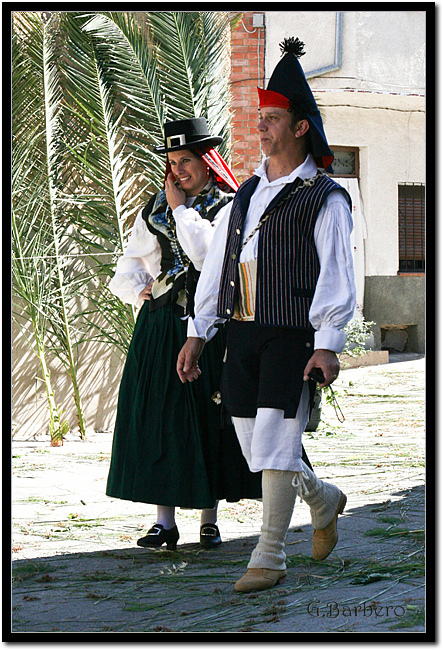 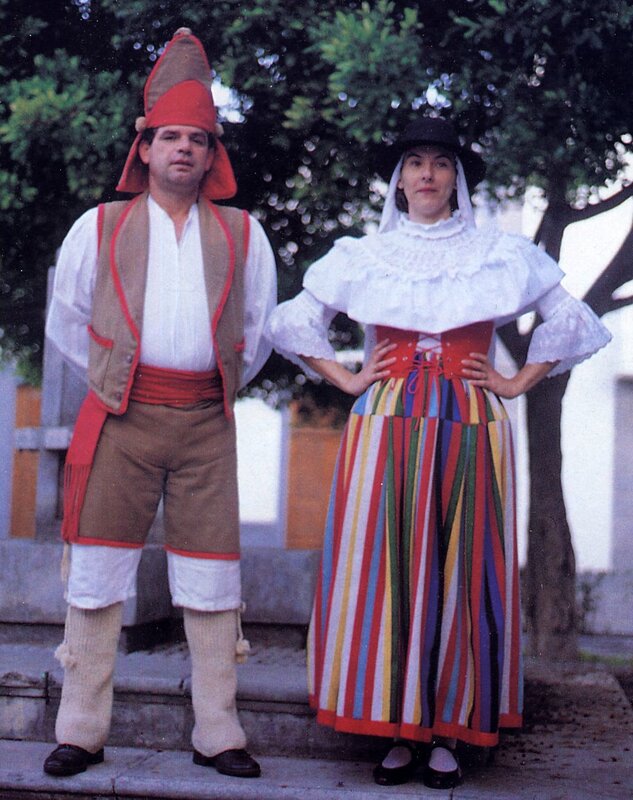 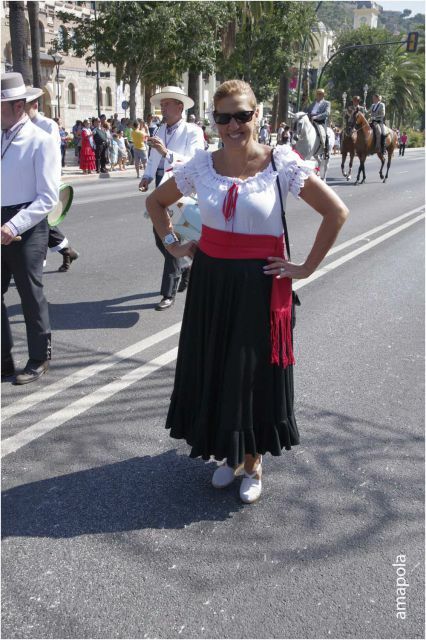 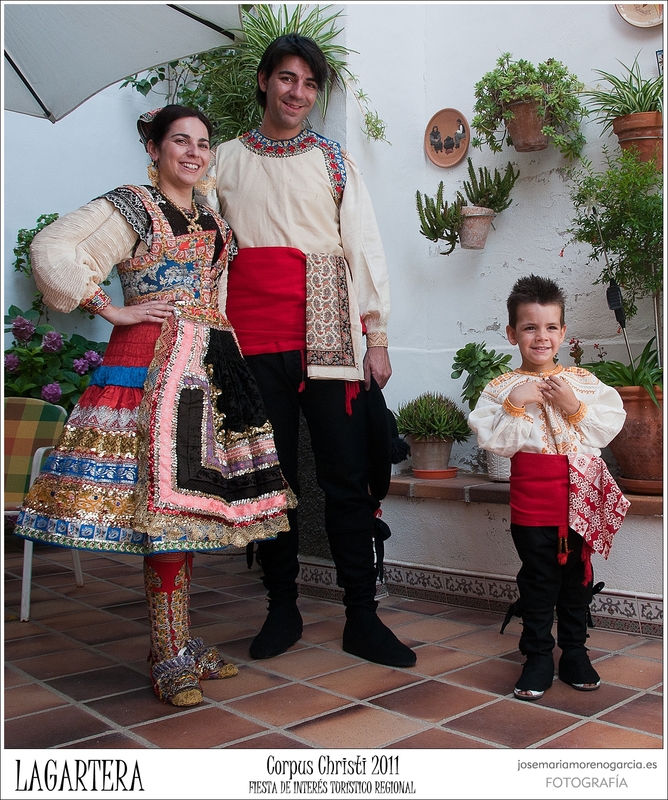 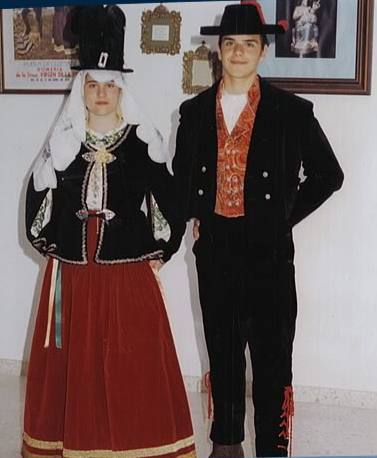 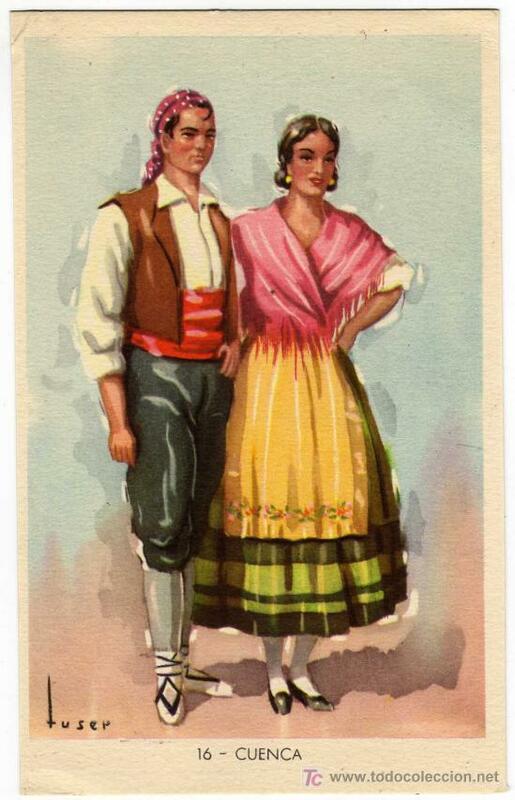 Here are some of the typical costumes of Almeria, showing affinities to both the La Mancha and Murcia costumes. 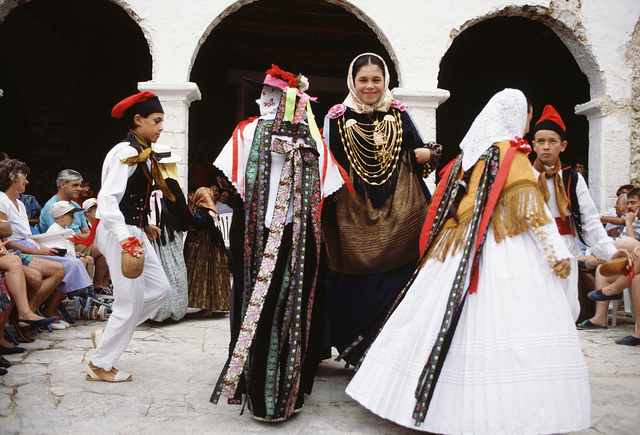 This region is not well known, but has some fascinating culture. 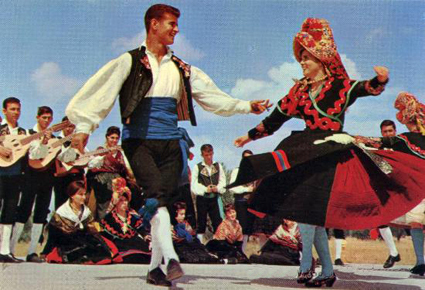 It currently consists of one province only. 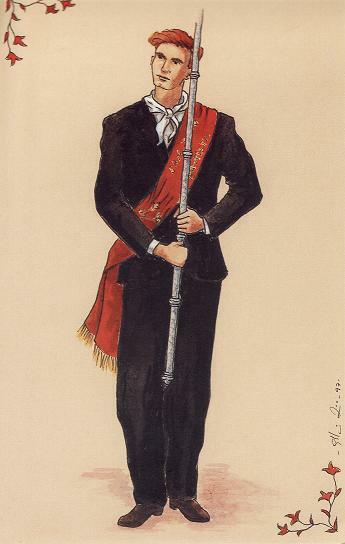 Notable in this region, as in some other parts of the south, are the wide short linen or cotton trousers of the men. 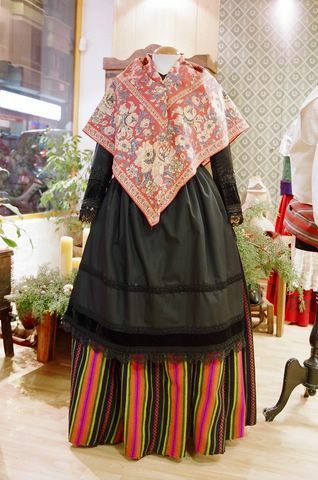 The women's skirts are wide and colorful, and made in several styles. 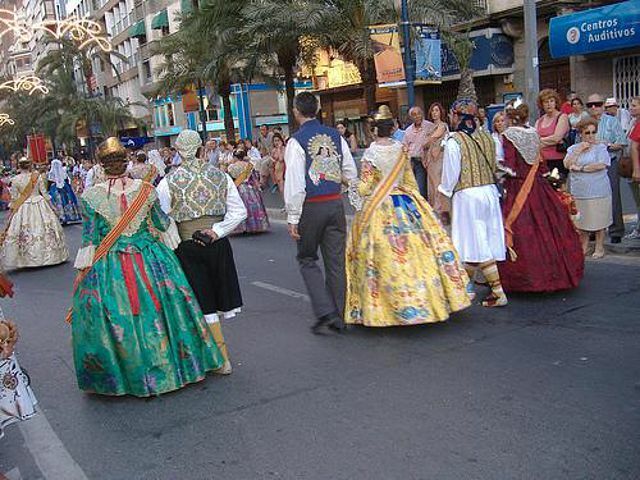 The city of Murcia itself has a very elegant and rich costume based on silks and brocades which recalls that of Valencia, its neighbor to the north. 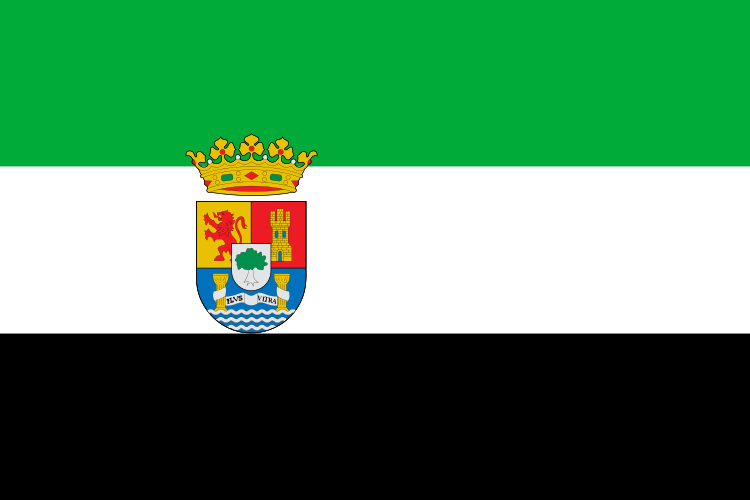 Valencia lies on the east coast of Spain. 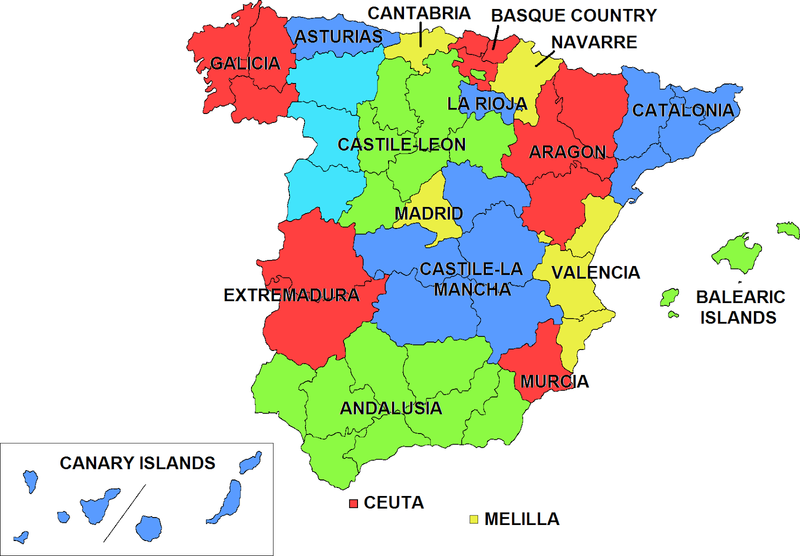 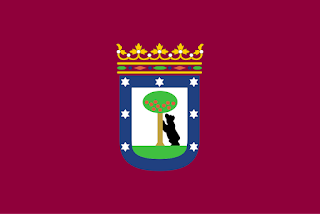 Most of this region speaks a dialect of Catalonian, But in some of the inland areas they speak Castillian. Catalonian is the fourth federally recognized language of Spain. 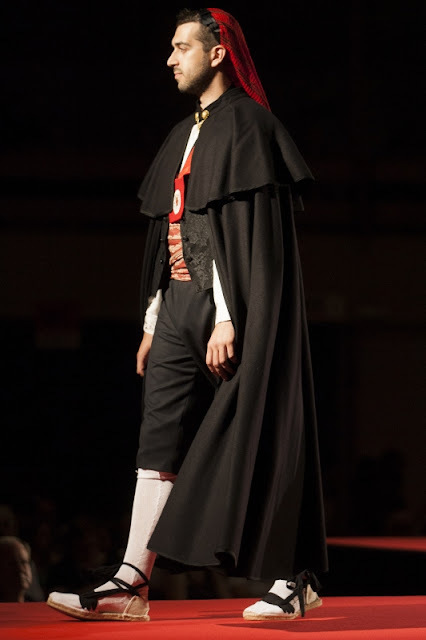 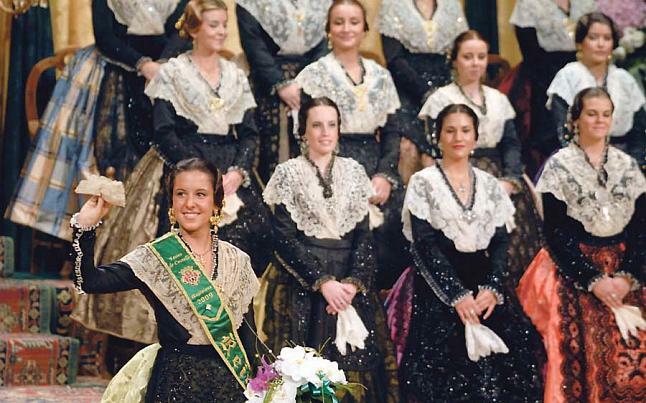 The costume of Valencia is especially striking, and does not vary all that much between the three provinces. 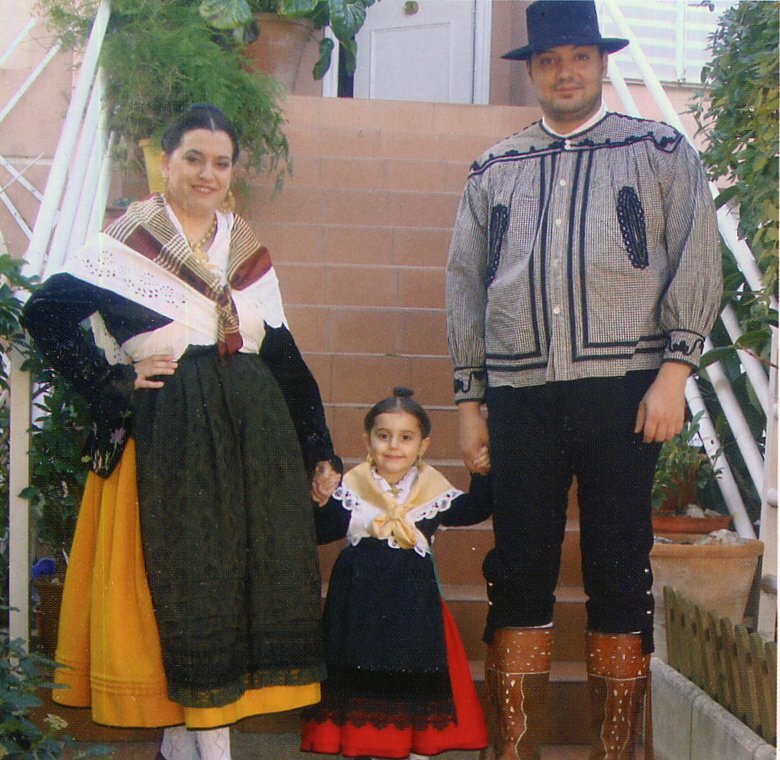 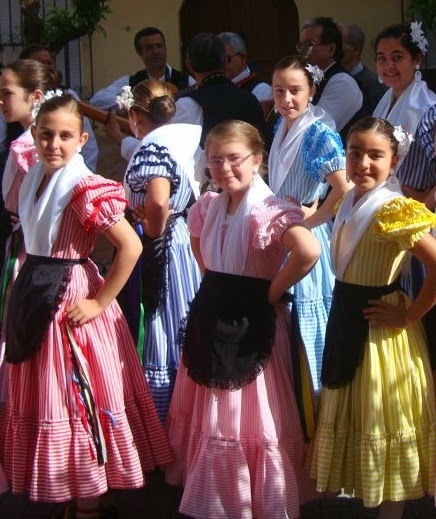 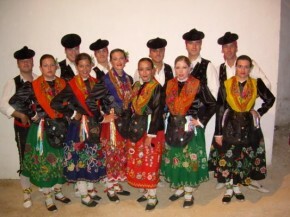 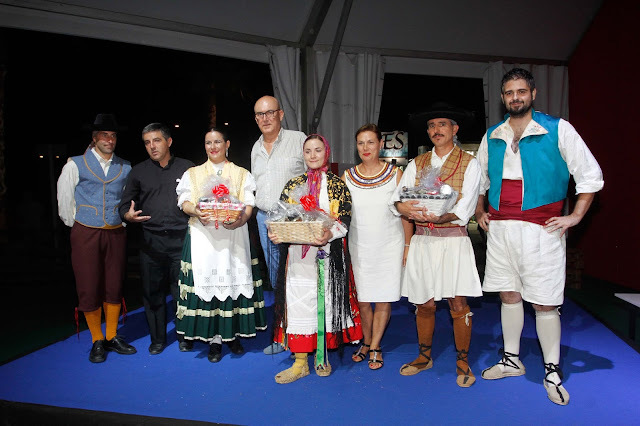 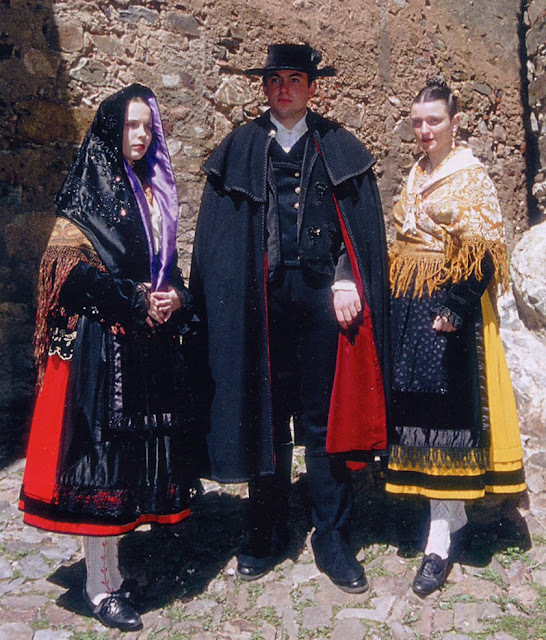 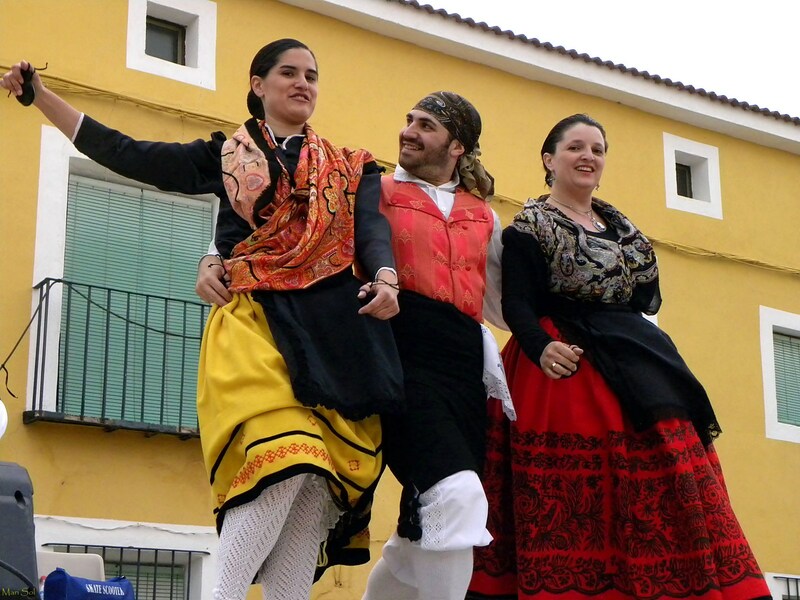 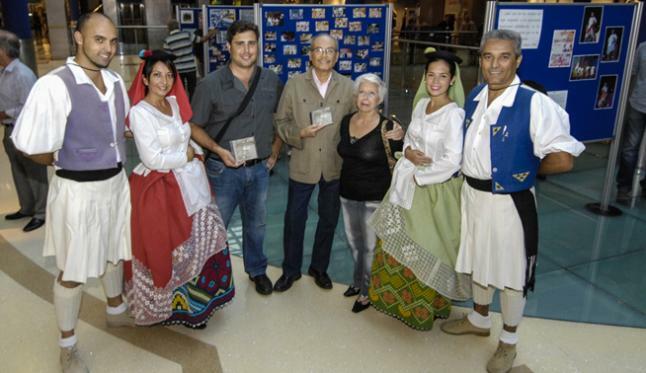 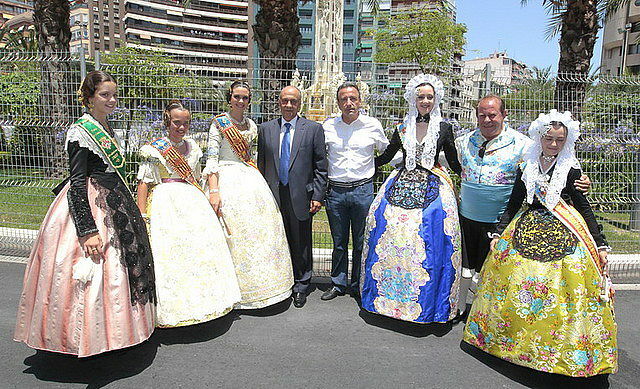 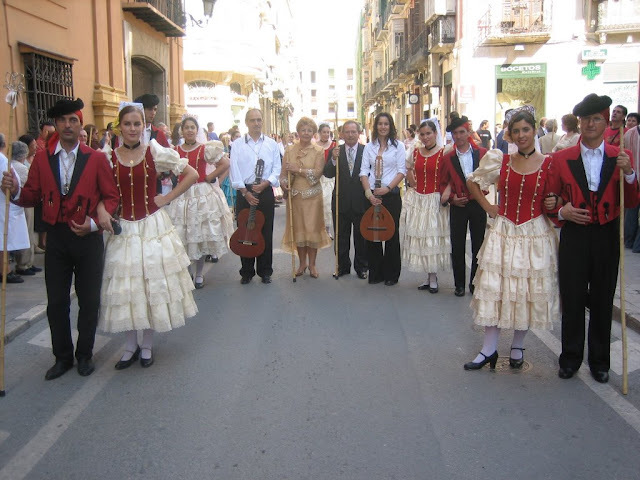 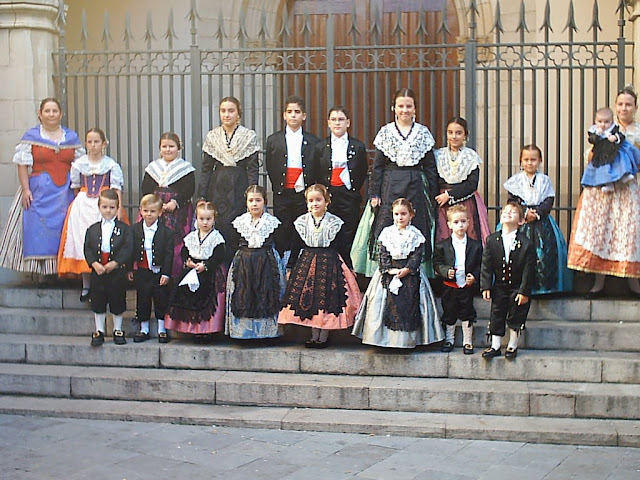 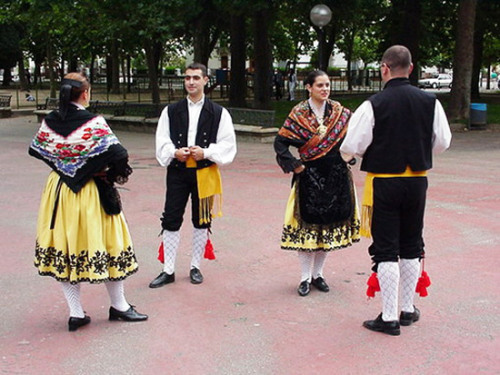 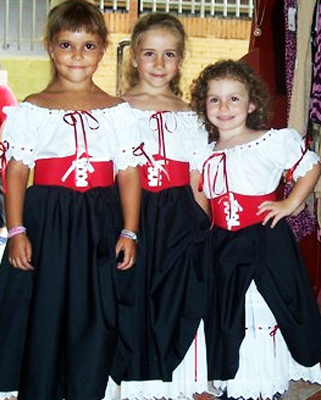 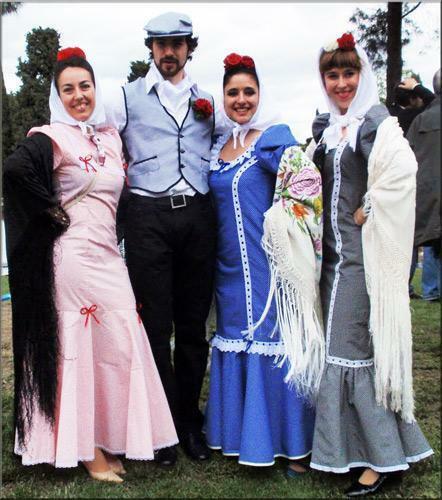 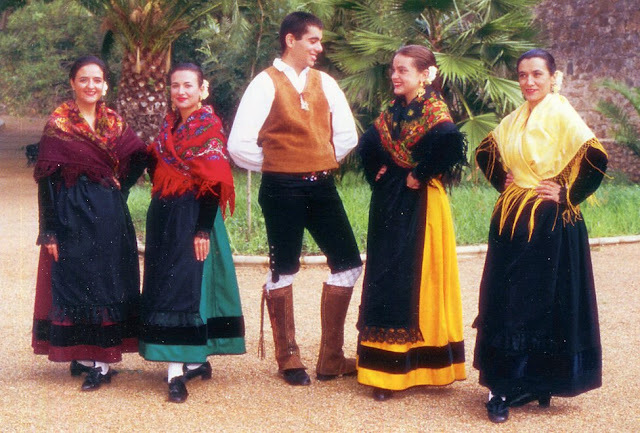 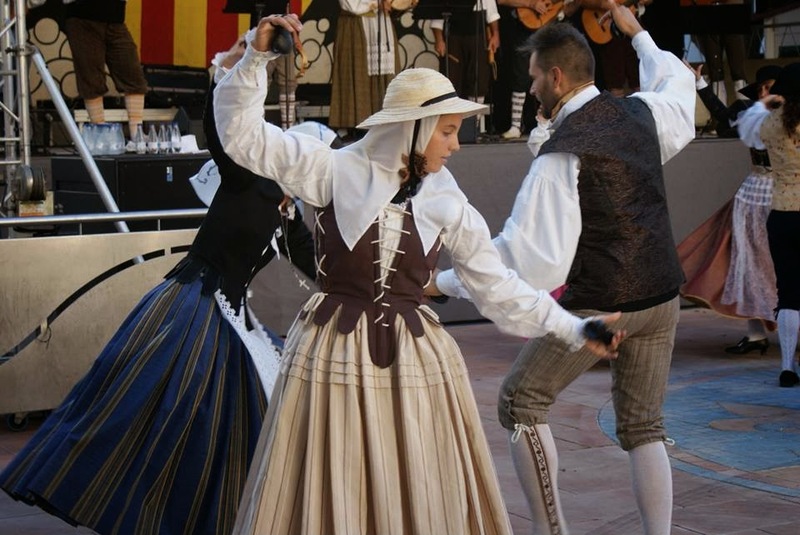 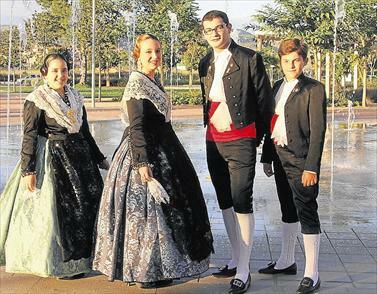 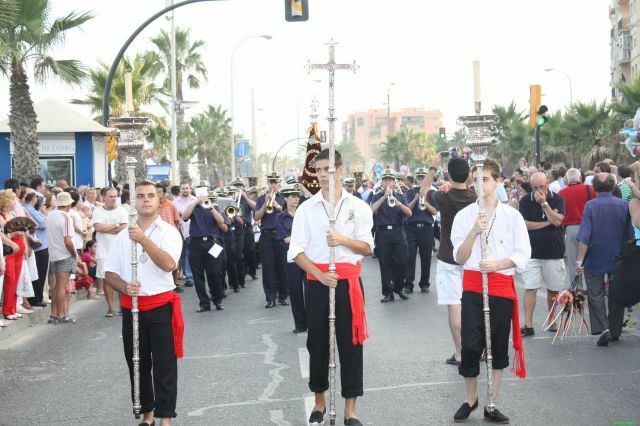 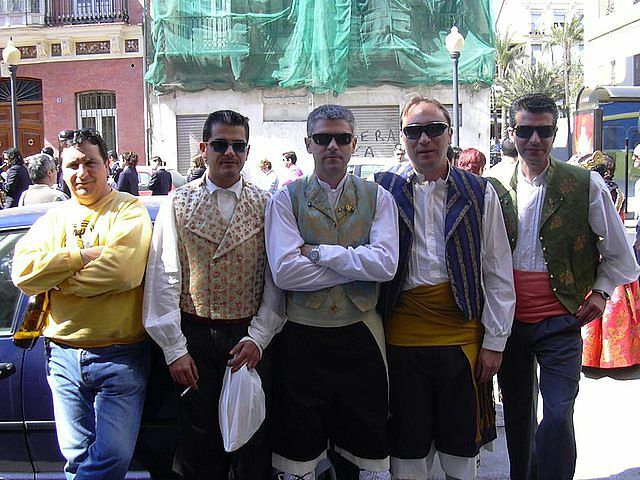 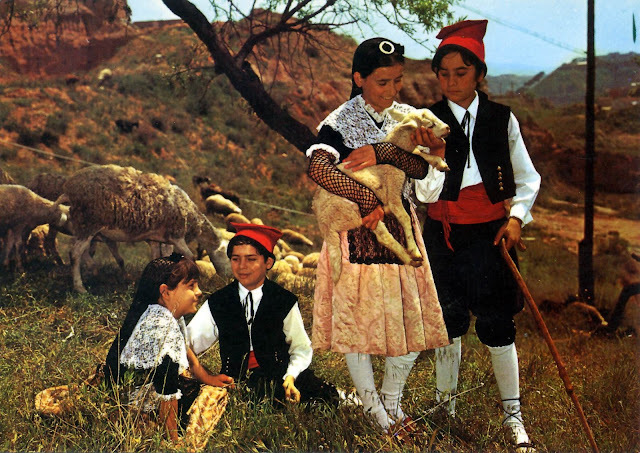 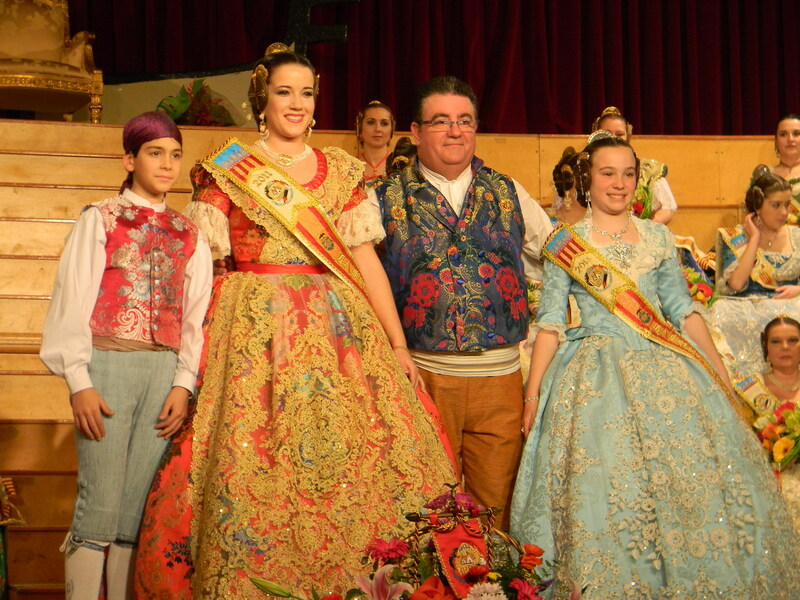 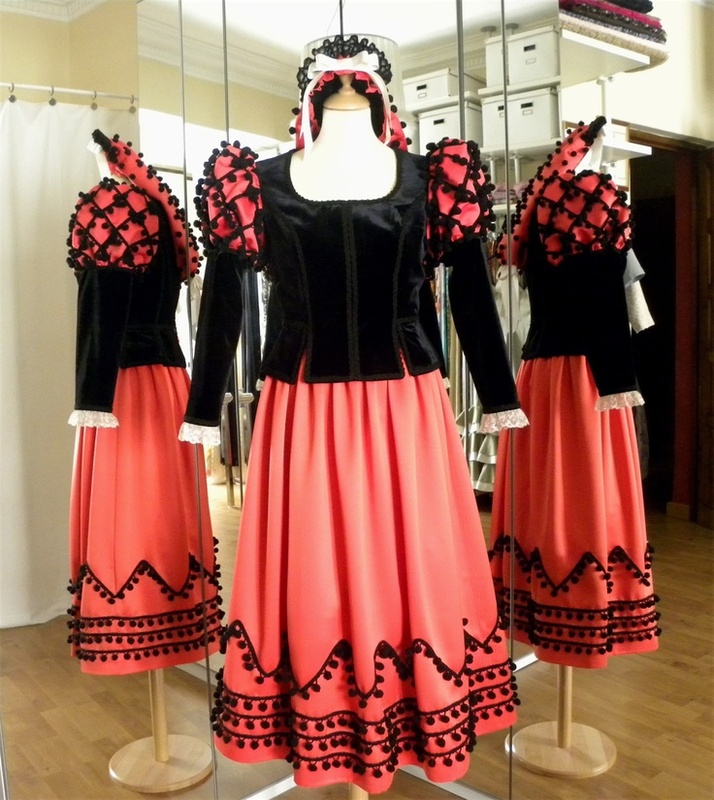 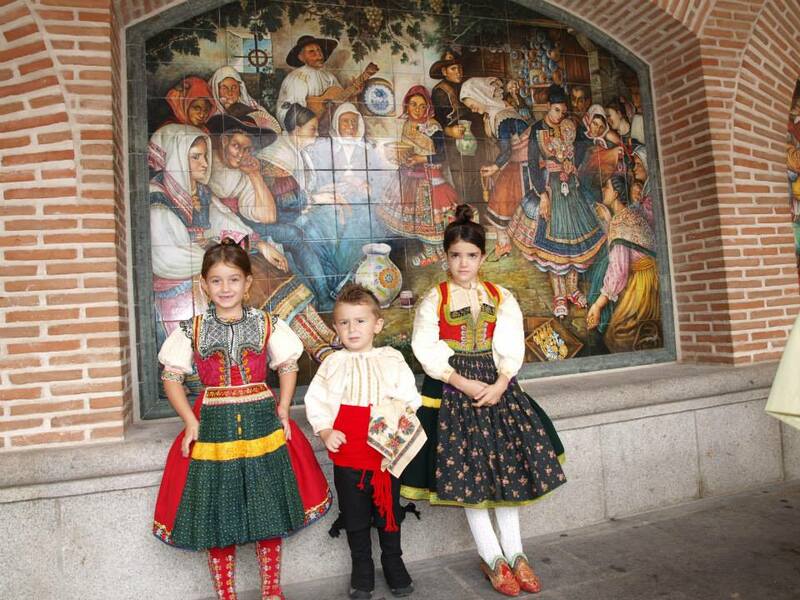 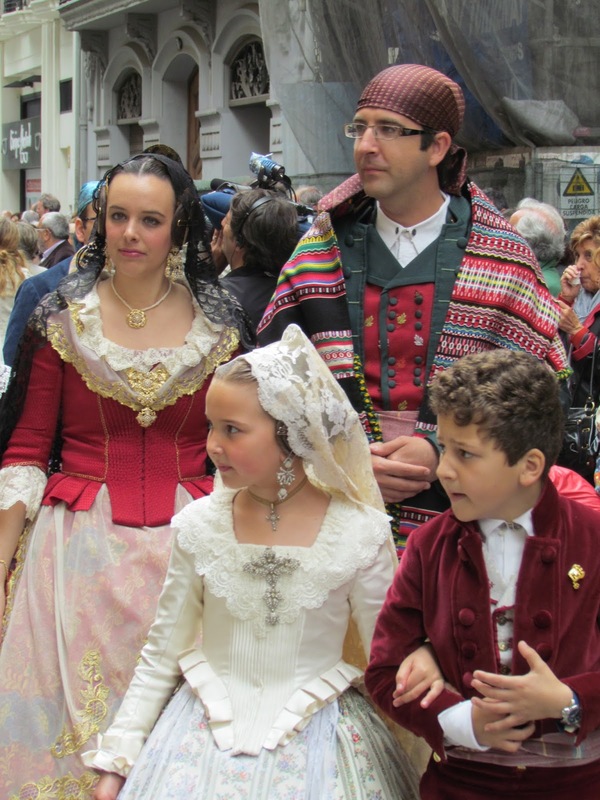 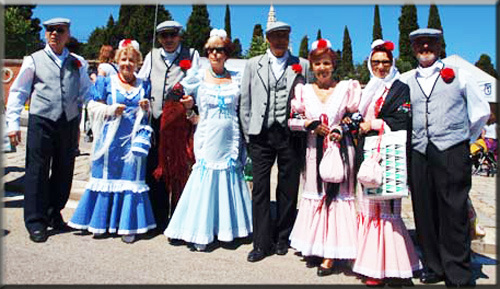 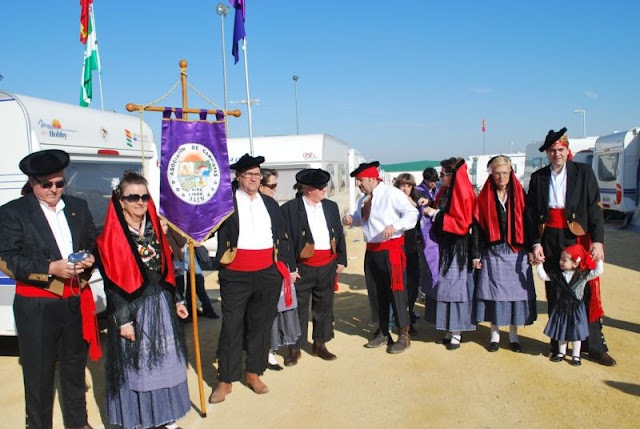 The image below shows the costumes, from left to right, of Castellon, Valencia and Alicante. 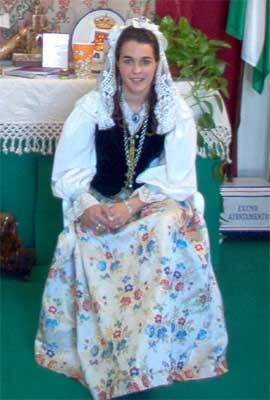 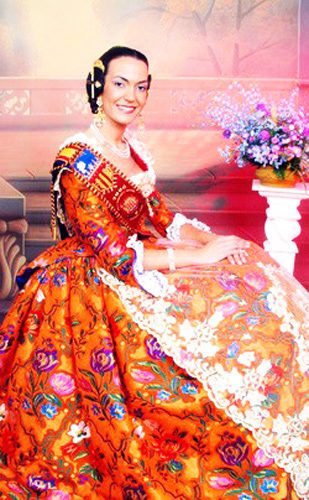 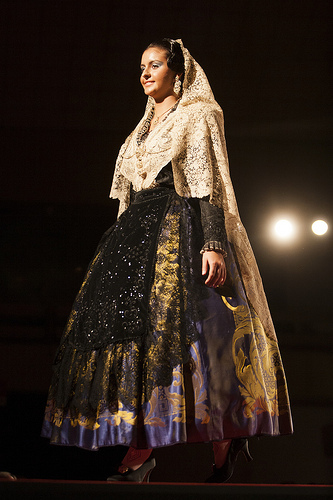 The costume of Alicante is distinguished by the dressing of the hair, which includes a ruffled lace veil. 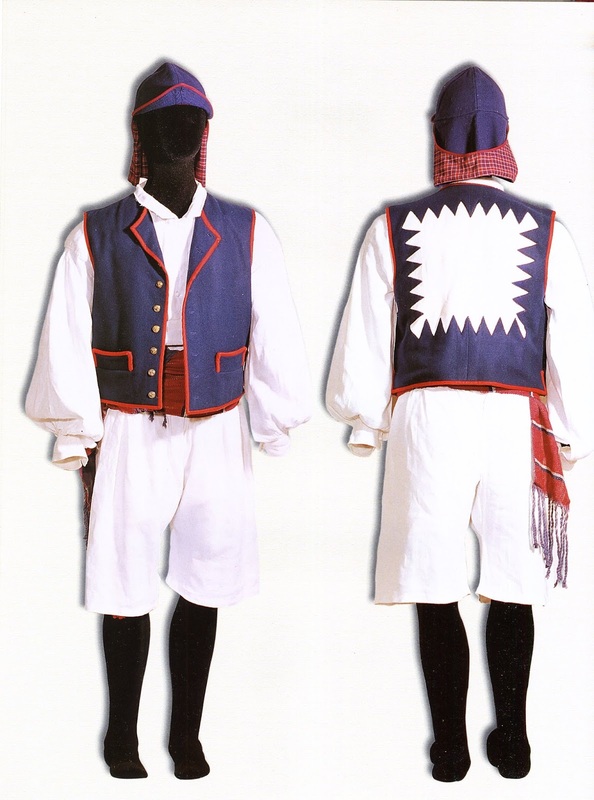 In other respects it is much like the costume of the rest of this region. 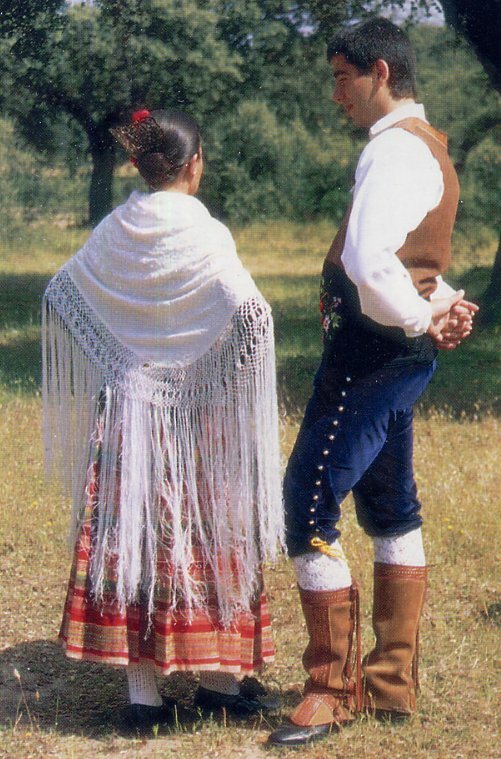 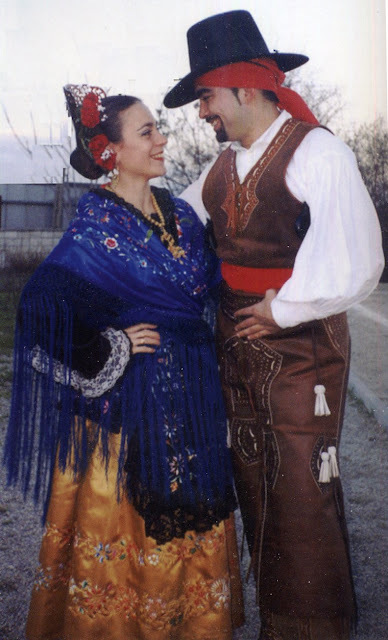 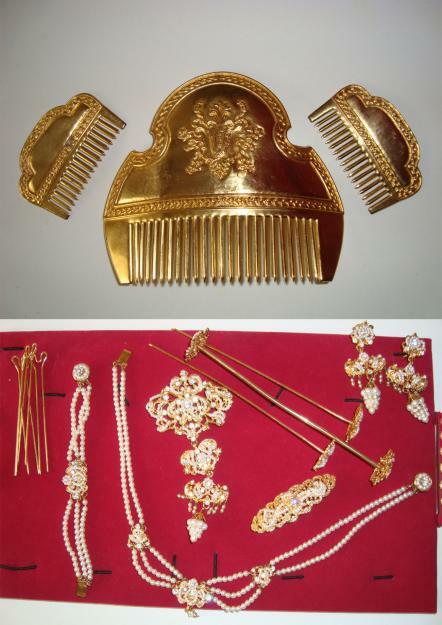 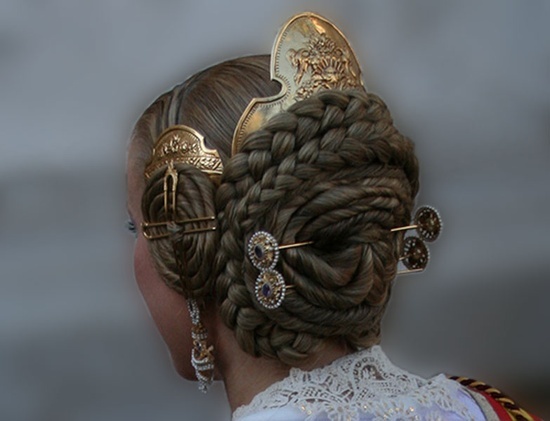 The standard Valencian costume includes the dressing of the hair into a bun on each side, as well as another in the rear, each of which is topped by a decorative comb. 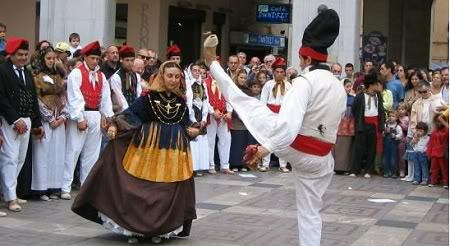 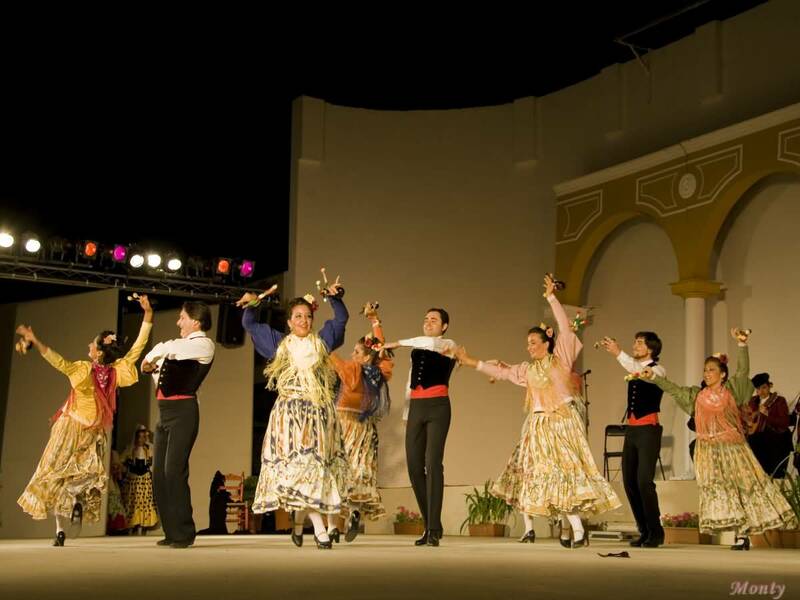 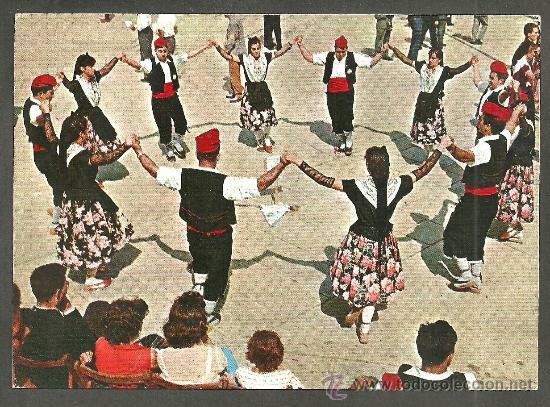 A performance of dances from Valencia. 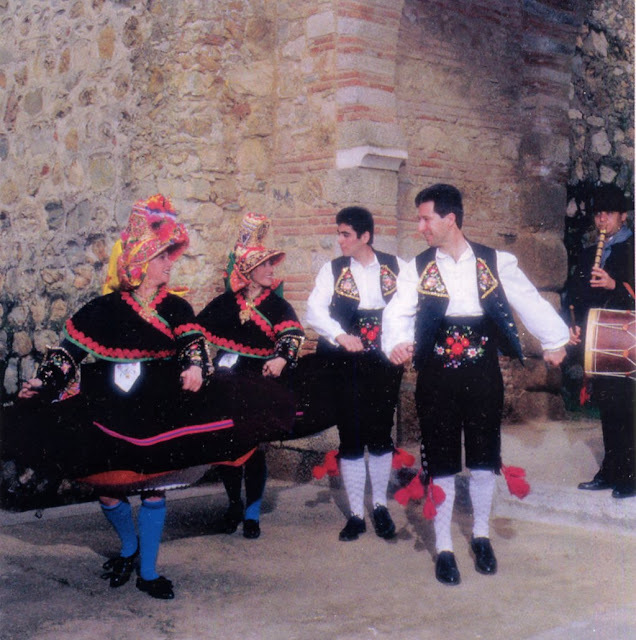 The dancers are in costumes from the country, rather than the city costumes shown above. 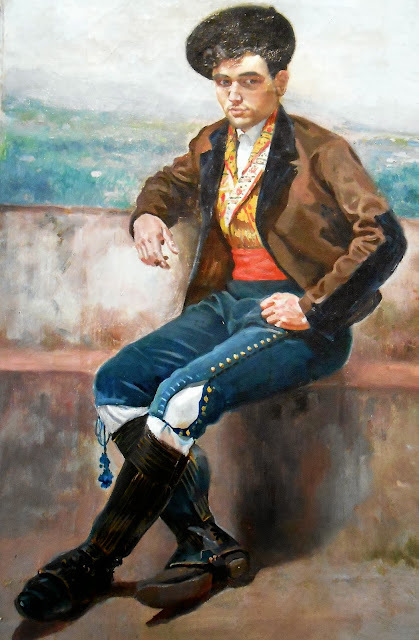 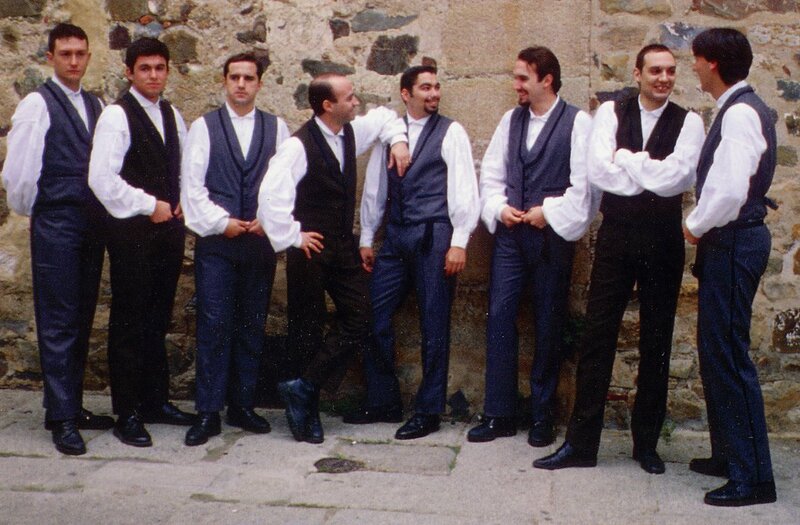 The costume of Castellon is somewhat more sober, and the dressing of the hair is somewhat different, the coils of the hair at the sides not found here. 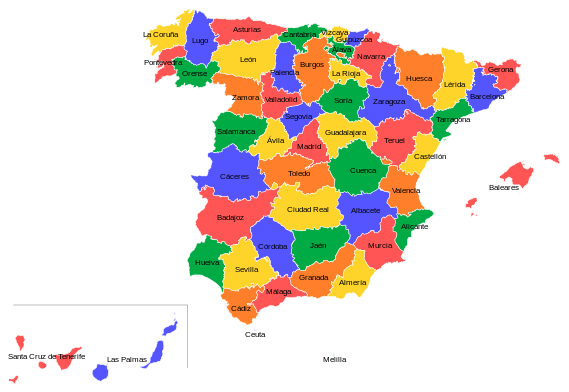 This is the home of the Catalonian language, which is also spoken in Valencia, Andorra, the Balearic Islands and Rousillon in France. 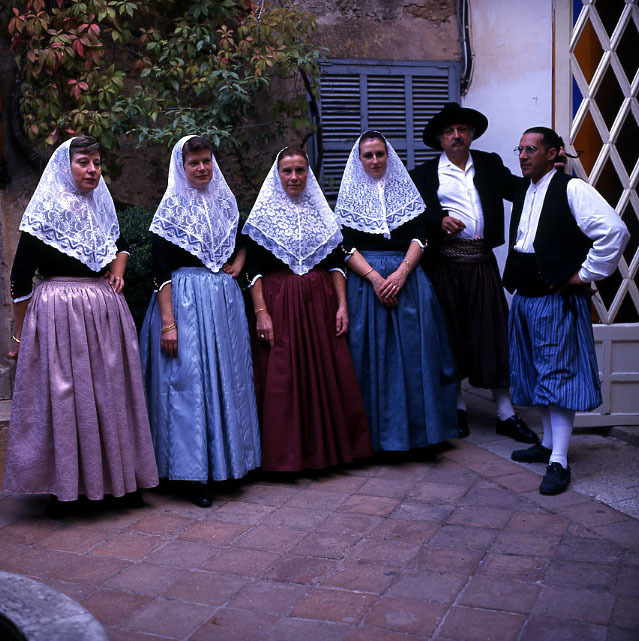 One valley in the far northwest of Catalonia speaks Occitan. Catalonia had a very long history as an independent Principality. 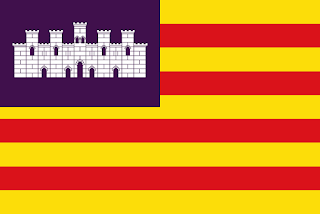 It is divided into four provinces; Tarragona, Lleida, Barcelona and Girona. 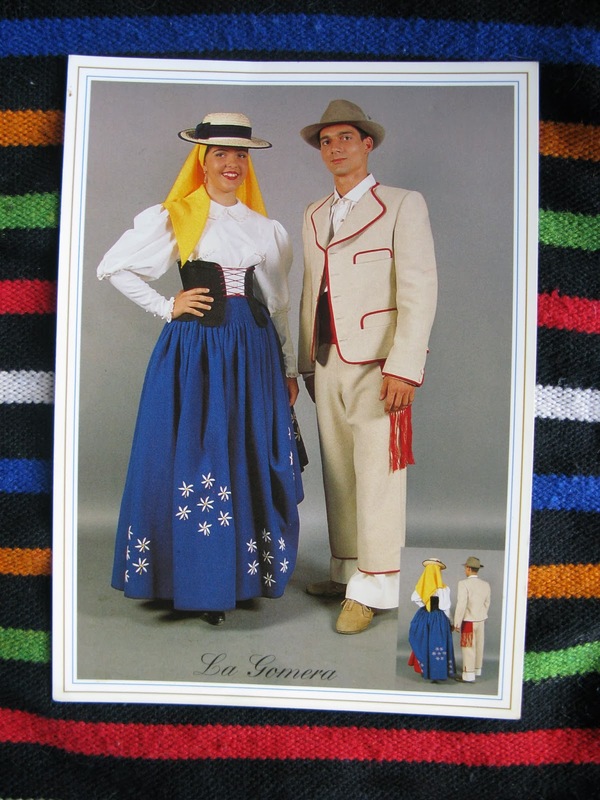 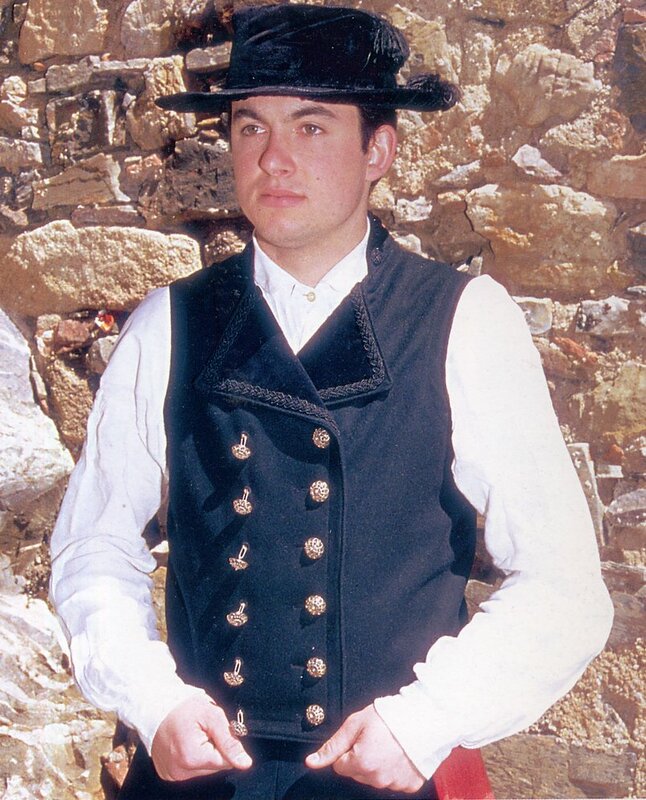 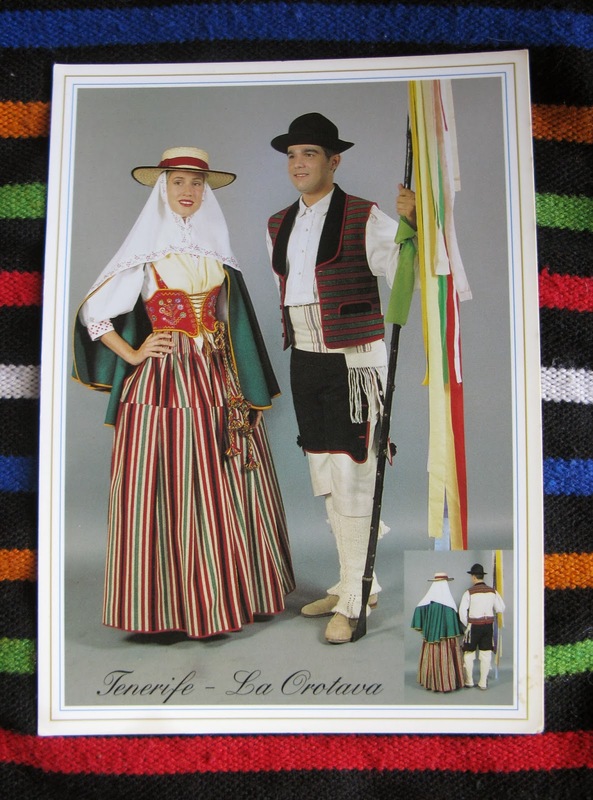 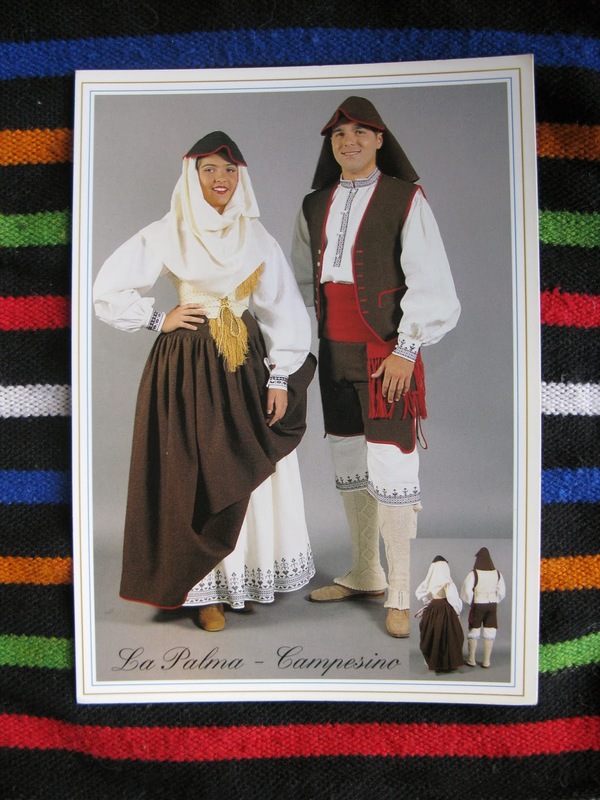 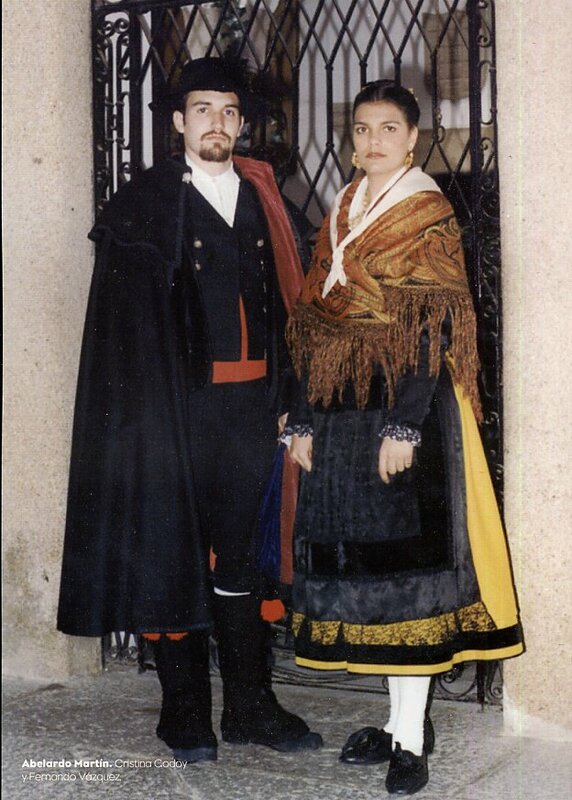 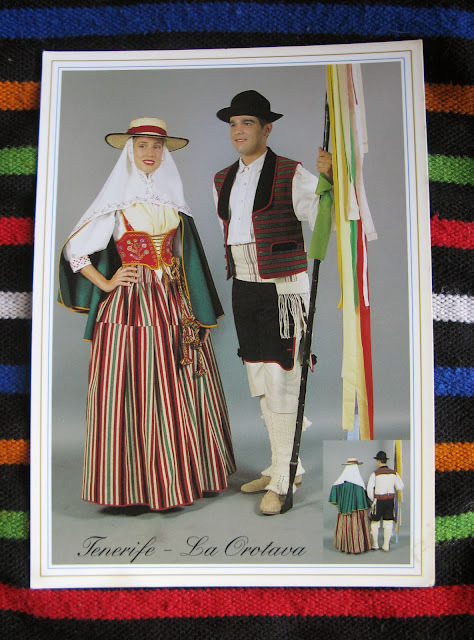 This is the costume which is generally associated with Catalonia as whole. 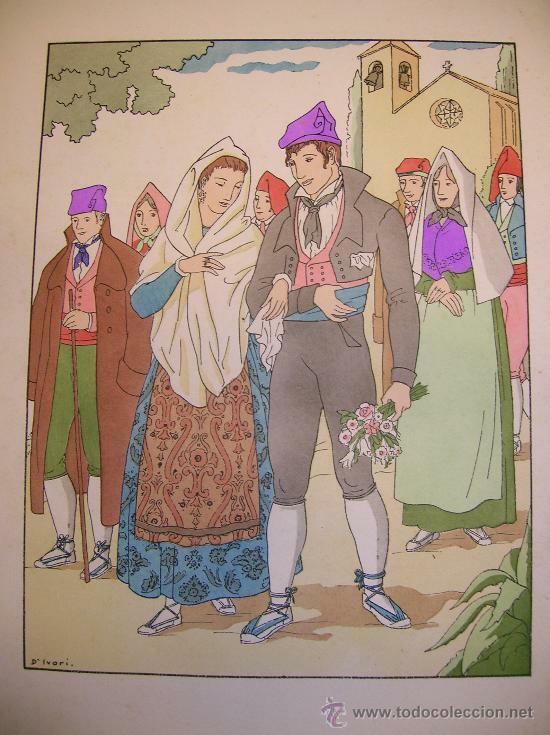 Notice the distinctive hat worn by the men. 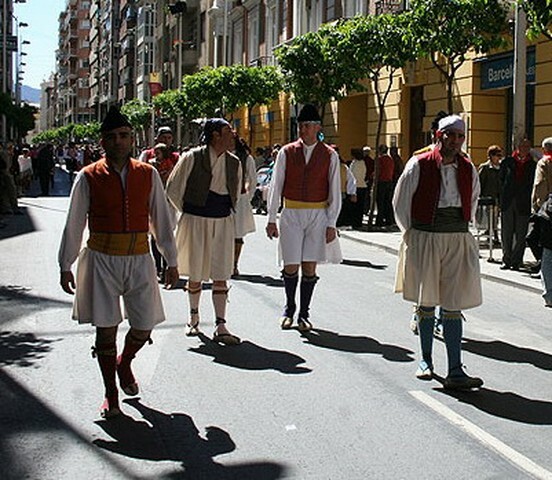 A dance performance in Barcelona. 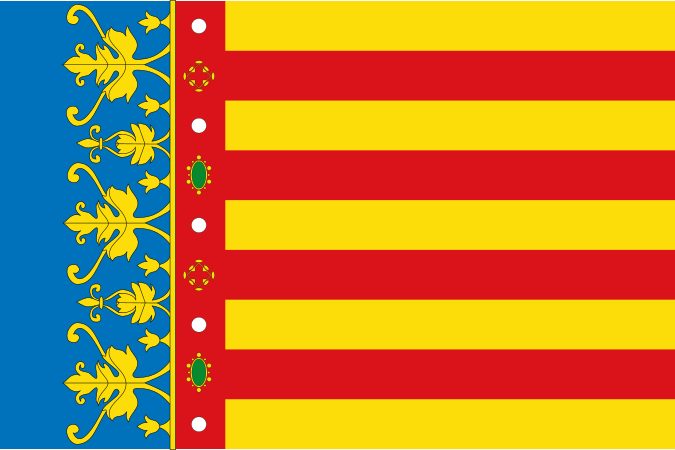 The Balearic Islands belonged to various empires through history and once formed their own kingdom and only relatively recently passed under the control of Spain. 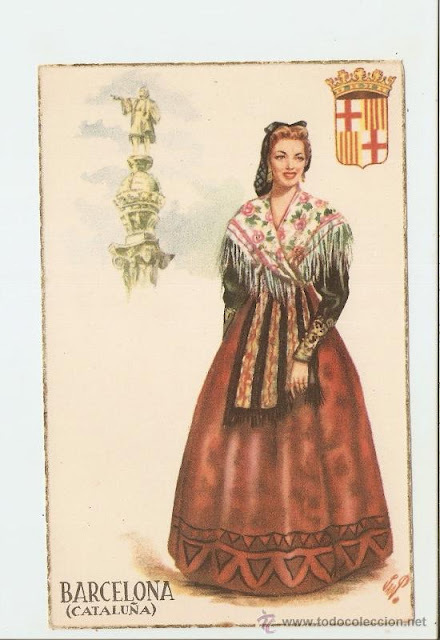 They speak their own dialect of Catalan. 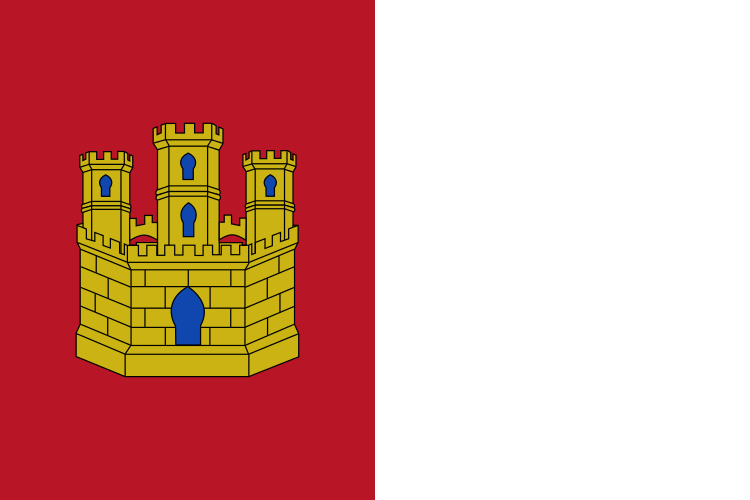 There are four main islands: Majorca, Minorca, Ibiza and Formentera, as well as many smaller ones. 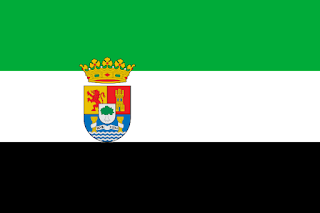 The islands form one province. 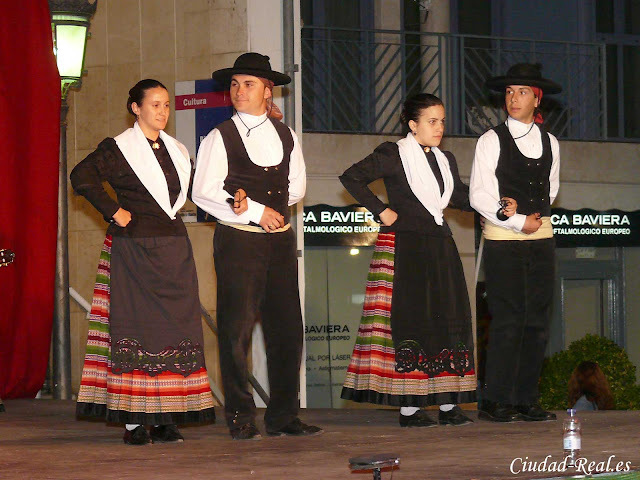 A dance performance on Mallorca. 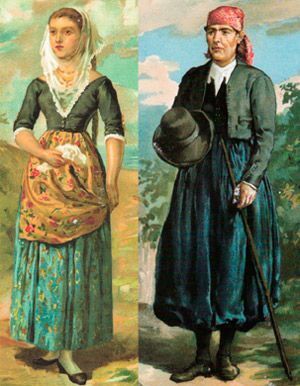 These two islands seem to share the same costume. 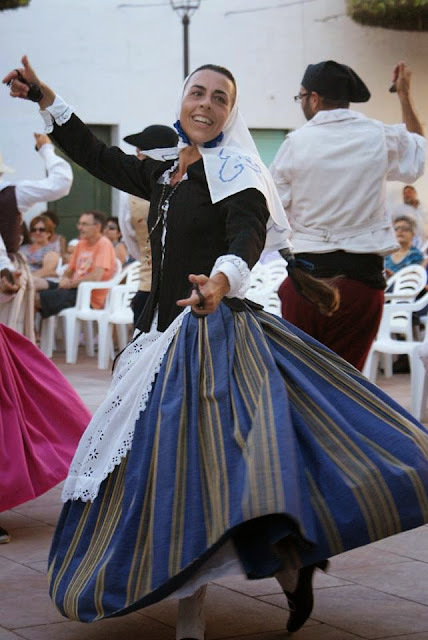 Another video of Ibiza dance. 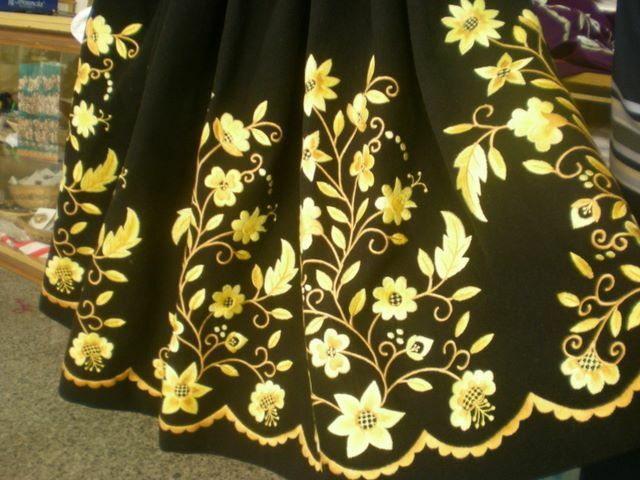 One cannot see the dance well because of the crappy camerawork, but there are good quality closeups of costume details. 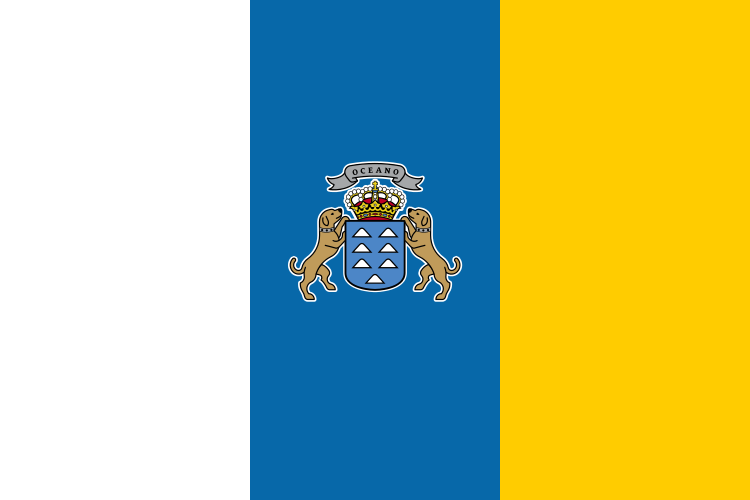 The name comes originally from Latin and means the islands of the dogs. 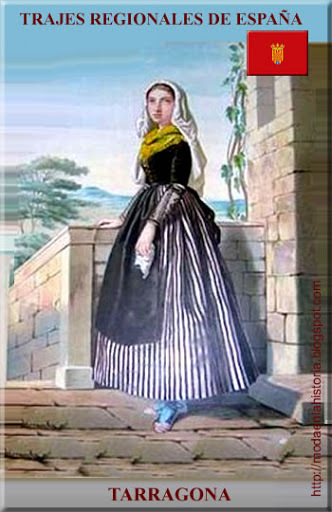 This is also the original home of the bird called the canary. 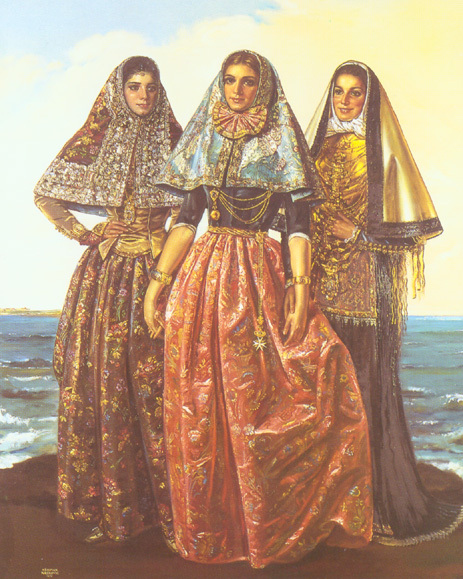 It was named after the islands. 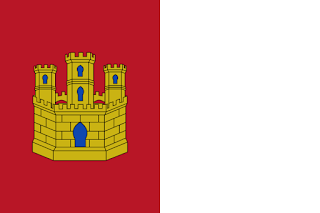 The islands are located off the coast of Morocco and the Spanish Sahara. 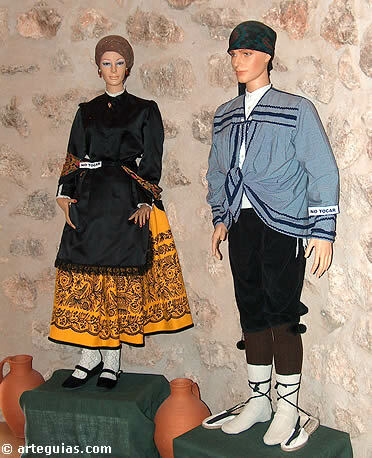 The original inhabitants were called Guanches, and were probably of Berber stock. 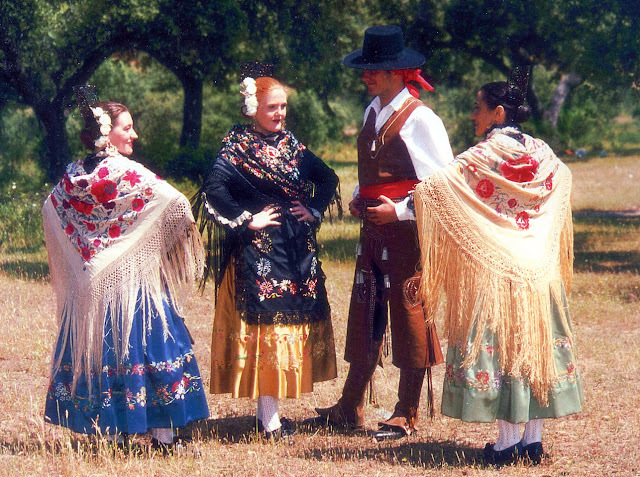 Little remains of the original language, and the current inhabitants speak a dialect of Castillian, which came with colonists from Spain who assimilated the indigenous people. 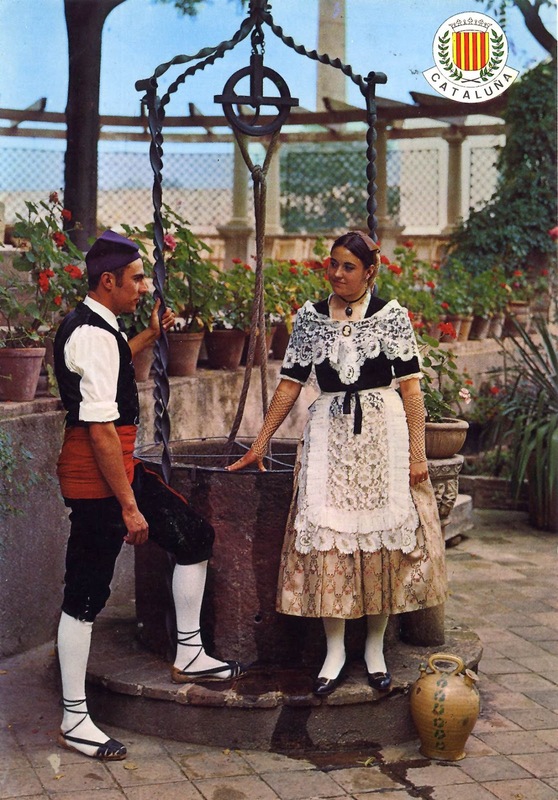 On the island of la Gomera, there is still a whistled language which came from the original inhabitants. 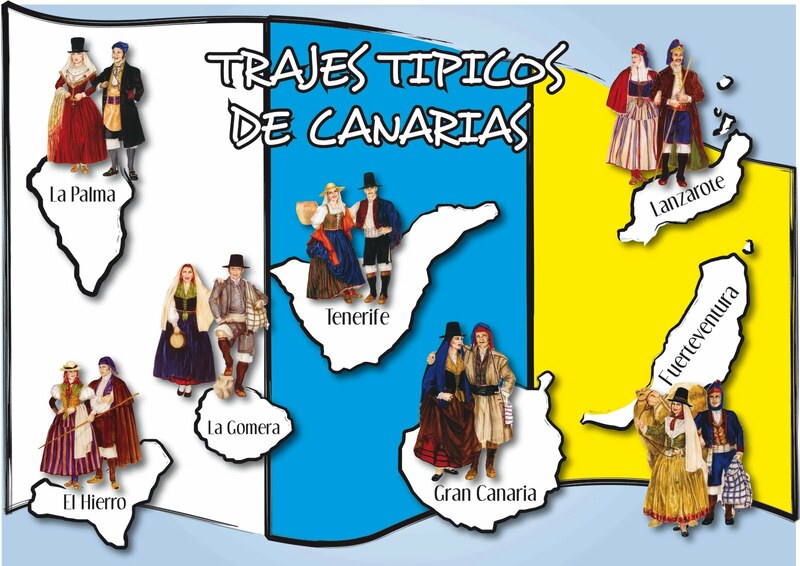 There are seven main islands which are grouped into two provinces. The eastern group forms the province of Las Palmas, and consists of the islands of Lanzarote, Fuerteventura, and Gran Canaria, and the western group forms the province of Santa Cruz de Tenerife, and consists of the islands of La Palma, El Hierro, La Gomera and Tenerife. 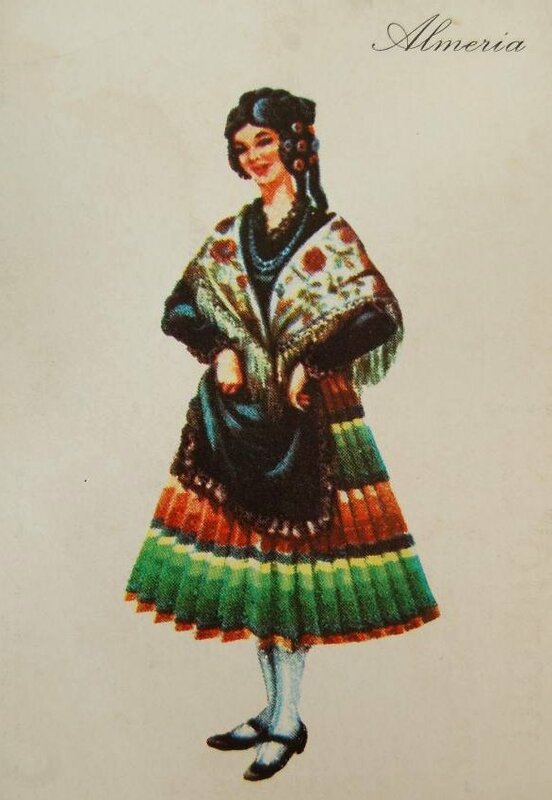 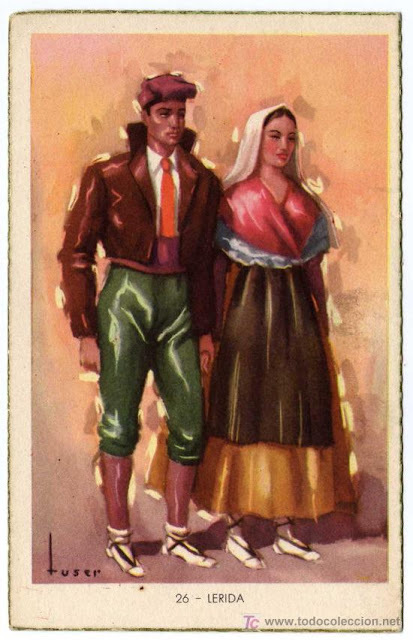 This costume was designed in 1934 by the artist Néstor Martín Fernandez de La Torre. 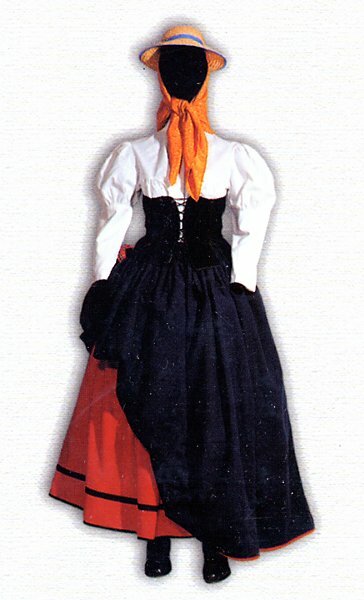 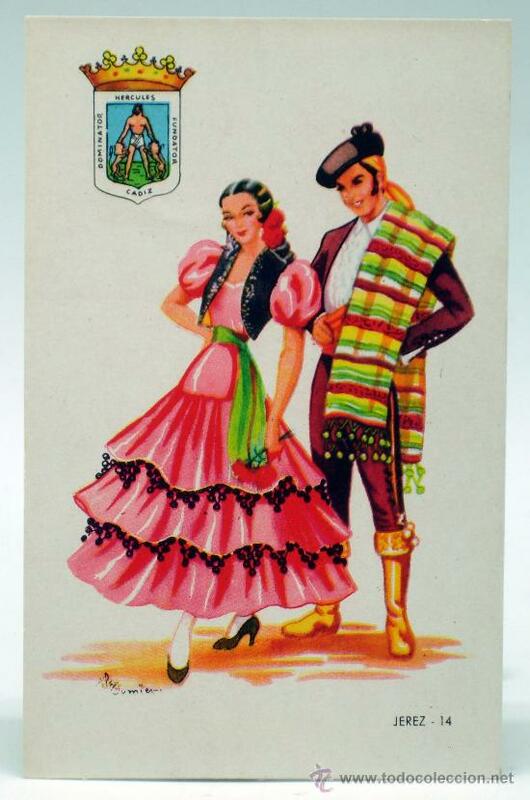 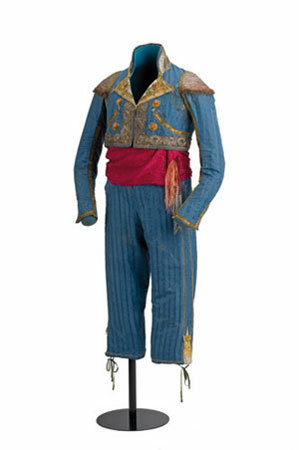 This is an artistic version of the costume of Gran Canaria, with much embroidery and needlework. 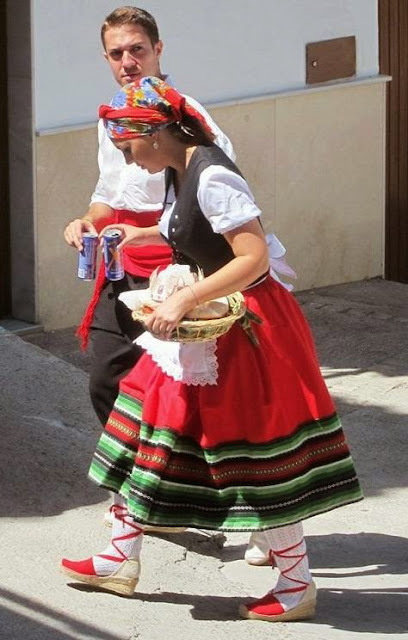 It has been embraced by the inhabitants of the Canary Islands as an expression of their identity. 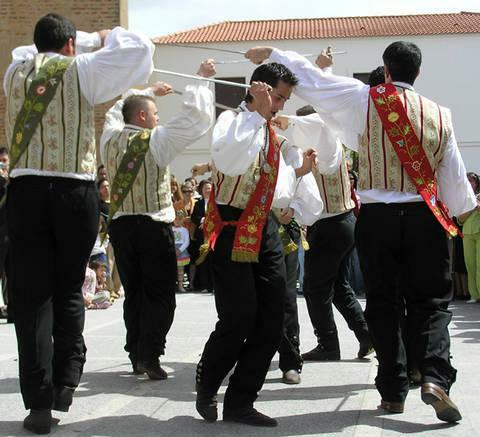 Dance from the Canaries in the Nestor costume. 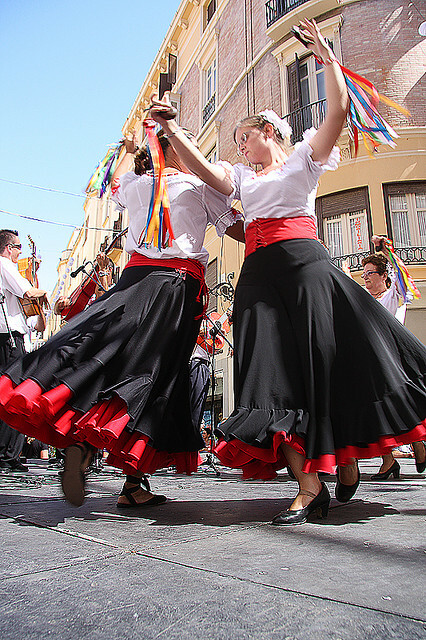 A dance from Gran Canaria. 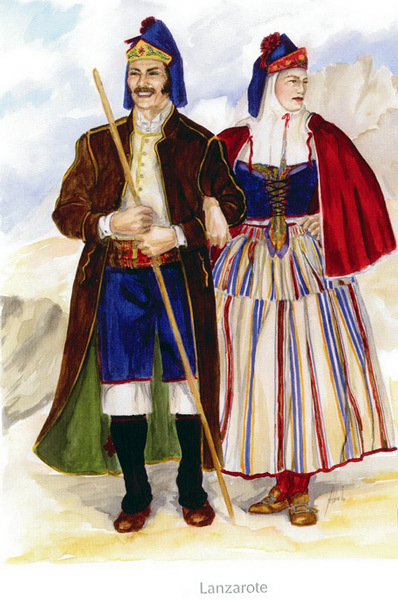 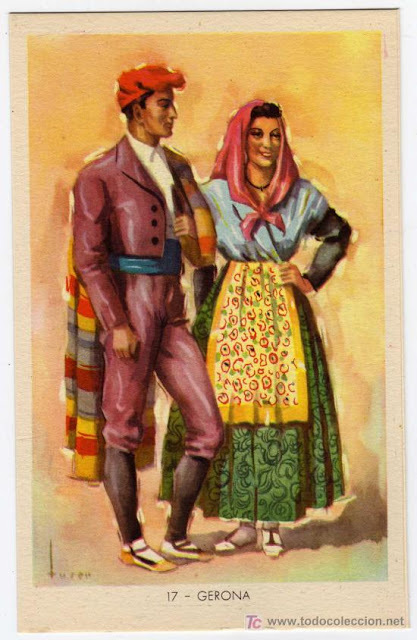 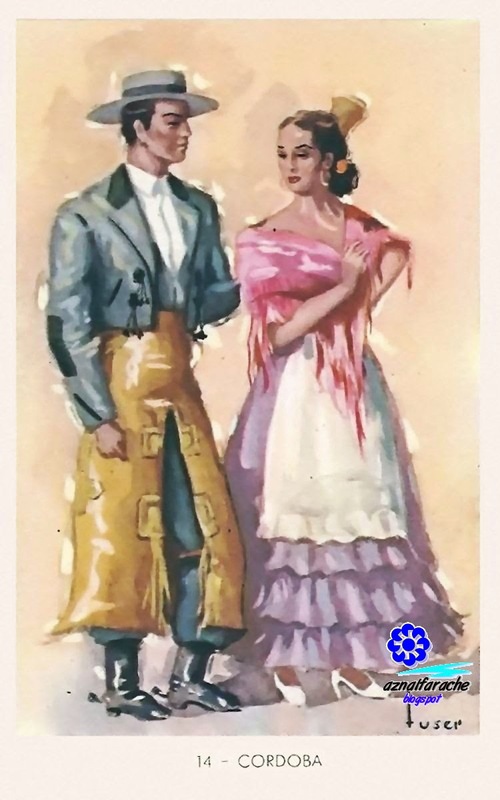 This is a more recent interpretation of the costume of Fuertaventura, and is now widely worn on that island. Some say that it was designed by Nestor as well. 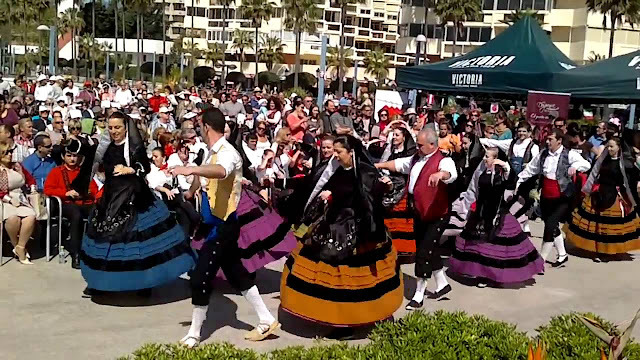 Music and dance from Fuertaventura. 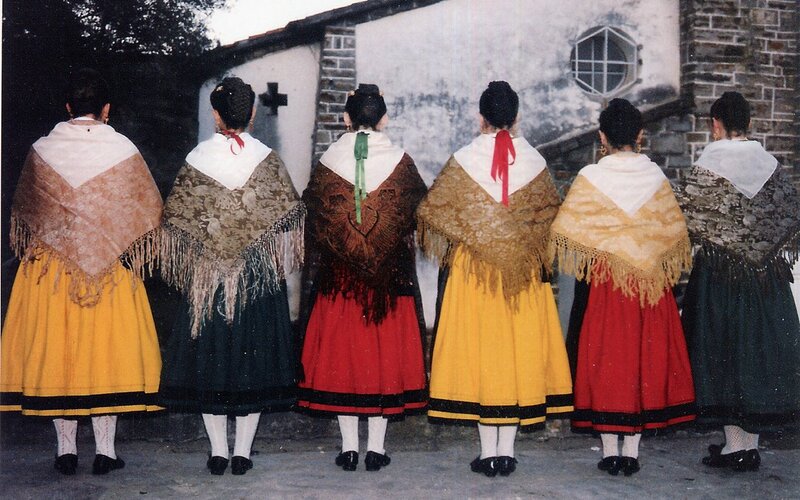 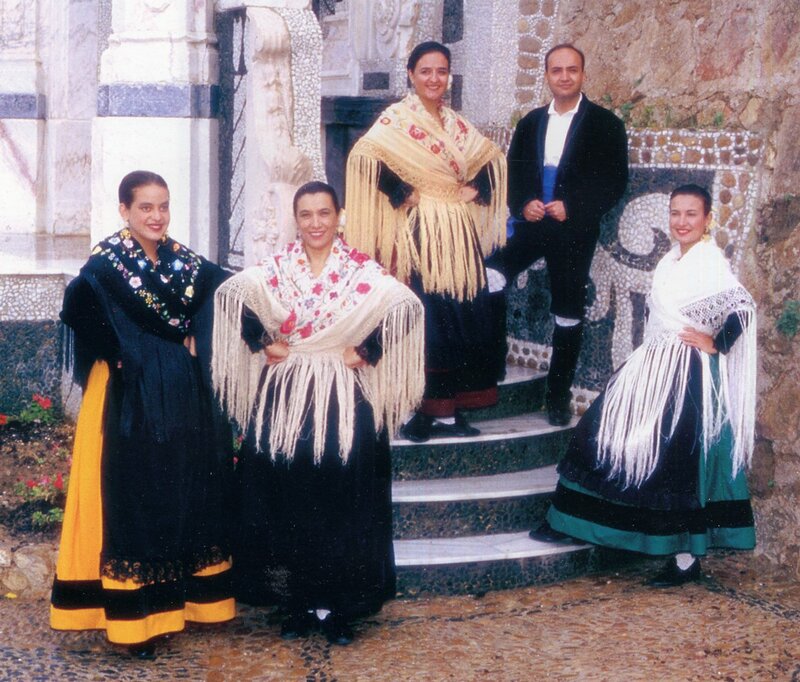 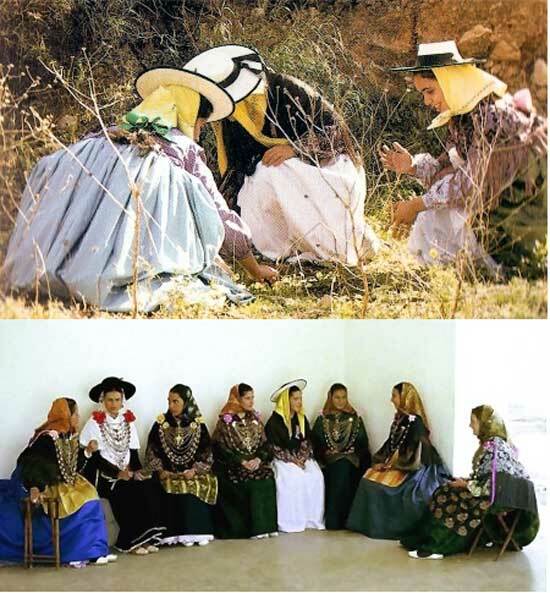 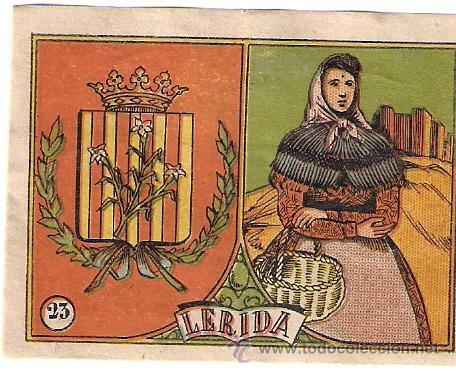 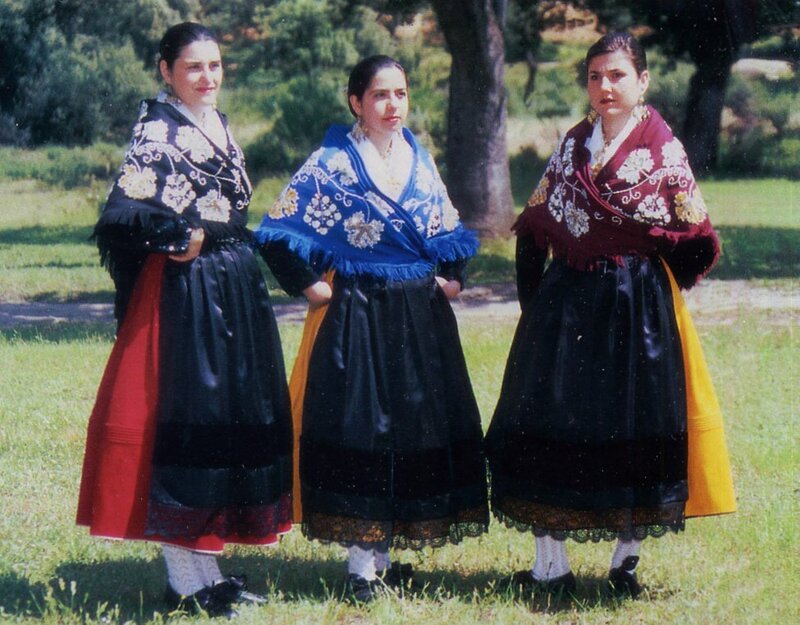 A distinctive feature of the costume of el Hierro are the oversleeves which the women wear on their forearms. El Vivo, a dance game from el Hierro. 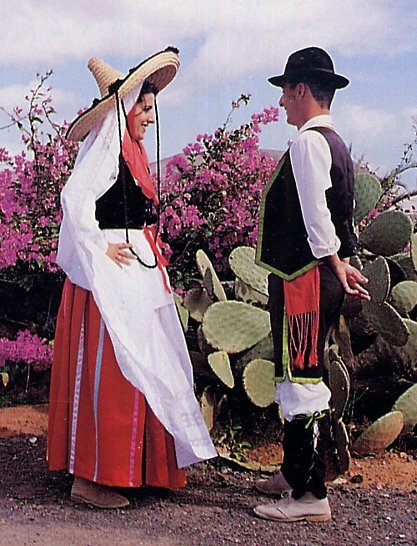 Another dance from el Hierro. 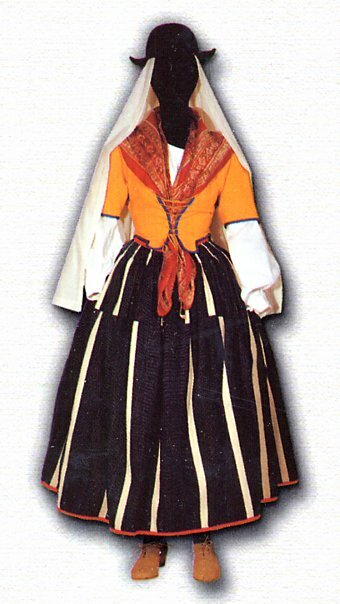 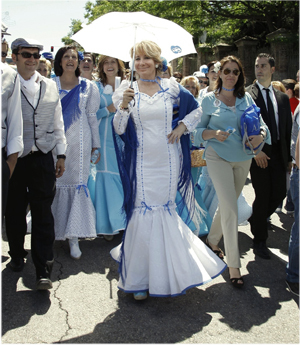 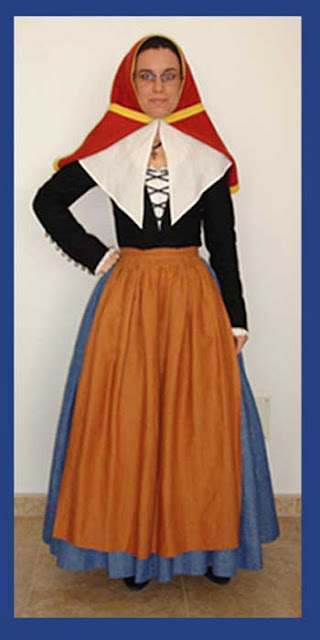 The best known costume of this island features the blue skirt. 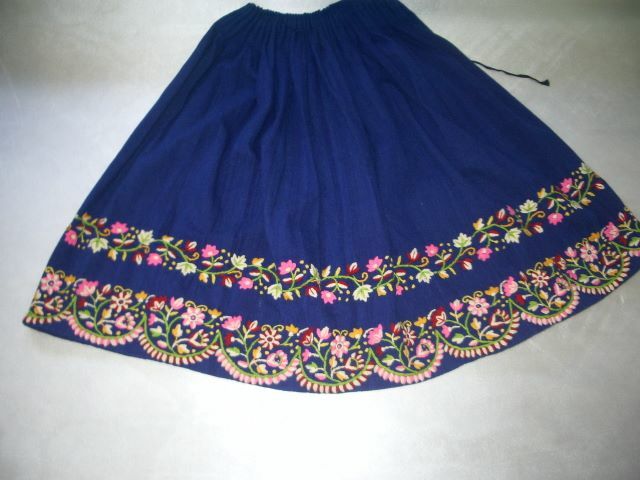 More recently these are adorned with white floral embroidery. 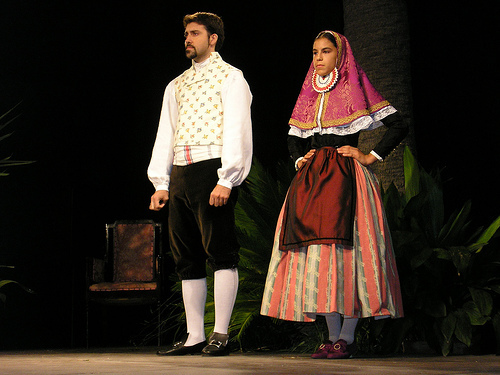 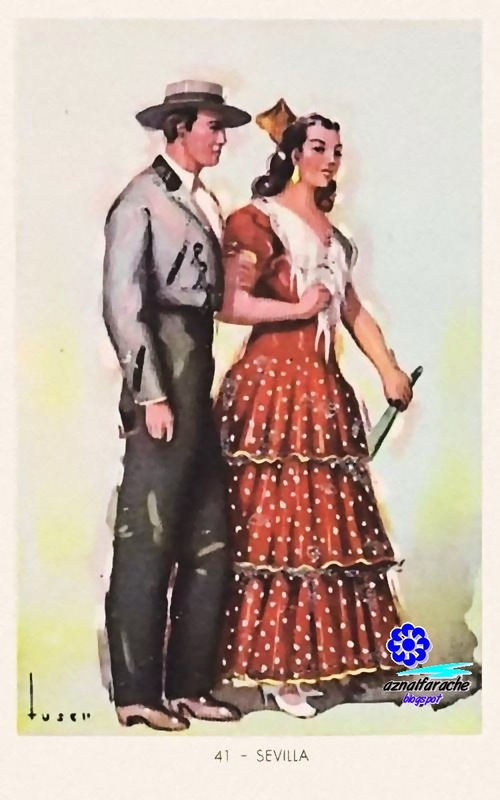 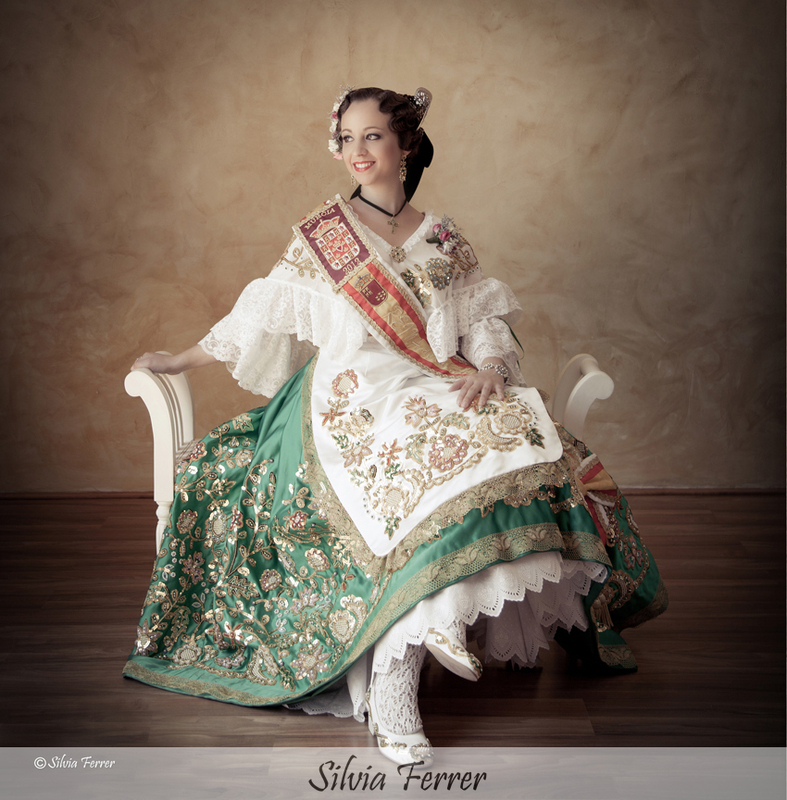 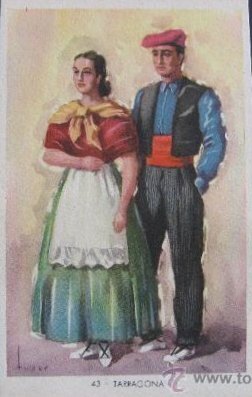 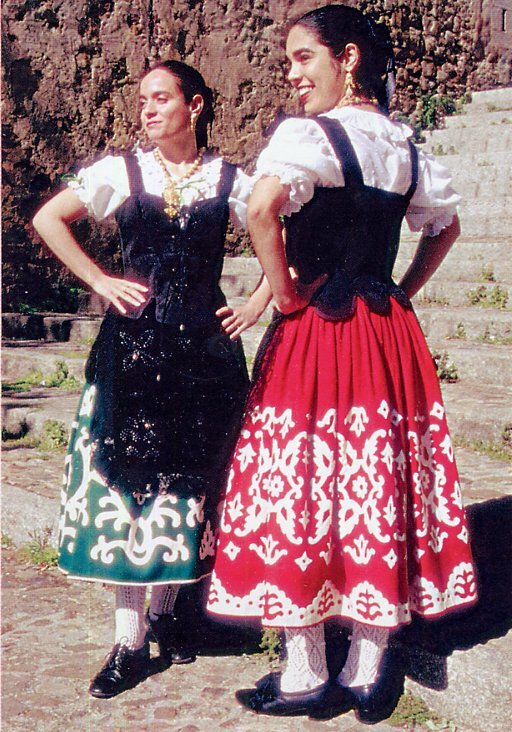 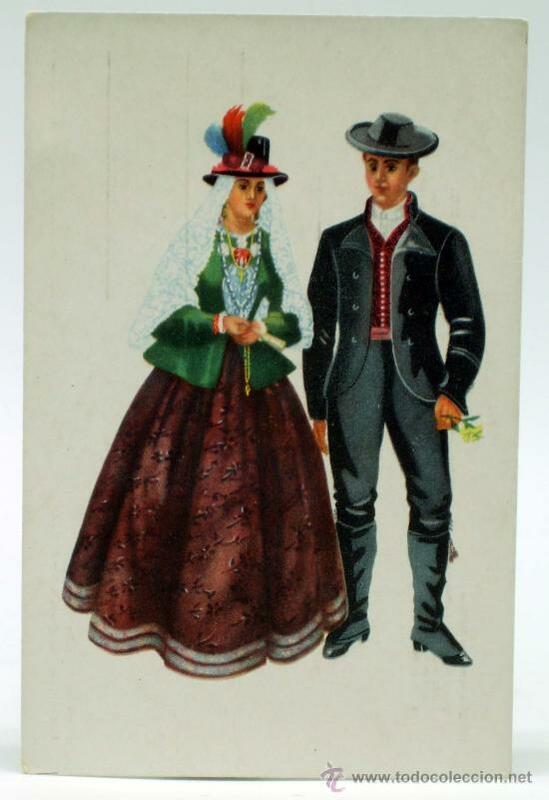 The best known costume of La Palma features black cross stitch embroidery on the petticoats for the women and on the shirts for the men. 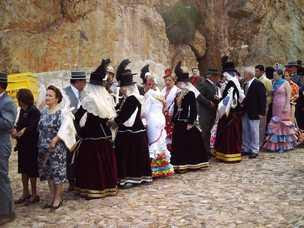 A dance from La Palma, La Caringa. 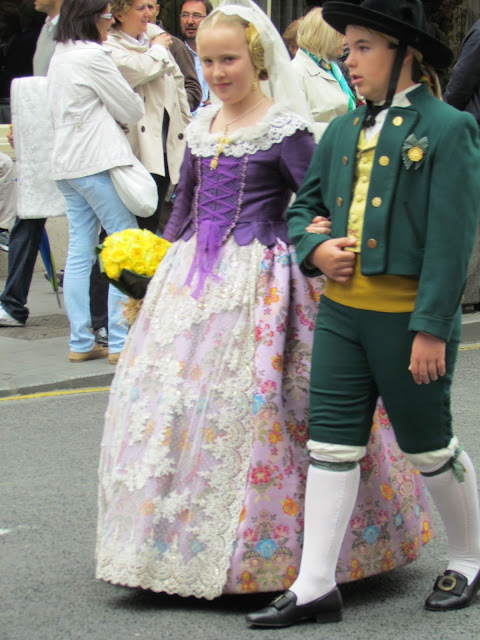 The women have their petticoats tucked up. 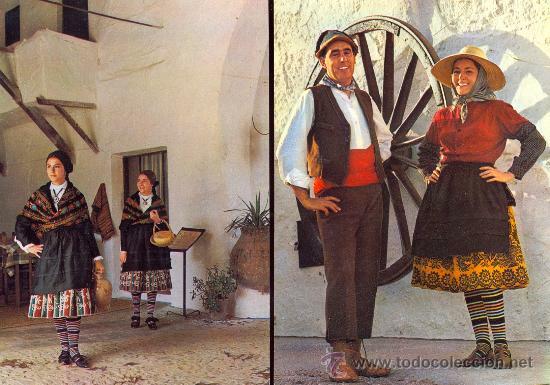 Video; how to put on the costume of Tenerife. 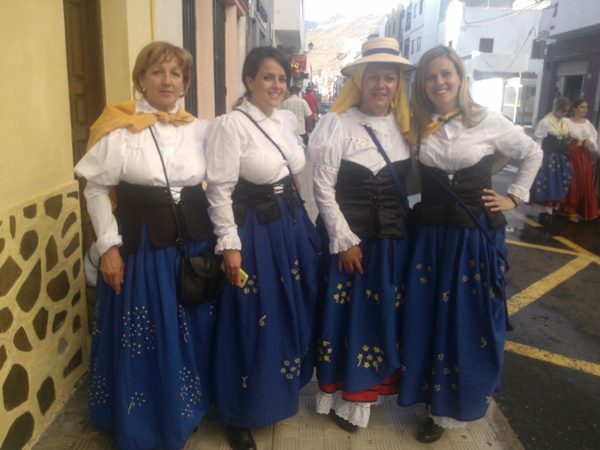 Here is a video of singing and dancing on Tenerife. 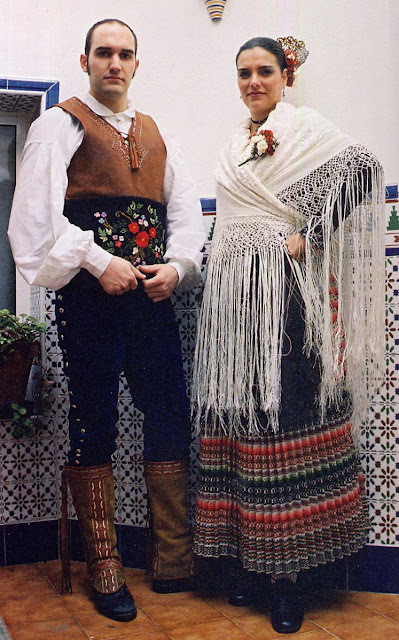 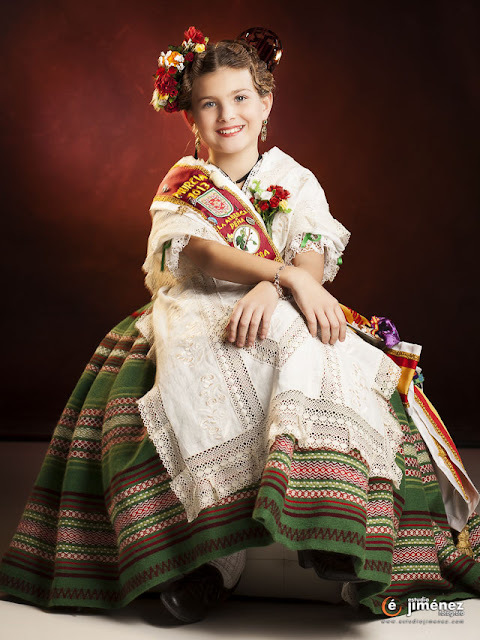 The costumes of Spain are amazingly rich and diverse. This ended up being much longer than i had anticipated.